Looking to decorate your home and need guidance? 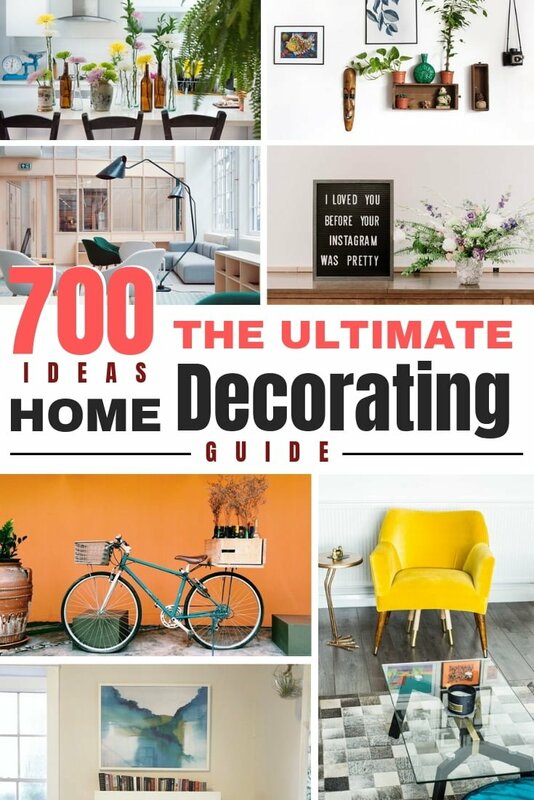 Here is the ultimate list of 700 home decor ideas that will cover all your home decorating needs in 2019. Decorating your home is no easy feat. There are lots of books, magazines, TV shows and websites dedicated to it. And there are just as many designers and amateur decorators ready to offer you advice. But getting your head around the concept of home decor isn’t easy by any means. The more tips you get, the more complicated it seems. And where do you start at all? Here at HomeISD, we’ve been offering our advice and ideas for stylish home decor for several years. It’s been a fun ride and we’ve published quite a few popular articles on the subject. Finally, we’ve decided to put it all together in one epic guide. What we’ve got as a result is an amazing source for home decor ideas, inspiration, tips and advice that you can turn to for reference and all your decorating needs. So here they are, 700 home decor ideas and counting – they took years to collect. Please use the table of contents and make use of these ideas. It doesn’t matter if you’ve just bought a new house or an apartment, or you’ve started renting one for yourself, the first things you have to do in a new place make it your own by decorating. And if it’s the first time you’re going to decorate a home, you will need a little help. 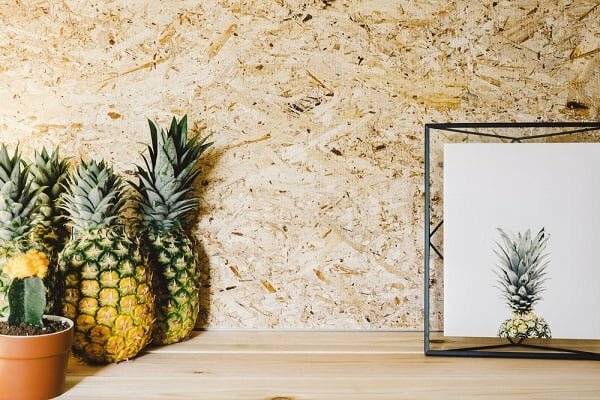 Here’s our list of top home decor essentials for the guys and girls that are about to decorate their own place for the first time. Wall art is essential in making the space more personal and filling up those empty walls, but you don’t need to splurge on it, to begin with. Shop for inexpensive art and pay attention to the way it will work in the color scheme of the room. Most importantly, choose art that you like. Don’t go with cheap curtains, but choose them in neutral hues (they can be in patterns) that will work with any decor piece that you’ll add over time to the room. 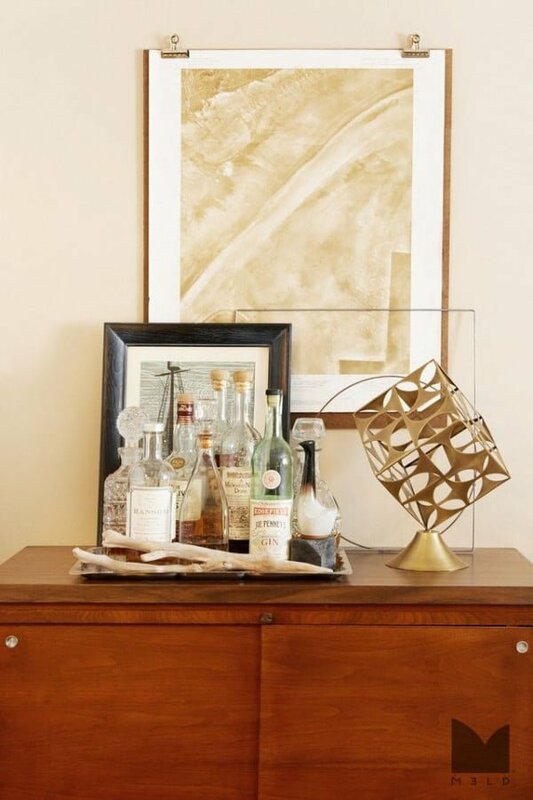 Getting barware is essential not only for entertaining guests, it works well as part of vignettes when unused. For example, crystal barware adds a luxurious touch to the room’s decor. The choice of towels is an essential part to bathroom decor so getting sets of towels in your favorite patterns will provide you with a powerful decorating tool. Do you want your bed making to take a few seconds rather than several minutes? Avoid flat sheets, blankets, and throws and choose fitted sheets and duvets with covers and it will be as simple as pulling the duvet and puffing the pillows. Surprisingly, chairs can be quite expensive and you always need extra seating. The solution is getting relatively cheap poufs that are compact, comfortable and cute. Not only they provide the seating, but they also add to the home decor and they can easily be stored under a table (even a coffee table). If throw pillows are the best at the aesthetic decor, trays are the best at functional. From vignettes to arranging accessories, from catch-it-alls to bar carts, they have so many uses in any room that you must have a few always around. You need unique accent decor pieces to make your home more personal and original. Look through your belongings to find something personal that you can display, or shop for unique vintage items in thrift stores and online. They’re so perfect to solve storage problems it’s no wonder they’re so loved by designers. Baskets come in many shapes, colors and patterns so it’s a no-brainer to match them to your decor. A rug is truly essential that brings the room together and it’s very versatile in that it’s easy to add and remove. Choose a pattern and color that will go with your decor style and most importantly, that you will like. A small surface in the entryway to collect all necessities (such as keys) and which you can decorate to make our home more welcoming. This can be a suspended shelf or a small cabinet, whatever way you choose to implement it, you would do well to add it to your home. Do you think your home has enough lighting? Chances are you are used to your home and what it may be lacking. If a room has only recessed lighting and there are lots of shadows cast by various objects, you probably need more lighting. You can add it with floor and table lamps or sconces which is very easy to do, and you get an extra decorative benefit. Being able to control the lighting is essential in making your home feel cozy, so it makes a lot of sense to install recessed light dimmers. The control they give you is perfect to layer the lighting too. The benefit of houseplants in home decor is undisputed. If your home has window sills, it’s a no-brainer to put at least one plant on every sill yet it’s so often forgotten. And even if you don’t have the privilege of window sills, you can still place houseplants near the windows where there’s plenty of light. Translucent containers like glass vases, jars, and even bottles are great not only to display fresh flowers. They are essential in home decor because they have a countless number of decorative uses, from storing seashells, small accessories, to creating beautiful vignettes in any room. I am convinced that every home needs this. Your home should make you feel good about yourself, so collect inspirational quotes, prints, and posters to frame them as art and lift your mood up when it needs lifting. 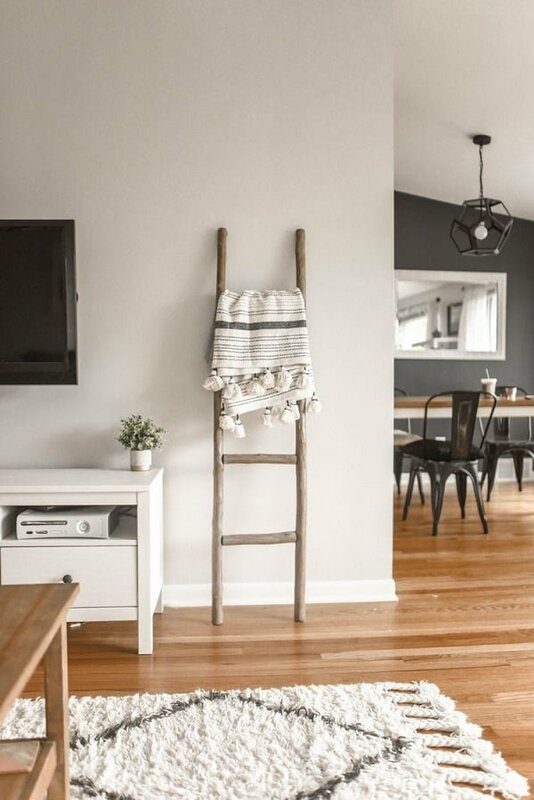 You may or may not have a couple of stools around your home but consider getting more of them as they don’t take a lot of places and are perfect as extra seating. They can be used in just about any room too. Consider the wonderful Chinese garden stools which are so versatile in their design that you can put them just about anywhere and they will work. An eye-catching headboard, especially in absence of an accent wall, is a big bonus in bedroom design. Even if you don’t go fancy and just add a little style, you can put a big checkmark on your list of home decor. You most likely have throw pillows around on a couch or a chair, but the point I’m trying to make here is that you can never have too many of them. Throw pillows can be placed anywhere and they provide an incredible tool to accessorize your home decor and create instant accents. 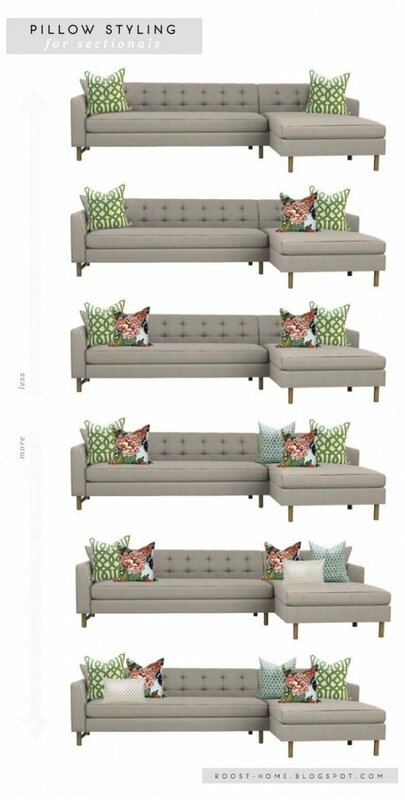 So get many pillows in different styles and you can switch them around for a different look anytime you like. What makes the perfect home decor? It’s a very subjective matter and what looks perfect for one person may be appalling for another. But we all can agree on certain guidelines that do make interior design pleasing to the eye. There are certain rules of thumb that most top interior designers follow and that most homeowners appreciate. Here are the rules that you won’t go wrong following. When it comes to choosing furniture, it can be too small for a room. Even if it’s a small space, it can benefit from bigger furniture. It makes a strong statement and all you have to worry about is not to make it overcrowded, which is a layout issue more than anything. Don’t be afraid to go bigger, it makes a difference. Most rooms we see are very underlit. Lighting is crucial to home decorating so make sure you have at least three light sources in a room. Create layers of light with recessed light, chandeliers, lamps, and sconces to eliminate all those unnecessary shadows. The first thing you have to understand is that you shouldn’t expect to completely decorate your home in one day. Don’t rush into buying things especially if you’re on a budget. Carefully choose furniture and accessories for your room and live for a while with them to make sure it makes you happy and it’s functional as intended. Each piece has to live into your home and your interior design will grow over time. Don’t cut corners by getting all pieces in a furniture set. Your home decor should be unique and have a character which evolves over time, it shouldn’t look like something you did overnight. Each piece you buy should be evaluated and blended in the rest of the decor and look natural. Following a theme is a good idea as long as you don’t go overboard with it. You can choose a nautical color scheme, for example, but when it’s all blue and white stripes with rope knot pillows to boot, your room starts looking like a strange theme park. Avoid that and keep the theme subtle. If you paint white, you have to choose the right color, and there are thousands of whites to choose from. 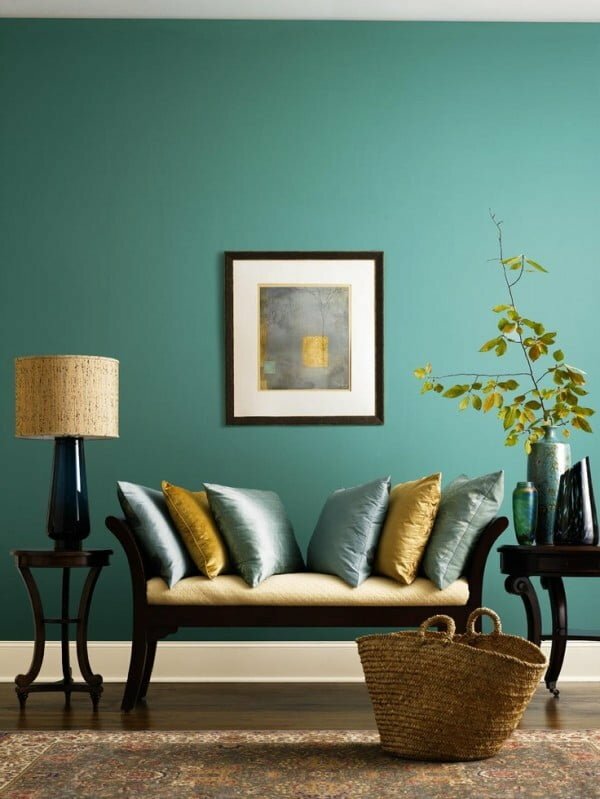 Paint a swatch with a select color and go around the room to see how it looks in different places and lighting. It’s great if your walls have beautiful moldings but don’t paint the walls in an accent color to emphasize cheap window and door frames. Understand the best qualities of your room and emphasize them while hiding the weak points. When decorating, start with an empty room and go from there. Even if it’s not empty follow the same path as if it was. First, choose the wall colors, windows, light fixtures, then start adding big furniture and move on to smaller things. Try to always start with big things and move on to smaller, building the room bit by bit. There’s good home decor and there’s great decor. What makes it great is that it surprises with accents that throws the look a little bit off. So add accents like a rustic TV board, or leather furniture in the bathroom to make your interior design great. Avoid making your decor bleak in neutral colors. Yes, a neutral scheme is safe and non-committing but even if you just use accent color throw pillows, add color as much as you can. Vignettes create a character out of personal items. But don’t make a mistake of putting all your personal belongings on display on the shelves, group them in vignettes by carefully choosing what you want to show off and putting away the rest. Remember that you can and should change them up from time to time. A room has a lot of sharp edges so try to add elements with rounded corners, such as this rounded corner shelf, round rugs or round furniture like a coffee table or an ottoman. Houseplants in the corners work too. Don’t just prop pillows side by side – layer them. Use different pairs of pillows with different designs and textures, and put one in front of the other. If you have an intricate rug that threatens to overcome the floor, consider putting it on top of a larger rug with a solid color that is in the same color family as the smaller rug. This single color will help tame the busy patterns and add a nice finish to the floor. Think about your home decor as a whole. It’s not likely that you’ll love every feature, color, piece of furniture, and while you should try to fill your home with things you love, the big picture is all that matters in the end. Make a plan and stick to it. It doesn’t mean you can’t deviate from the plan as you go but a general sense of direction is always necessary to keep you on the track. Short on ideas for colors and patterns? Use your clothing style to get inspired. After all, you have your own dressing style that you like to follow, your home should reflect that in every detail too. A popular (for a good reason) layout for the living room is to create a conversation area by pulling furniture away from the walls to a group around a coffee table. It solves two problems in one go – preventing the boxed out feel that furniture pushed against the walls gives, and making a functional setup to entertain your guests. Rules are there to be useful, to help you decorate your home in an aesthetic way. But that doesn’t mean you have to follow every rule in the book to the point. If we all did that, we’d all have homes that are identical. In fact, making your home personal is just as important as its look. So you should break some rules to create something unique, something that describes you. And here are top 20 rules you can look forward to break when decorating your home. Furniture finish doesn’t have to be completely matching as if you’re bought everything at once. You can have some variety just as long as you make sure to balance it out. Let the furniture arrangement flow and allow some freedom for character. Let the guests choose themselves where the chairs should stand. The walls don’t need to necessarily have a unique pattern, it can be extended to different surfaces around the room. Small furniture saves space but you don’t have to frame a small room as a tiny doll house. A well chosen and placed bigger furniture will actually be more functional and make the room look bigger. So you have an art piece of a specific pattern as the accent, but you can mix several if you find balance between sizes and spacing. Your home decor doesn’t have to be all modern Scandinavian or classic traditional, you can mix and match styles to get a unique combination. Having different metals or metal patterns for light fixtures, furniture and wall decor can actually work very well together as long as they’re balanced out. 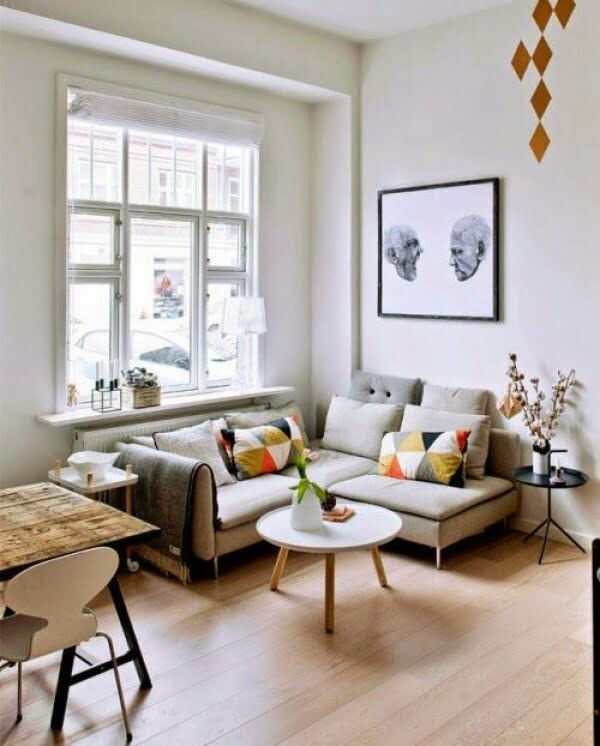 Have chairs instead and it opens up the space and allows you to break the traditional living room layout frame. You don’t have to buy furniture in sets. Just because you’ve bought a sofa, you don’t have to buy a matching coffee table and chairs. Mix and match furniture for your individual decor that looks like it took time to arrange. While bright colors open up space and make it look bigger, you don’t have to necessarily limit yourself to just light schemes. A dark room can have a great character. Besides light colors, the conventional decor rules say that you should play it safe in small spaces. Break the rule and don’t be afraid to experiment and add drama with patterns and color explosion. While rugs anchor the room decor and add softness, a bare floor keeps the space open and makes it look bigger. So don’t take the necessity of a rug too seriously. Sofa and coffee table is the classic living room arrangement. However, an ottoman and a tray is the most flexible alternative you can have. While vintage furniture and other pieces have most charm in their original colors, don’t be afraid to paint them in a color of your choice. You don’t have to have all chairs at the dining table identical. Mixing and matching adds a unique character. In fact, it can be the cheapest as long as it has character. The rule says that artwork should be hung on the wall at the eye level in the visual center. But sometimes it makes sense to have it lower or higher. That ugly duct can actually work to your advantage as an accent. No, it doesn’t necessarily have to be white. In this case the walls look lower but it really opens up the ceiling. Don’t beat yourself over an extra throw pillow on the couch, it can definitely work. Not all home decor projects have to take a lot of thought, planning and time. Sometimes you can make quick and small changes that take no more than 24 hours but they have a meaningful impact. So if you have a day off work and you feel like prettifying your home, you’ll need a few ideas to try something new. 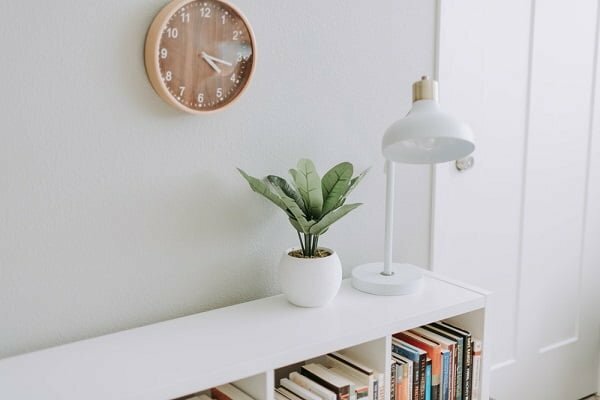 We’ve made a list of quick and easy ways how you can revamp your home decor overnight. Make your free time at home count. Retire the drapes and let more light into your home. Sheers come in color too and you can dress up the windows while obstructing as little light as possible. With spring already here and the weather getting warmer, you’ll want to gather your guests outside, so make sure you have enough seating. Chinese garden stools make very versatile seating and can be used anywhere inside your house as well as outside. A new season requires fresh seasonal decorating. Bringing fresh flowers or blossoming branches to your home will help you with that. Bring a side table to the bathroom and move the nightstand to the living room. Switch pictures between rooms, or just change around the frames. Small switches like these can bring a completely different look to your home decor. Try moving the chairs or the couch away from the walls, even if just a few inches. Experiment with a slightly different layout and flow – it makes a difference. Over time your home gets cluttered as you bring new things home. Get rid of something you haven’t been using for a while to free up the room and open the space up. A new rug is one of the most impactful decor pieces and it’s very easy to add or replace. Try a new, perhaps fancy, pattern to bring a room together in a different way. It’s a fair guess to make that your home is missing some layered lighting. Get a new table lamp to add a new layer and improve the decor. Get some new attractive baskets, especially if you down own any yet. They will help you hide the clutter and organize with the aesthetic home decor in mind. 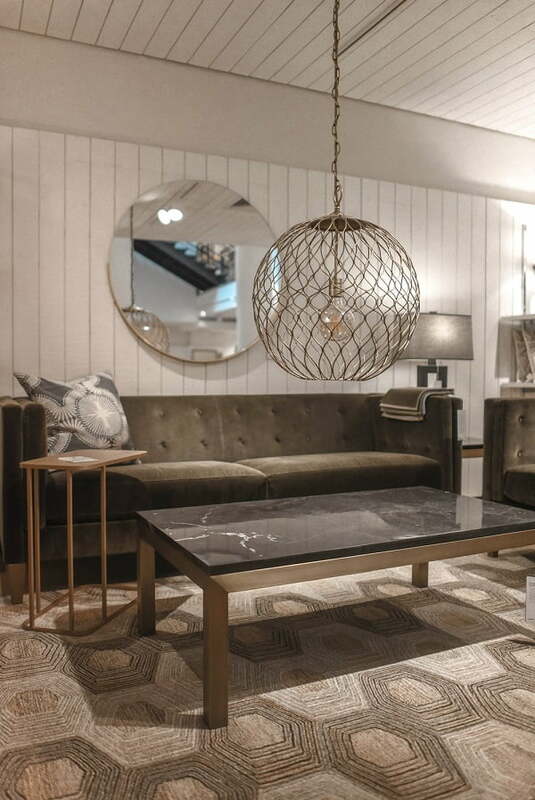 Be it a coffee table or a dining table, create a new vignette or a centerpiece for a fresh look. It may be the time to refresh your bedding, so experiment with different and new patterns and colors. 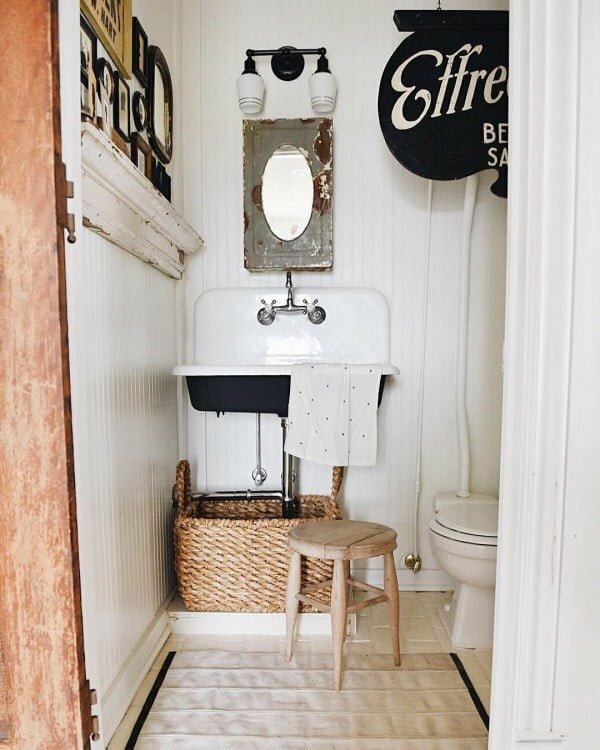 Antique vintage touches make great accents, so try one in the bathroom this time. It can be a mirror frame, a lamp, or even a soap dispenser, whatever it is, experiment with the vintage look. Do you own any beautiful plates? 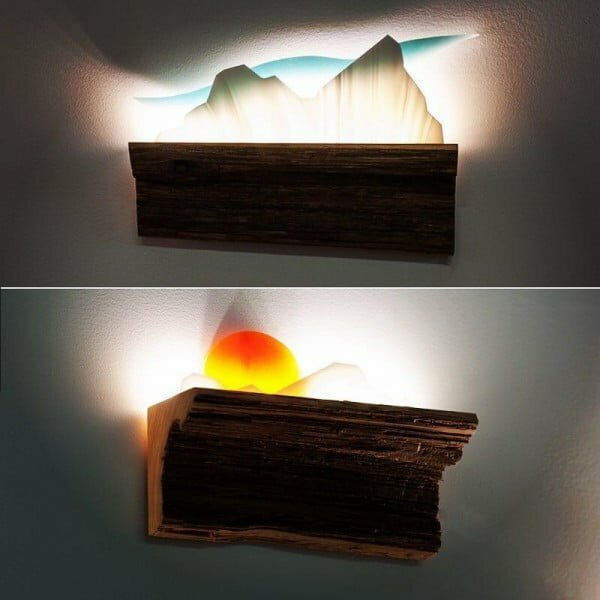 Why not hang them for display on a wall? Check out your local thrift store for some beautiful finds too. 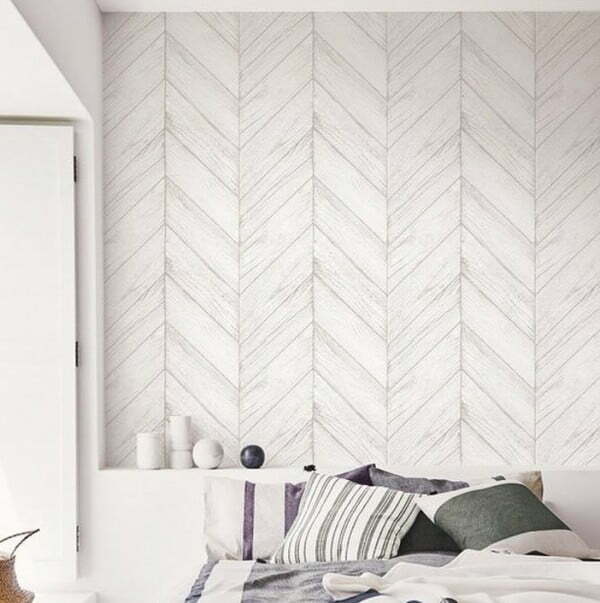 While wallpaper is committing and takes planning as well as a lot of time to do, experimenting with fragments of it is a quick and easy way to add pattern to your decor. Try framing a patch of wallpaper, or add a fragment on a wall behind a mirror. 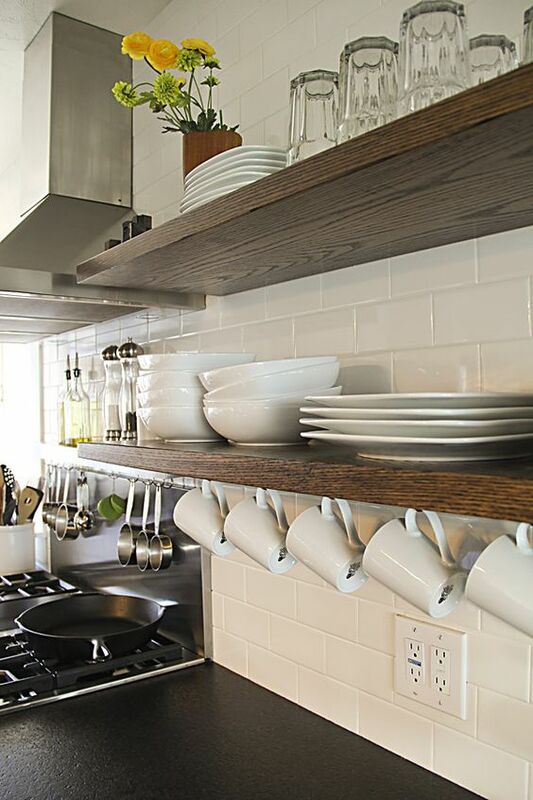 If you have open shelves in the kitchen or any other room, make use of them to add pops of color for an accent. Open shelves are great in making space look bigger or creating displays, but make sure you make them noticeable by adding flowers, bright color mugs, and dishes. The brass finish makes a classy accent on its own, but it’s especially effective when used as a mirror frame. One of the keys to classy decor is subtlety and sophistication. So don’t make different decor pieces fight from attention, choose one clear focal point and decorate around it. It can be a chandelier, a piece of furniture or wall art, whatever it is make sure you feature it. Clutter breaks the classy spell so you have to make sure to put things away and keep the place tidy as much as possible. Choose storage baskets, chest, and boxes that have a metallic finish or vintage look. A lacquered tray can be a great choice as a catch-all for useful small things. Go wireless whenever possible and hide the cords away by building hidden charging stations in drawers, or using wall art to hide TV cords. 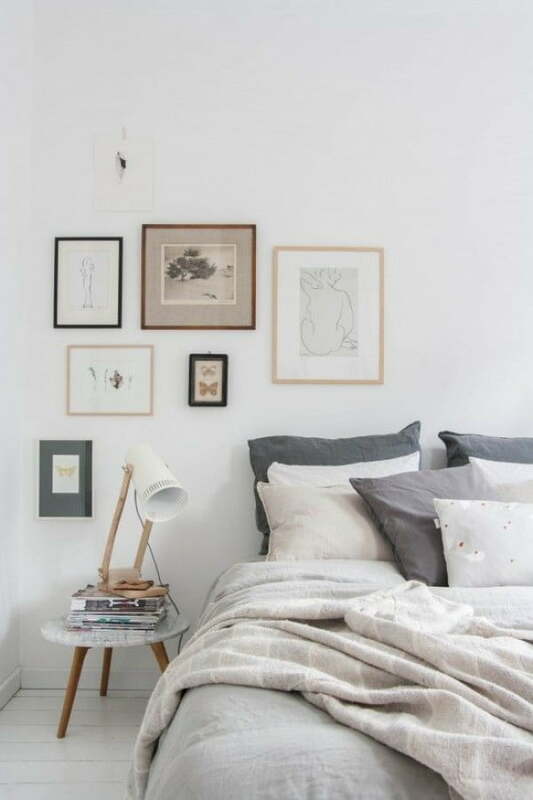 Knit blankets and laces in neutral colors, such as white or light gray, add a classy touch to the bedroom. 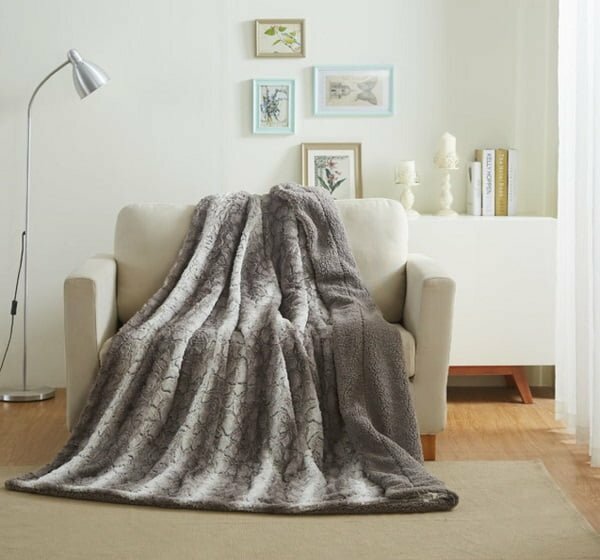 A single faux fur throw blanket or a rug will have a warm but classy effect. Just adding a throw pillow with a mild touch of glitter can have a classy accent. Having some vintage accessories is sure to add the class so long as you don’t go overboard with it. The use of crystal glass, especially crystal vases, creates sophistication. Black and white are classic and naturally classy. Even if the pattern is used just for an accent. In classy decor, vignettes aren’t just small decorative arrangements, you have to start looking at the entire room decor as a vignette. But of course, don’t forget small vignettes too. You should hang curtains higher above the window anyways, but it especially adds to the classy decor. Use old jewelry to tie back the curtains. While you have to be careful with wall art to keep the decor classy and sophisticated, some art deco elements can have a wonderful effect. Don’t leave the floor empty, add a rug in neutral colors and patterns. 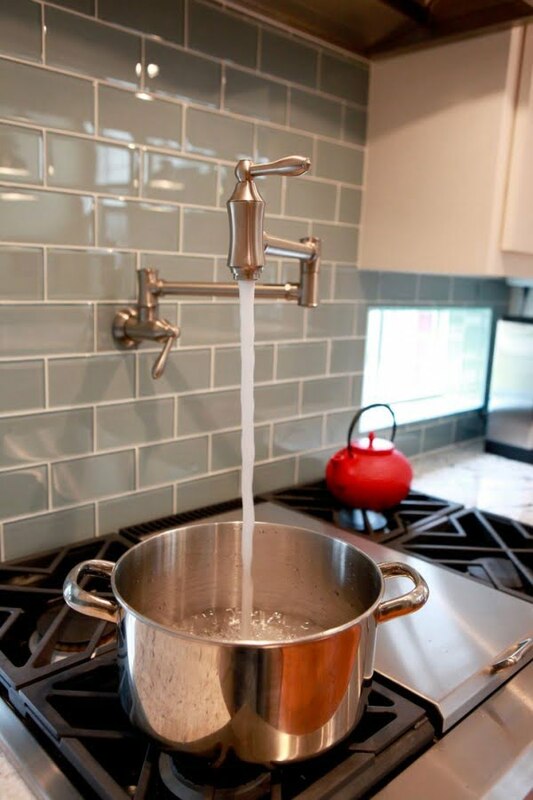 Brass elements are modern but classy, such as a brass faucet in the kitchen. One of the easiest and yet most explicit ways to make the room just a little bit classier. Random book bundles on tables add an element of sophistication to home decor. 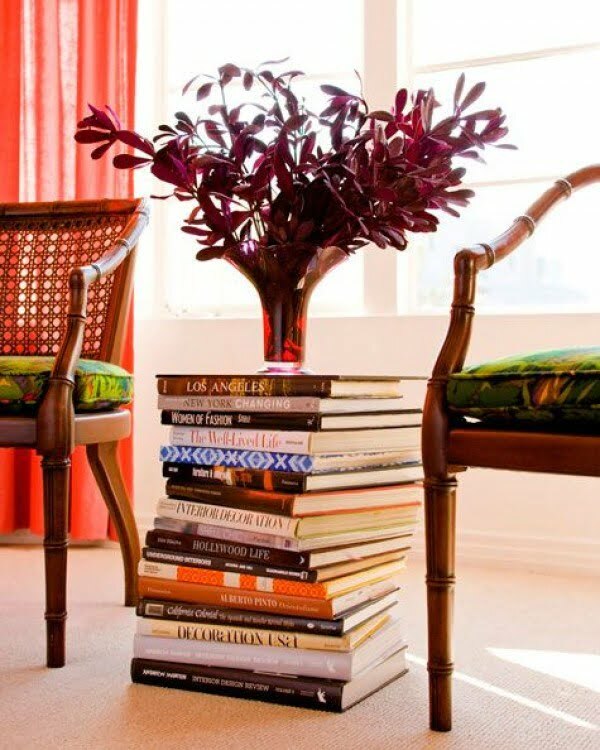 You can argue if it’s classy to use a stack of books as a small table, but I really like this idea nonetheless. It’s amazing what a little paint spray can do to your things and their value to home decor. Having it handy at your home can quickly transform cheap stuff into high quality expensive looking decor elements. And there are so many things you can do with it. Applying golden or metallic paint will create luxe accents, while black spray paint will refurbish old furniture, and that’s far from all the options you have. Take fabric spray paint and that’s where things get really interesting. So check out these ideas and get yourself a couple of cans of spray paint. Have old or boring furniture? Time to get the spray can ready. 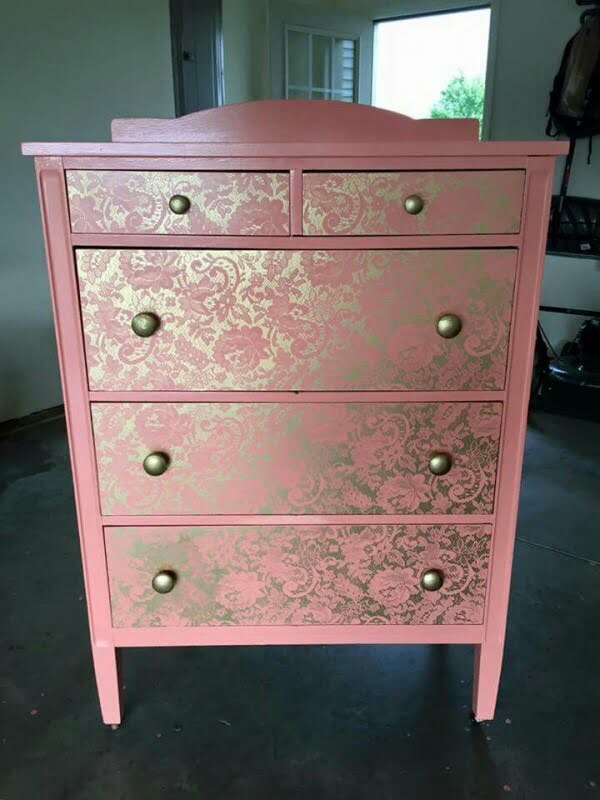 Yes, you can spray paint the furniture to give it color and new life but here’s another idea. Cover it with laces and paint spray over it for amazing patterns. Spray paint bottles and vases for a striking accent. If you have some old shade lamps, a quick and easy way to refurbish them is applying spray paint, metallic again looks good. Baskets make great accents and help unclutter your storage spaces, but getting them in the right color is not always easy. You know what to do. Gold sprayed plants make wonderful festive decorations. Fabric spray paint allows you to change color or apply pattern to your furniture easily. Make your furniture glossy with metallic or glossy spray paint and it will look expensive and luxurious. Here’s an example of creatively spray painted candles, but you can do that to countless accessories for a wide range of accents. Whether you frame pictures or create art like this, it’s extremely easy to change the color of a frame with spray paint. There are certain eyesores in home decor that are hard to hide because they need to be there, such as heaters, power sockets, light switches and so on. Guess what, you can make them blend in to your decor by spray painting them. 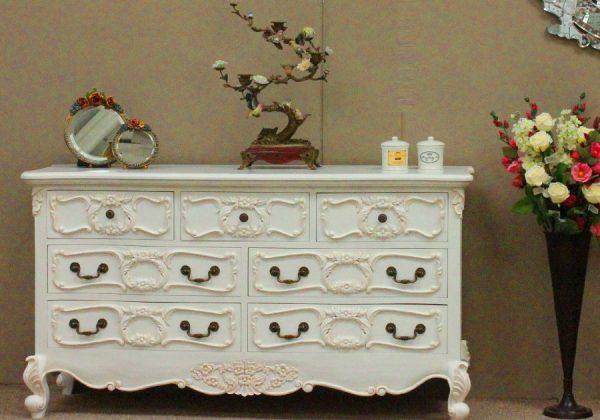 With some effort you can make any furniture look vintage and antique. Hunting for custom colors in kitchen appliances can be time consuming, expensive and down right frustrating. But spray painting default appliances to your liking is easy and refreshing. You don’t have to buy and install a new chandelier just because your old one got worn out and boring. Spray paint faucets in the kitchen and bathroom for a trendy accent. Spray painting old kitchen utensils for decoration is a wonderful idea. A full-size floor mirror simply placed against a wall has a very dramatic effect, especially in a smaller room like a bedroom. You don’t need to drill holes to hang it and you can of course take it with you when you move. Your room windows have ugly blinds? No worries, just hang beautiful curtains over them. Curtains are one of the things you can probably replace in a renter and they can have the biggest impact to the interior design. Hang them high and wide, if you can’t drill holes, use command hooks to hang the curtain rod. Covering entire furniture with a big faux fur blanket or eclectic patterns will turn your living room into a lounge room. It’s a great way to cozy up the place while making a bold statement at the same time. Decorating your home can get rather expensive but if you just want to implement another decor idea, you don’t have to go on a splurge. It doesn’t mean that you have to resort to cheap looking decor either. Some real-life ideas can get you that extra decor touch and cost you next to nothing. This is what our today’s picks are all about. Let’s get decorating by spending almost nothing while still getting the desired result. Stained glass windows make a great decor feature but it’s a rare luxury to have it in your home. As an alternative for a similar effect, collect stained glass bottles and put them on display on window sills. Create table lamps out of glass jugs and string lights. It’s very easy to do and you don’t necessarily have to wait for the holiday season to use them. An accent headboard helps bring bedroom decor together but they can cost a lot. Instead of buying one, use washi tape or some paint to draw one on an empty wall. It’s easy and will get the same result at little to no cost. 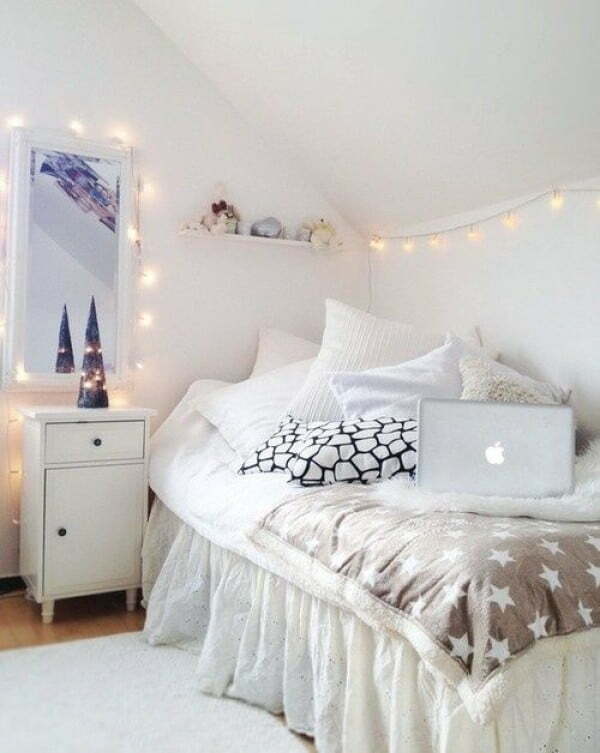 Or if you have beautiful silk scarves, arrange them on the wall over your bed to create a unique headboard. 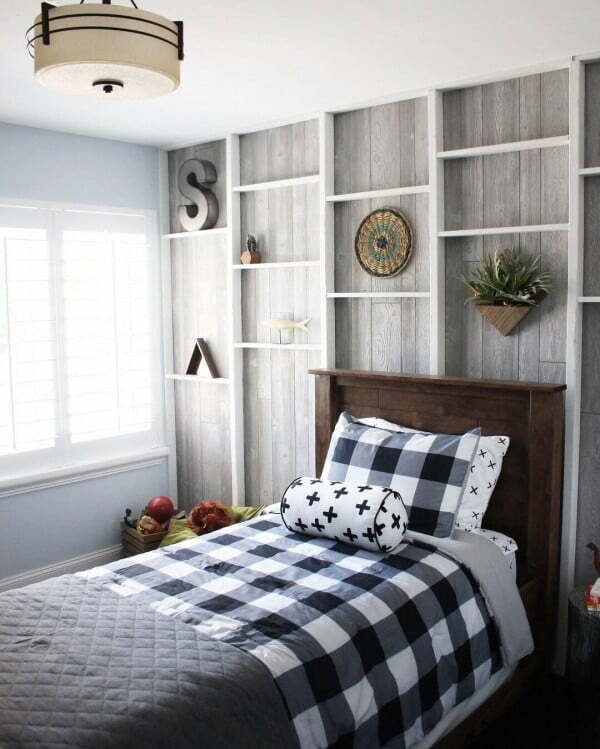 Check out our 15 more ideas on how to build a DIY headboard. 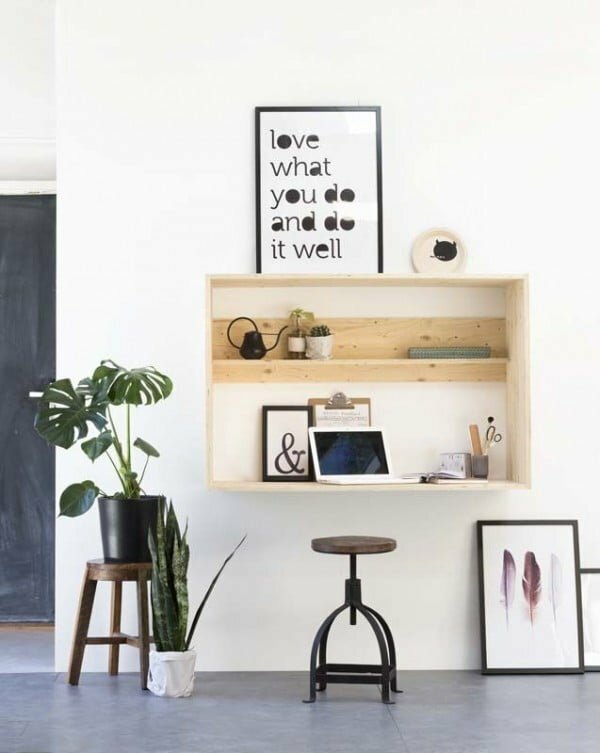 A bulletin board isn’t expensive especially if you DIY, and it can help you stay organized or provide you a flexible space to hang easily switchable art on the wall. Do you have a guitar or another musical instrument, or perhaps a collection of skateboards from your childhood? Use them as art pieces to decorate the walls and make your decor personal. Some paint that you may have left over after the last home makeover can be put to great use by painting just a small part of the wall and create a popping accent. Such as this wonderful chalkboard paint idea. Nightstands can cost a pretty penny but instead of buying one, you can use a chair and get a chic look. Try the combination of a chair and stacked books as an accent vignette. 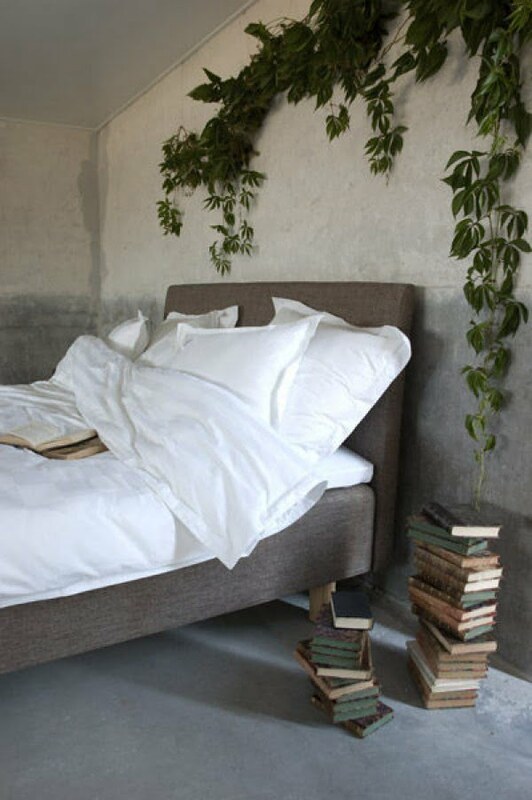 Speaking of stacking books, you can elevate any surface and add an accent at the same time with your books. Use them on nightstands, side tables, coffee tables, chairs, stools and so on. If you own wicker furniture and use it in your patio only, try bringing a chair to a well-lit room and create a writing nook. That’s an easy way to make the room look much warmer. You can decorate your walls with plates and you don’t even need fancy vintage plates – you can use some spray paint to add pops of color. Storage cubes make great cheap side tables and they still serve their original purpose. Simply paint a canvas with interior paint and hang it on the wall. You can try smaller frames or one big canvas and add pops of color for an accent or soft hues for warmth without committing to re-painting walls and without big expenses. Embellishing a lampshade is easy by using scrapbooking decals and you can transform a simple lamp into a whimsical accessory. Add architectural interest by using self-adhesive molding to create chair rails. You can use a different shade of paint to paint part of the wall for a greater effect too. The first thing everyone sees when entering your home will set the impression of your entire decor, so invest in decorating the entryway, first things first. 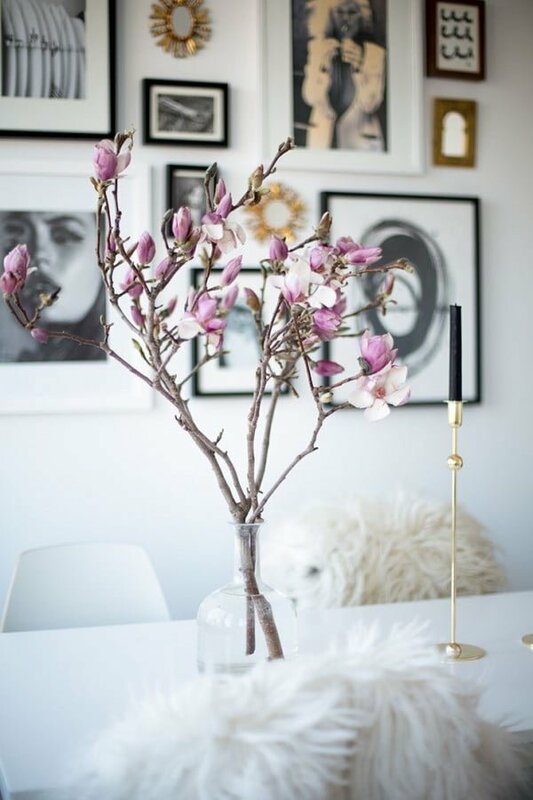 This example of a decorative wall mirror, a small table and the use of fresh flowers shows how you can make a lasting impression with minimal decor. 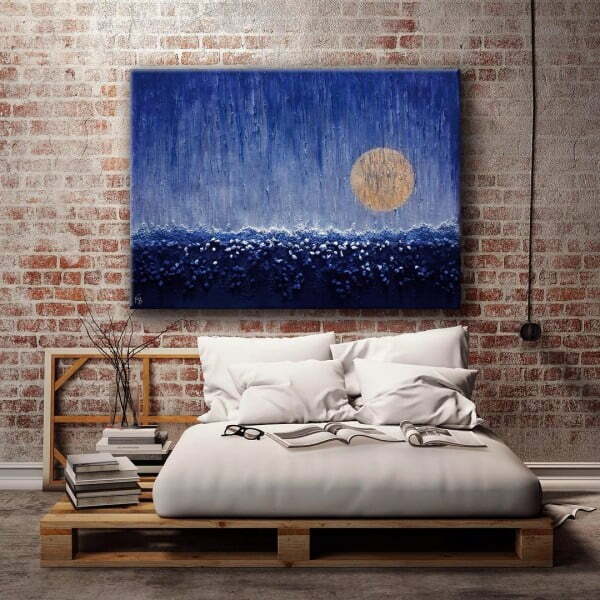 You don’t necessarily have to buy art pieces to decorate your walls. Hats, jewelry, and other personal accessories can make great decorations if you put your mind to it. Don’t be afraid to mix different furniture of different styles and finishes if you can’t get everything in a set and if that’s the cheaper way. So what if your dining chairs don’t match, you have different styles of cabinets or your sofa and armchair are from different sets. Mixing and matching is a valid technique to create unique decor. Bookshelves aren’t just space for books and storage, they give you a great opportunity to create displays and you should use it. Don’t have a bar cart? Use a tray. And their use isn’t limited to just a makeshift bar, you can use a tray for just about anything from creating table centerpieces to transforming an ottoman into a coffee table. Coffee table instantly becomes the centerpiece of room decor if you create a vignette to decorate it. It’s cheap and easy to do by adding a houseplant, some scented candles, fresh plants, books, and other display accessories. You can literally use everything you have to create a beautiful centerpiece and you’ll get extra points if you match the season. You can get an impressionable result by simply rearranging the furniture. Don’t assume that your current layout is the only way it can be – it’s not set in stone. Simply moving the furniture a few inches away from the walls can create a different flow, so experiment with it. Plug-in sconces and table lamps aren’t expensive, can be easily added and they can redefine your decor. Add them next to other accent pieces to emphasize and create an extra layer of lighting. Practically speaking, a single decor piece that can make a strong accent is better than several small items that get drowned on bookshelves or end up stashed away from the view. 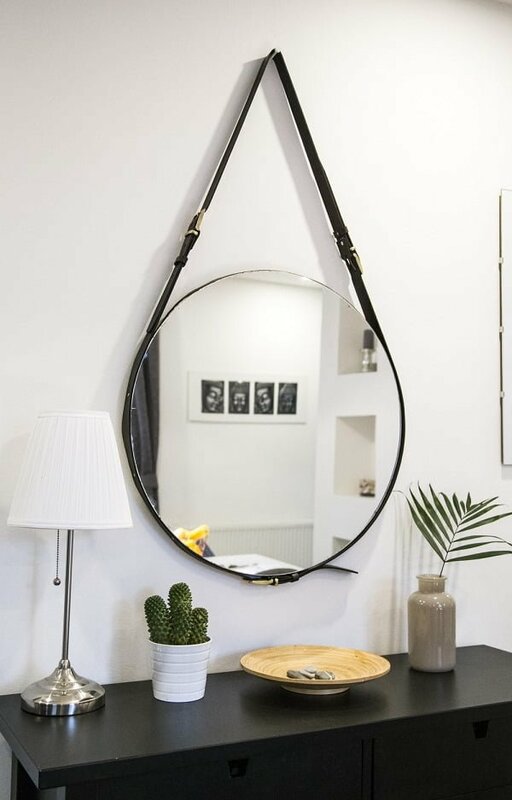 So save up for one big decor piece, like an accent mirror for a truly impactful addition to your decor. Before replacing your old cabinets or sinks, you have a cheaper option to only replace the faucet fixtures and pull handles. They will transform the look and bring the furniture back to life – good enough to put away the expensive upgrade. If you match the finish of the fixtures it will improve the style too. 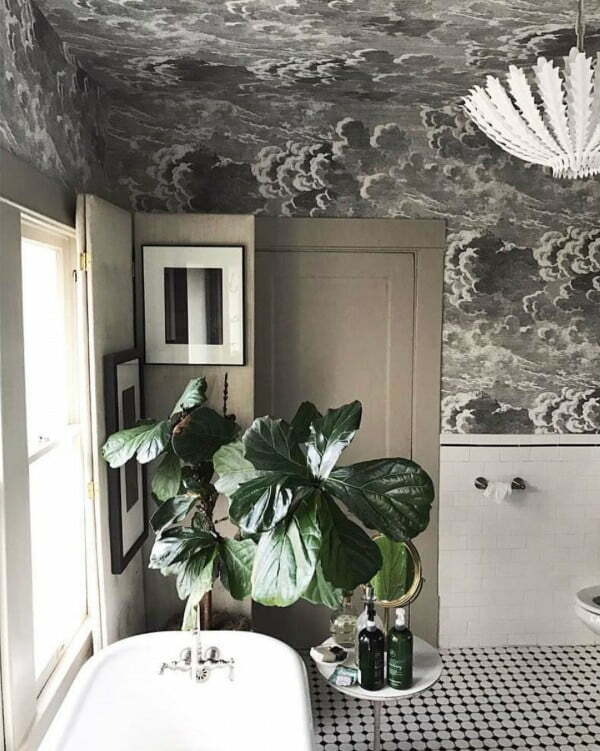 If you can’t afford wallpaper, you can have a similar effect with ornate china plates or vintage textiles (that you may already have stashed away) to decorate the walls. If you’re going to get an ottoman or a coffee table anyway, get one that has hidden storage built in for extra functionality and to save some money on storage units. There are a lot of good decorative items that can be found in thrift shops very cheaply. Use them to add to your display vignettes and experiment with expressive decor pieces for a touch of bohemian style. Fill a tray with pebbles and rocks to keep soap and other bathroom accessories, or use rocks as the sink drain plug. It literally costs you nothing but adds a beautiful accent. Not ready to commit to fully repainting the room? 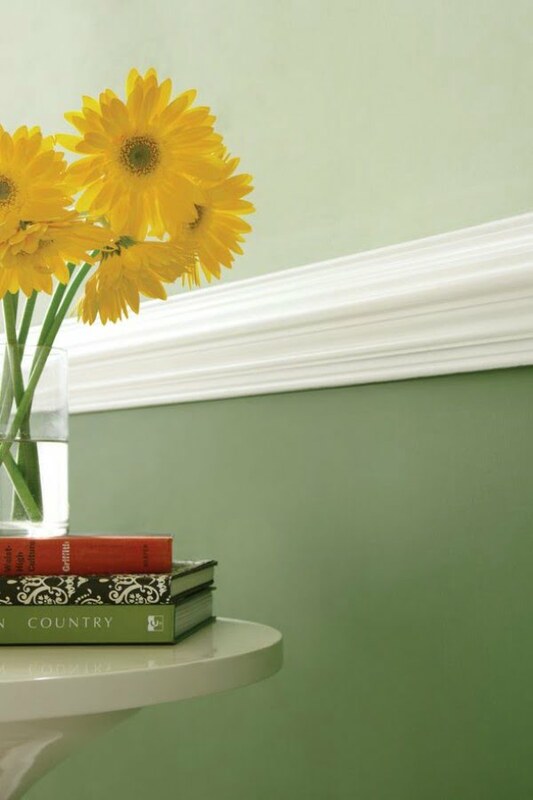 Try painting a smaller wall or a fragment in an accent color – it’s an easy and inexpensive way to make a statement. Similarly, you can tile just a fragment of a wall (such as the vanity area) as a budget tiling option. Try trendy patterns like herringbone to make an accent. Most interior designers save by skipping on a fancy headboard, but you can easily and cheaply prettify it by throwing a patterned fabric over it. Try global folk patterns which are trendy this year, or go with more subtle patterns in subdued tones. If you choose decor pieces that are easy to customize you can create unique features at a fraction of cost. For example, cube shelves can be painted and arranged to your liking. If you shop in thrift stores or online to save money, you will pick up some great pieces but they won’t likely match. The same will happen by buying and collecting things over time. The trick is to group these pieces in threes – that will make the arrangement look intentional. Vintage pieces have great decor value and you can pick them up cheaply in thrift stores or online, so try to regularly check them out and you’ll collect some great stuff to use in your home decor over time. Save on fancy curtains by painting simple cookie-cutter IKEA curtains in a style you want. Check out the tutorial. 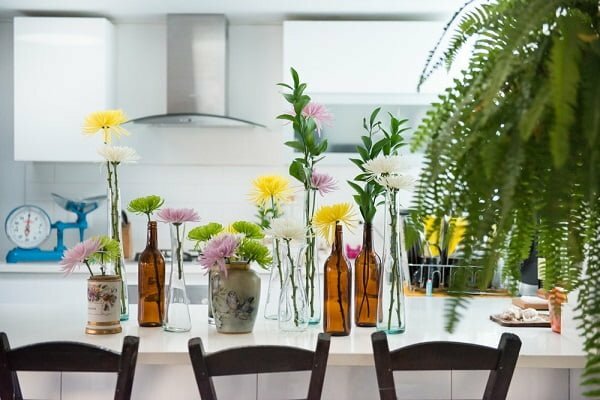 A trick that is used by interior designers over and over again to make a decor statement at very little additional cost is to use a bigger vase and create an oversized floral arrangement. Replacing old faucets in the kitchen and/or bathroom is a simple DIY job. Try matte finish for a trendy new look this year. Take a walk in a park and gather some seasonal accents for your home for free. Pick up some plant springs and blossoms for those fresh floral arrangements. The quality of a mattress and thus the quality of your sleep directly depends on the price of the former. And while it doesn’t mean you have to blow your entire budget on a mattress, you should spend on it as much as you can afford. Your health is your top priority. On the other hand, a great place to save in the bedroom decor is on the headboard. 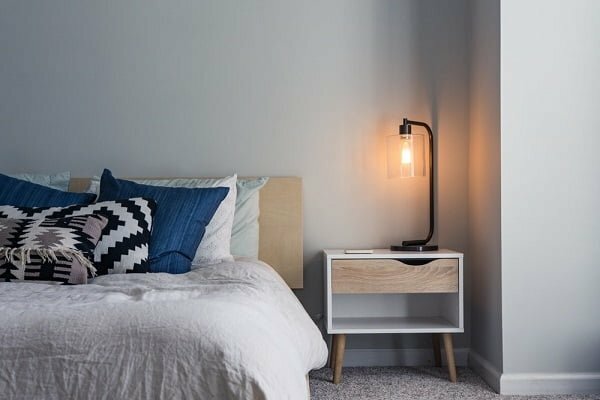 You don’t need a fancy headboard to make a statement in the bedroom and there are many options where you can create an accent at little to no cost. This plywood board looks awesome and doesn’t cost that much. A big and comfy sofa is where you, your family and guests will spend a lot of time, so it makes sense to invest in its quality. Choose a sturdy, comfortable sofa that will stand the test of time. 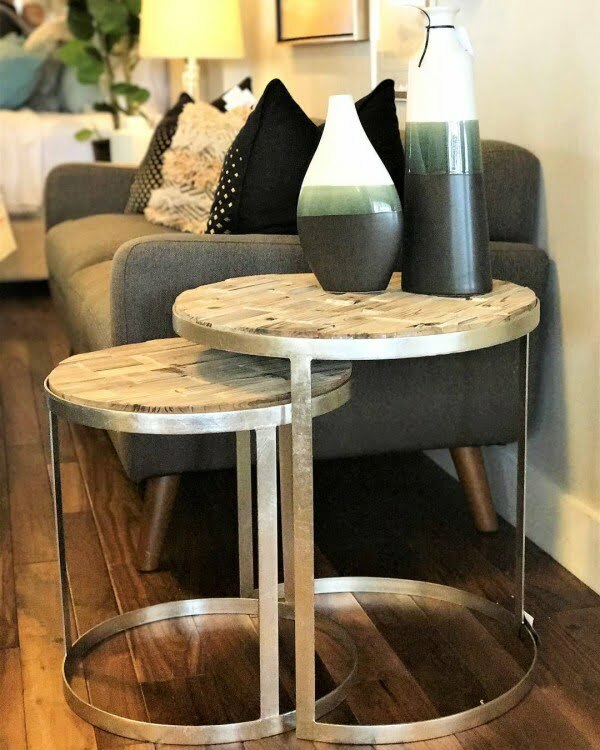 Occasional tables (like side tables, nightstands, consoles and coffee tables) and seating (like ottomans, poufs and stools) aren’t worth spending a ton of money on simply because there are so many great inexpensive options. For example, this lidded basket is cheap and doubles as a storage unit as well as makes a warm decor accent. A good area rug should be on your priority list because it’s one of the keys to complete decor. The right rug will anchor and bring your whole room together and if you go for quality, it will serve you for years to come. Not to mention, area rugs are very easily added, moved and removed, which makes them very versatile in their use. The thing you should never splurge on is a trendy decor piece. Trends come and go, your tastes can change too, getting something that you think looks cool now to get a few oohs and aahs isn’t worth the money. You can spend your money a lot more wisely on inexpensive accent pieces that do the job and you don’t have to blow your budget on them. Statement pieces are those that establish the whole room decor. If you see a piece that you believe will make your decor vision come true and really bring the room together, by all means splurge on it. Things like curtain rods, lighting fixtures, faucets, drawer pulls and knobs, and so on, aren’t worth much deliberation. Simply choose inexpensive options that do the job and you can think about them later when you have the budget and want to add more detail to your home decor. When buying new appliances, definitely go for the energy efficient options even if they cost a bit more. They will pay for themselves in the long run on energy costs saved. You don’t need fancy dishes for everyday use, so choose plain and simple cheap dishware and utensils. You can have a fancier set for your guests but splurging on everyday items is totally unnecessary. Some interior paint is inexpensive compared to designer furniture, but painted cookie cutter pieces look anything but cheap. We love this cabinet look painted blue with black glaze finish. Metallic finish doesn’t have to be expensive with stainless steel panels that you can pick up from IKEA. The panels can be applied to furniture like cabinets as well as accent walls. This look is created with faux marble paper which is inexpensive but looks like the real deal. For kitchen countertops you can use Formica marble laminate. With tiles you have two choices, either go with expensive designer tiles, or paint them in a pattern you like yourself. You may not get patterns as intricate but it sure can look good at a fraction of the cost. Subway tiles aren’t expensive but the conventional pattern isn’t always flattering. Instead, form a different one to completely change the style. Vinyl tiles may be cheap and usually used in office buildings but that doesn’t mean they can’t look good in your home. Big tiles are in style this year and you can get vinyl tiles in many different textures. Plywood may be cheap and look unfinished but it gives you that extra texture that you can use as an accent and it can really work wonders. We love this shelf made out of a single plywood board. 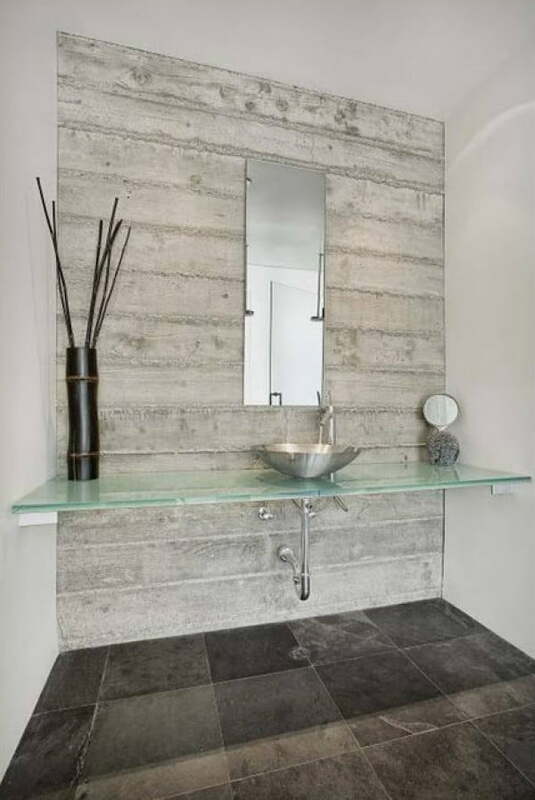 Concrete finish creates an industrial style and you can use it for the kitchen countertops, bathroom or accent walls. It looks good and most importantly, it’s inexpensive. Just like plywood, particle board is another cheap material that can be used to add texture – it’s random pattern certainly has an appeal. 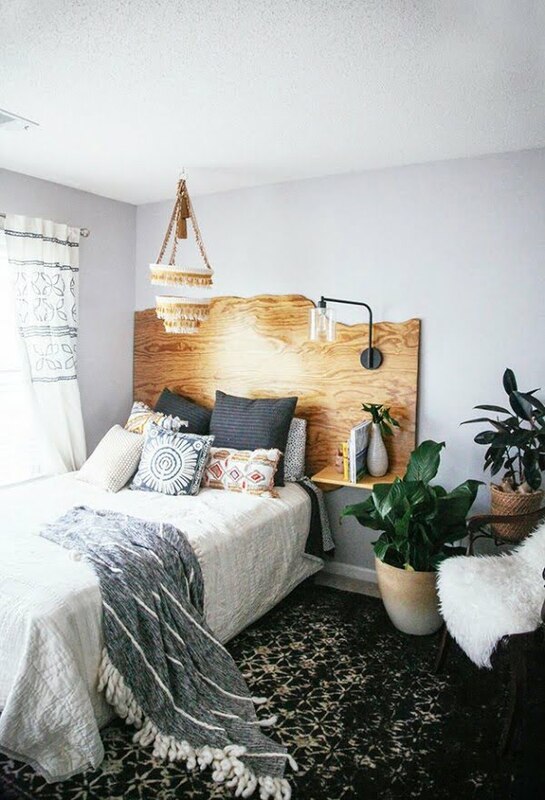 This headboard really plays well against the dark gray hues of the room. Talking about accents, the rustic touch of upcycled and repurposed materials always makes a warm decor feature. If your cabinets do not feature glass doors, remove the doors from the top cabinets to leave the shelves open. Arrange the dishes and other items for display on these shelves. It will give the space a more open look and will make a great decor feature. Get cheap lamp shades and paint them. You can use an accent color or some pattern to get a unique accent piece at little cost. The right lighting can transform the decor completely, of course it doesn’t always come cheap. Add spotlights over display cabinets or tabletops with sconces as an inexpensive but effective lighting alternative. Break a rule, hang wall art off center or over the door, give a decor piece a new purpose. 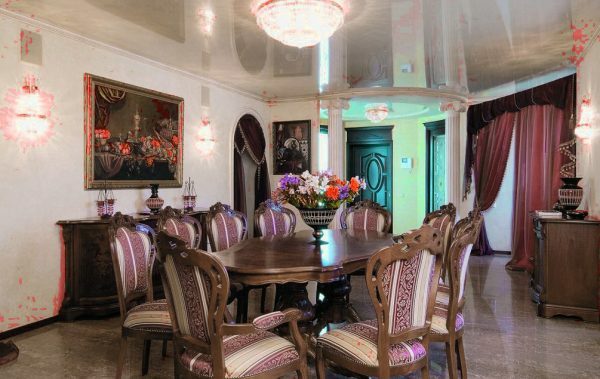 In the room pictured above, wall art is hung unusually low to be a part of a layered vignette. It’s easy to add wallpaper to the backboard of a bookshelf and it makes a great accent, adds depth and pattern to the decor. Use gold spray paint or gold leaf to embellish the curtains and curtain rods for an unusual accent. The fireplace, when there is one, makes the focal point of the room. But even if you don’t have one, you can fake it and put some candles in it, as well as make use of the decorative mantel. 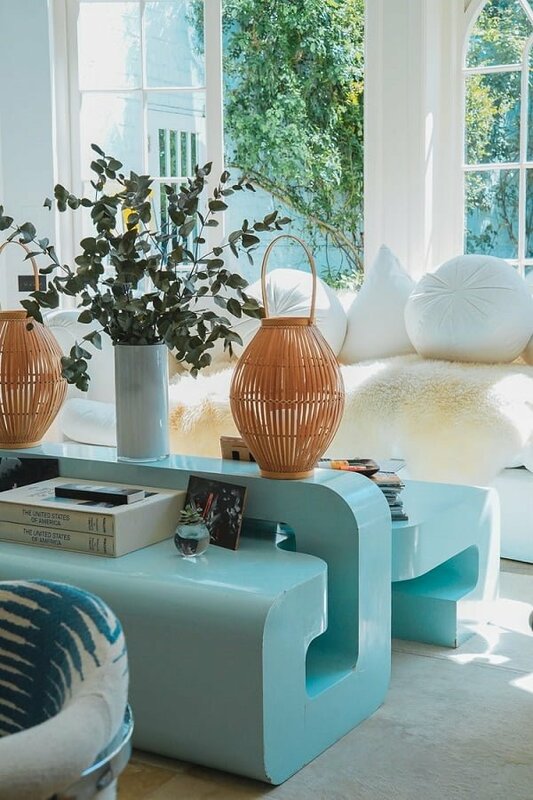 Big things come from simple ideas and while fresh plants always make home decor just a little better, take it a step further and find a place where it would make a contrast in color. When you’re at the store it’s no time to eyeball the size of decor pieces you want to buy and expect them to fit. Measure the space and furniture that’s already there to ensure that everything you buy will be a good fit in your home. While you should always go shopping with certain goals in mind, you should still keep an open mind to other decor pieces you may find appealing. Always be on the lookout for new things that will work in your home decor. Especially pay attention to whimsical pieces that can make your decor unique and personal. Never splurge on the first thing you see unless you absolutely fall in love with it. Chances are you can get an alternative piece at a lower cost. So spend only on things that you are sure your decor can’t do without. While we have mentioned keeping an open mind to unexpected purchases, it doesn’t mean you have to buy absolutely everything you see. Be moderate about it and think if your home really needs it, otherwise it will disappear in your already sizable collection of items. Buy things only if you know you need them. You have to understand that you shouldn’t expect to completely decorate your home in one day. Don’t rush into buying things especially if you’re on a budget. Carefully choose furniture and accessories for your room and live for a while with them to make sure they make you happy and they’re functional as intended. Each piece has to live into your home and your interior design will grow over time. You don’t have to buy furniture in sets. Just because you’ve bought a sofa, you don’t have to buy a matching coffee table and chairs. Mix and match furniture for your individual decor that looks like it took time to arrange. That will allow you to shop for better prices in different stores as well. You don’t have to do your home decor shopping in big box stores only, in fact thrift shops can be great for unique and vintage stuff for your home. Check out your local shop next time you go on another decorating spree. This is especially true when buying furniture – you don’t want a new sofa to wear down over a few months, so you have to think about the quality of things you buy. White you don’t have to go for the most expensive thing, make sure it is sturdy enough and looks like it can stand the test of time. So even if it means you’ll be able to buy less of other decor pieces because of it, always pick quality. In the end, the only thing that matters is that you surround yourself with things that you personally love. It doesn’t matter what style, trend or whether it’s timeless in general sense as long as you love it and you want to keep it forever. 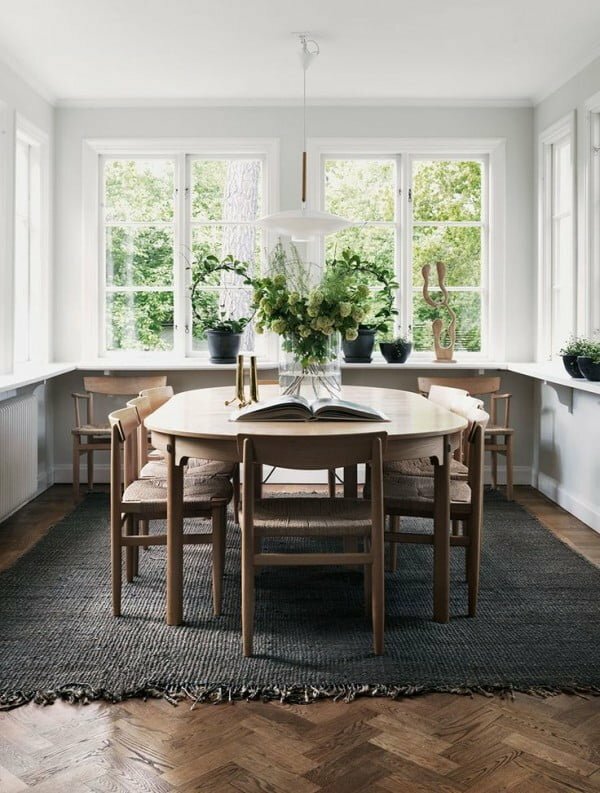 If you find a wonderful chair that fits in your dining room perfectly but it’s a bit pricey to buy two, get one and you can match it with a different but less expensive chairs. The only important thing is to match the scale to balance out the look. Even IKEA has an “As Is” section where you can pick up slightly damaged but cheaper decor pieces. With a little DIY and creativity you can make them look perfect at home. 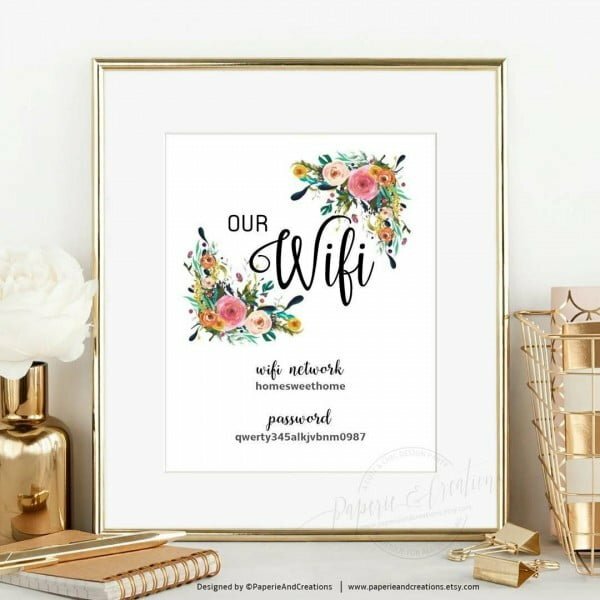 Sites like Etsy are great to find unique art for your home decor and they aren’t expensive. Next time you need a picture for a wall, go shopping online. 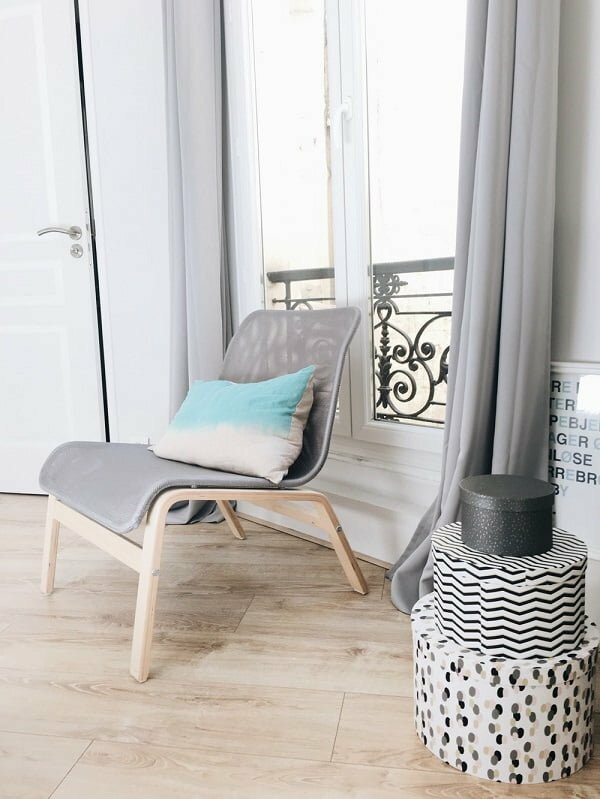 The same chair will seem like new if you move it from the living room to the bedroom, and it costs literally nothing to refresh your decor this way. Vintage items can do wonders for your home decor and you can get great deals if you look for them online. If you’re looking to keep your home decor on budget, choose furniture that can be used for multiple purposes. A coffee table that can serve as seating, a table that makes shift to a console, anything that can double time will save you both, money and space. Storage plays an important part in home decor so choose furniture that can serve as a storage unit to solve two problems in one go. Weather you buy old or discounted furniture and other decor pieces, using spray paint can add aesthetic touch ups to renovate them easily. Don’t spend a ton of money on a fancy headboard when you can style one yourself with a simple throw blanket, and you can choose any accent pattern you like which is also easy to switch. You don’t always want to make an accent on a bookshelf, so turn the books around and keep it neutral by hiding the colorful covers. This is a committing idea but one that makes a powerful statement. Matching the cabinets, furniture, dishware and even the wall art colors creates a comfortable predictability. Old t-shirts can be used to create great throw pillow covers for unique accents. Benches and chairs can be easily “upholstered” in style by simply using throw pillows, and you can even tie them to the seating with string. Looking for a touch of industrial style? You can use cinder blocks to lift the bed up and use them for extra storage in the bedroom. 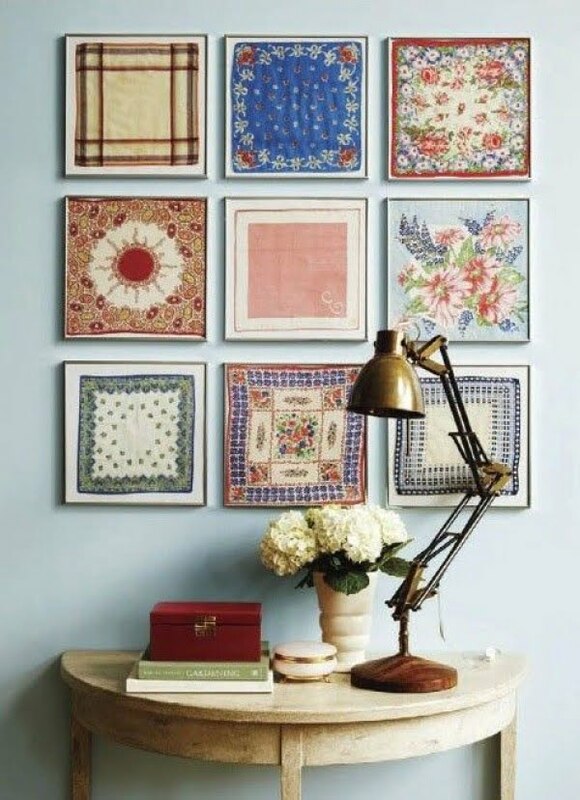 Call it chic or whimsical but picture frames make great art even without the pictures in them. 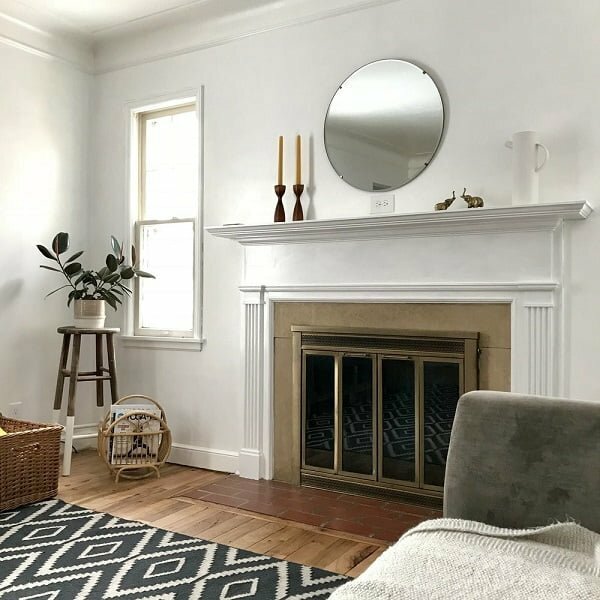 Have a mirror that is slightly out of proportion for the room? You don’t have to switch it for a new bigger one, use an empty frame to make it look visually bigger. 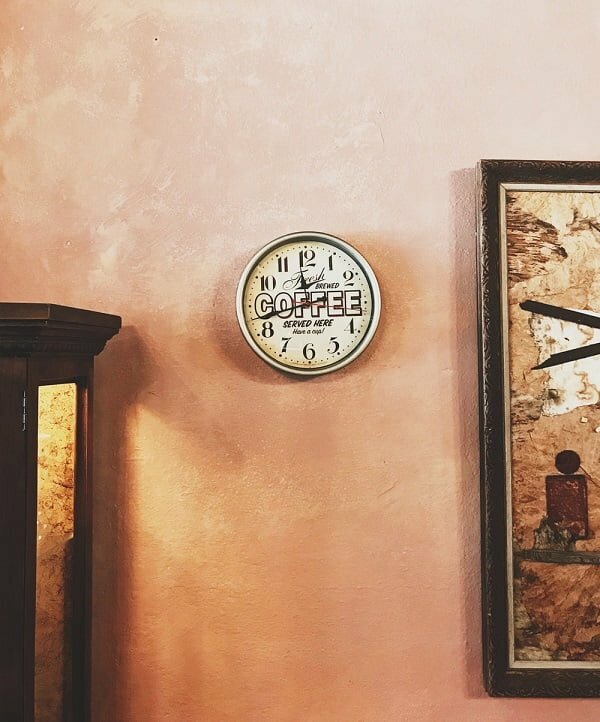 Whether you need to know the time around the world or not, an array of clocks makes a unique wall accent. Cords can be one of the biggest home decor eyesores, but instead of hiding them you can emphasize them for an accent with color. Curtain tiebacks add style and elegance to window dressing, and you don’t have to go shopping for them. Instead, look into your closet and choose scarves or belts that you can use as improvised tiebacks. If you have pretty pattern textiles around, use them to dress the dining chairs for an accent. It’s easy, simple and adds a very personal touch. Instead of keeping them in jewelry box where they get all tangled, you can use your accessories to decorate the walls in a unique way, especially if you have old or unused picture frames around. Instead of stashing fruit in the kitchen, use glass jars to put them on display. The vibrant colors of fresh fruit will make great pops of accent in any vignette. Does your room lack a focal point? Group a few pictures and other accessories together for a bigger impact then they would have alone. Bookshelves make a bigger accent if you organize your books by cover color. There’s more to couch styling than accent pillows. Use throw blankets to add a pattern or color and separate visual space for a better impression. String lights aren’t just for holidays, you can use them to create a romantic lighting if you put your mind to it. If you own multiple rugs, try layering them for a change. You may be surprised at the extra depth it adds to the room and you might just fall in love with the new look. Looking for interesting ideas for wall art? Instead of buying prints, why not take pretty covers and pages from old magazines? 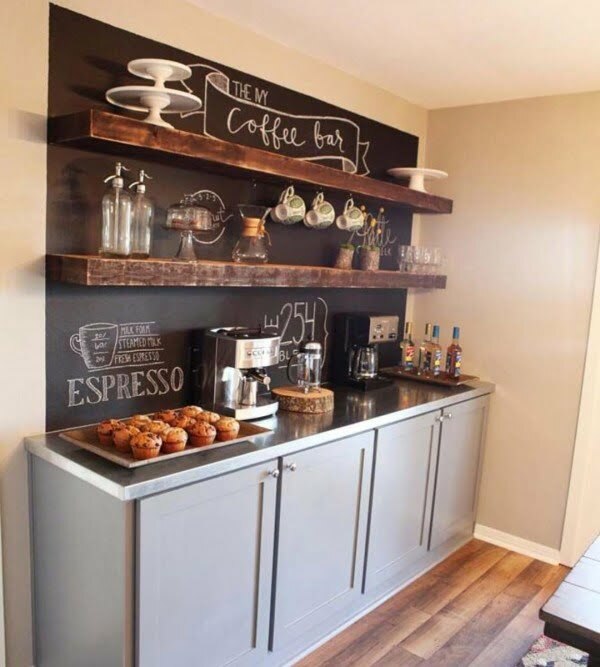 Dedicate a corner on your kitchen counter for a coffee and tea station. An organized space gives a sophisticated vibe let alone it’s very convenient. If you don’t have enough counter space, consider a roller tea cart. You’ll always find some empty wall space where you can use a magnetic strip. It can be used in the kitchen to store small utensils like knives, in the bathroom for small accessories, and even in the living room to hang pretty postcards and notes. Faux granite or marble counter tops using contact paper are becoming more convincing and it’s a great way to save on the real deal. They’re especially useful if your counter top is worn down and could use some repair. Cover the lower part of the window with cafe curtains. You can use simple fabric in a variety of patterns of your choice for them. Creating home decor that is ahead of the trends isn’t that easy but it’s not only a matter of guesswork too. At the beginning of every year, we hear a lot of different opinions from design experts as to what styles and designs will be trending this time. Truth be told, most of them don’t live up to the hype. But those that do, usually build on the designs that were popular last year too. Styles that transcend years are what we consider the safe trends to try if you want to create trendsetting decor. 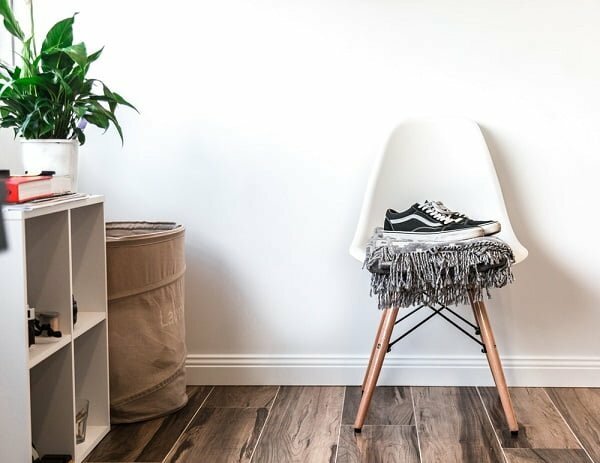 So having heard numerous opinions and seeing how trends have changed in the past years, we’ve made a list of 10 simple ways how you can set your own trends in your home decor. It seems that our time spent with technology keeps increasing every year in every aspect of our lives. More and more homeowners wish to find time to get unplugged, so to speak, and spend time with their friends and family or just reading a book. A completely tech-free living room is becoming more than a trend. We see a trend in adding more colors to the interior design but doing so in a subtle manner. Instead of vibrant pops of color and busy patterns that were popular a few years ago, we now see softer moody hues that still introduce colors but do it delicately. Go for adding color via accent pieces, furniture, rugs, and choose soft hues. Gone are the days when the bathroom was all about minimalist look and function only. We’ve seen a lot of new decor ideas and styles for bathrooms that make it look more like a living space and this trend will continue in the coming years. So feel free to experiment with wall art, seating, side tables, vignettes and almost everything you would do in other rooms of the house. The trend of modern integrated dining areas (sometimes none at all) is making a 180 degree turn and it’s going back to the traditional formal dining room where a whole family can gather for a dinner distraction free. 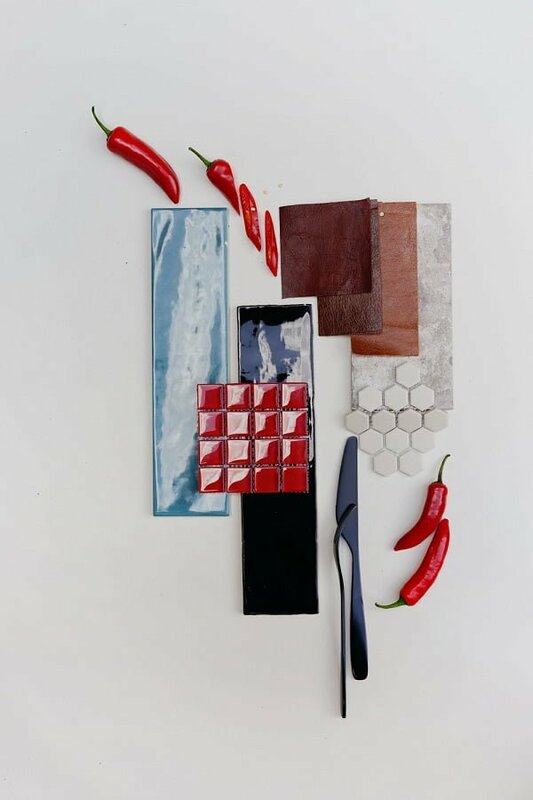 Instead of a sleek modern look with a choice of one or two materials, we expect to see more mixed materials that make the kitchen more visually interesting and more alike to other rooms in a home. Gray is becoming the new white as we see a lot of kitchen and bathroom designs going for the warm and neutral grays with the cabinets, walls and even the floor. You might think using so very little color in the interior design will make your home dull and boring, but you’ll see that the contrary is true. Using the shades of grey can actually give you a lot of flexibility to emphasize almost any element of the decor. From shiny stainless steel that has been popular during the previous years, we turn to colored finish. We can see a lot of black, matte black, gilded, even rose color metallic hardware, fixtures and kitchen appliances. Adding a special element to the kitchen as an accent that adds function is getting ever so popular. It can be a pot filler, and automatic faucet or even just a dining table on wheels. Adding at least one vintage piece to every room has been popular for a while as a way to make your home more personal and original, and it will continue to do so. Especially as it’s so easy to find something online on sites like Etsy. 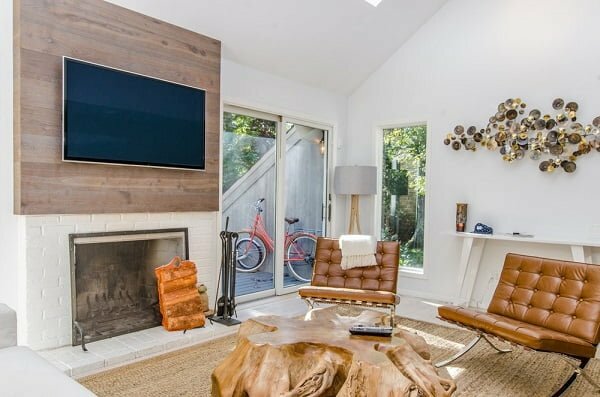 We’ve mentioned that tech-free living rooms are getting popular, so when the TV is out, the fireplace comes back as the rightful owner of the title of the focal point of the room. And even if you don’t have a real fireplace, you can get a decorative one. An anchor in home decor is an accent item that brings everything together. It can be a couch in an accent color, a table, a piece of art, a colorful rug, or even just a bunch of throw pillows. The important thing about an anchor is that you have to choose one first and then decorate around it. Solid colors may be boring but too many busy patterns make the place look cluttered. The key is finding the balance between the two. So for every pattern item you add, make sure there’s enough solid color in the room to balance it out. Make sure they don’t compete but complement each other. Mixing metallic finish and colors is a trick of the trade for many designers. 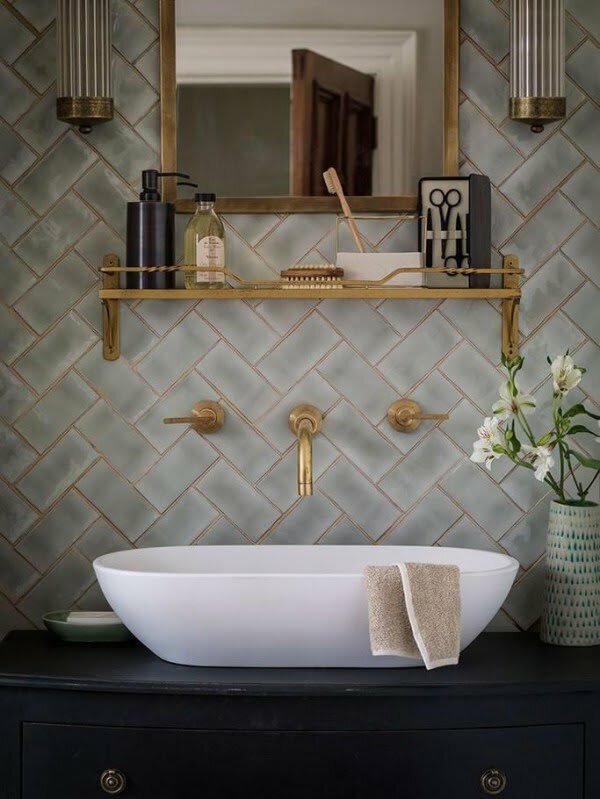 Brass fixtures and dark cabinets add a lot of depth, especially when contrasted with bright walls. Getting furniture in sets is not what professional designers do. The truly beautiful decor is made of combining different pieces to create something unique. The key to maintaining a balance and natural flow of furniture in a room is planning for the sight lines. Each room has a path to the door, windows and seating, make sure that path is not obstructed. It’s easy to forget the bathroom but your home decor is not complete if your bathroom is a mess. Make it look gorgeous. Even if your bedroom is small, find some room for a chair and it will look bigger and more complete. Elevate your vignettes by using lacquered or mirror trays. Layering the lighting is the number one tool of romantic design. Use table and floor lamps to add layers and find the right lighting. Remember, everything looks better in the right light. Add houseplants, floor lamps or even create vignettes in the corners of a room to soften the edges, add depth and make it look bigger. Use matching chairs or pictures alike to add symmetry to the room and make it look well balanced and important. This tip is especially useful in a room that starts looking cluttered. When there’s a lot going on and several pieces compete to be the anchor, add something eye catchy to direct the attention the way you want. Sometimes the room’s decor may become too strict. A very quick and easy to break the tension is to add bundles of books around. You may know that things look most visually pleasing when they come in threes. The reason behind that is actually the rule of thirds or the golden ratio that’s the staple of design. To put it simply, divide a space into thirds and use one third as the focal point. So besides creating vignettes of three objects (or groups of objects) you have to make sure they aren’t all alike and make one piece the accent. 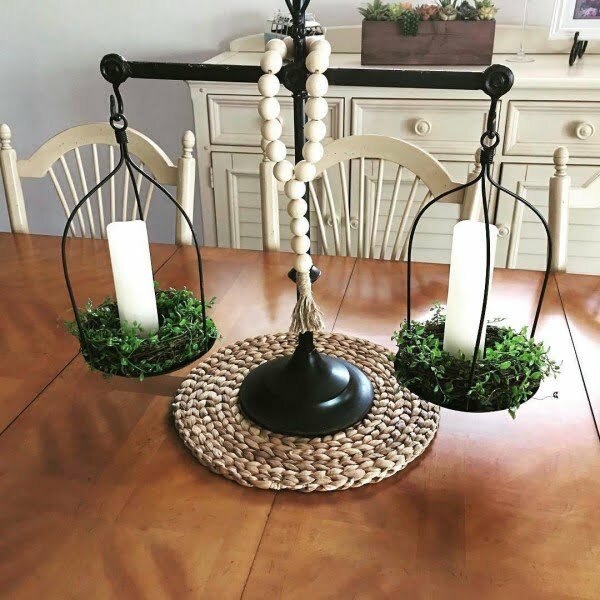 You can create beautiful decor with random store-bought accessories but what really gets oohs and aahs is a display with personal items that tell a story. It can be memorabilia from your travels or past events, anything that you can tell your guests about. A vintage dresser, or a fancy side table, get any unique or fancy furniture that pops out in your decor to add instant personality. Collections tell a story, they are personal and original, and you might already have a collection of something that you haven’t even thought about. Music records, old cameras, phones, even postcards, any collection makes an accent when put on display. Home decor starts with colors and you should use only those that appeal to your style. Choose those colors that you find pleasant, colors that other people associate you with. Perhaps it’s the color of your eyes or the colors you like to wear, making them all about you. Before even starting to decorate, think about what you love, what makes you feel comfortable and happy. Bring only those things to your home that define you and make them define your home. 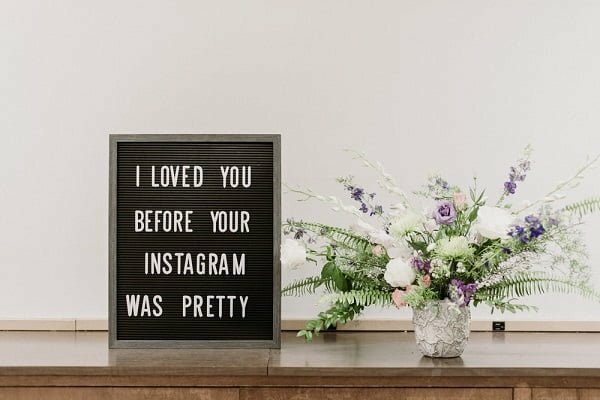 That’s what makes home decor really personal. The decor of your home evolves over time and consists of little details that you add over time. So you will bring the accents that feel right and make you comfortable. 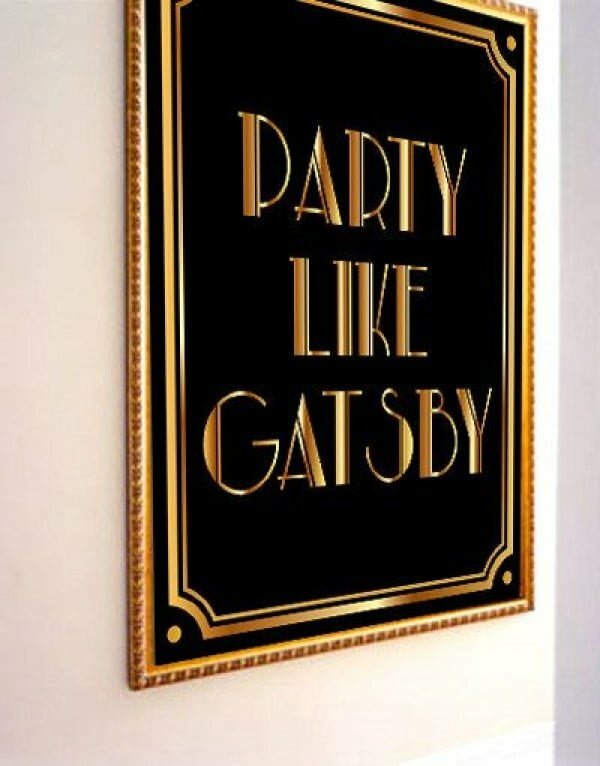 Using wall signs is a simple way to convey a message and make a room a little more original. One of the best rules of home decor is to avoid uniformity because it looks cookie cutter and boring. So use contrasting furniture and styles, juxtapose things to create contrast. A small room looks most original when it’s the world of its own. So don’t be afraid to use a lot of detail, wall accents, and patterns, color explosion to create dramatic decor. Nothing adds character better than small surprises around the home. As soon as guests enter your home the first thing they see should set the mood and give a glimpse of what’s to come. Make the first impression count. Soften the edges with curved furniture and your decor immediately breaks away from the default cookie cutter style. Mixing and matching furniture, materials and patterns is the major tool of creating original decor so make proper use of it. Avoid all matching furniture sets and try to mix in different finishes. Display cabinets are great to show off your hobbies, personal things and your life in general. But don’t overload the shelves, use empty space to emphasize and group items together. You shouldn’t try to put everything you have on display, pick things selectively and change them up from time to time. Don’t forget that a display cabinet can find a place in other rooms than the living room, and it makes a great accent in the kitchen, for example. Mirrors provide a unique way to add original accents while being functional. So find a place somewhere on your walls to make use of them in any room possible. Last but not least, and the most obvious way to make your home decor original is, of course, using wall art and pictures. It’s where you can really use your creativity and personalize. 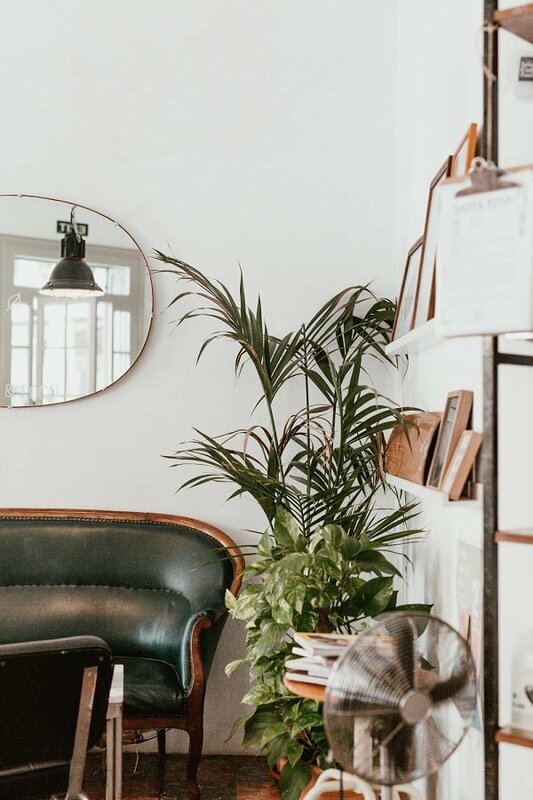 Whether it’s leather or an upholstered chair, it’s essential to a reading nook or a personal cozy place in your home to crawl up in. A club chair is a timeless classic, that’s why we find it essential. You need at least one cashmere or silk blanket in a deep color or pattern that will add style to any piece of furniture. A gorgeous throw blanket will make a stunning accent anywhere. A sofa big enough to stretch on and be able to seat at least three people without cramping up is absolutely essential for a well decorated and comfortable home. Pick a pattern that you’ll love and get a soft wool area rug that will feel comfortable for your feet. It’s all about making your home cozy more than anything. Wall art isn’t just about accents, matching colors and patterns, it’s more about what makes you feel good in your own home. So get art that you can fall in love with. A bookshelf tells a story and it will store many tales of you and your home, so to speak. This is where you will show off your life, so it’s essential that you keep it organized with your favorite books, accessories and collectibles. The choice of towels is an essential part to bathroom decor so getting sets of towels in your favorite patterns will provide you a powerful decorating tool. It’s almost impossible to avoid the boxed out feel in a room unless you do something about those edges. Tall houseplants are perfect at this because they will add depth instantly and soften the edges placed in any corner. No matter how strict your budget is, don’t save on a mattress. It’s not so much essential to the look of the bedroom as for your health and wellness. And a well decorated home is one where you feel well yourself. Your home isn’t a cheap hotel so why would you use plastic disposable accessories in your bathroom? Invest in attractive and long lasting essentials for a well decorated bathroom. A roundtable that hosts six people is a classic and solves multiple home decor dilemmas related to the room layout and hosting multiple guests. Another timeless classic that you can use just about anywhere from the bedroom to the living room and even the bathroom, wherever extra lighting is needed. Small spaces sometimes dictate home decor that isn’t exactly ideal. 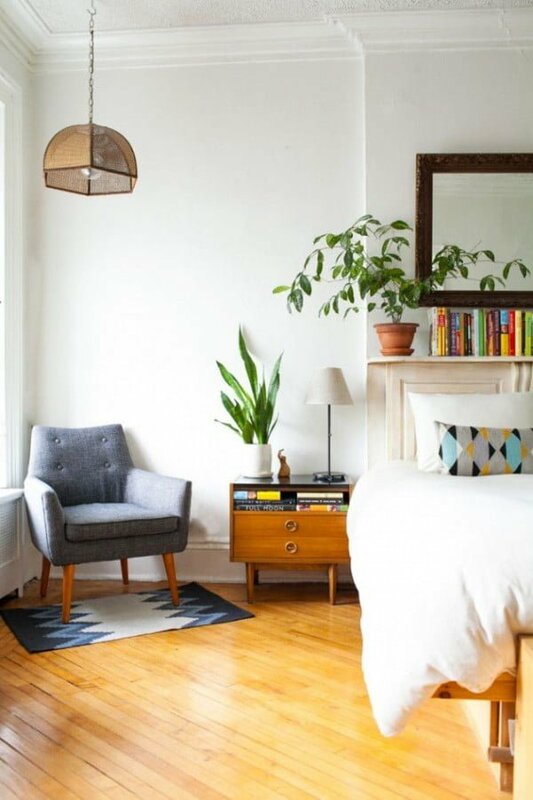 If you can, try to keep it symmetrical and have two nightstands at each side of the bed. It’s isn’t just about the visual look too – it’s much more comfortable if you share the bed with your partner. Host dinners like a real adult person and get some real napkins. They aren’t that expensive and are so much classier than paper napkins. Most rooms we see are very underlit. Lighting is crucial to home decorating so make sure you have at least three light sources in a room. Create layers of light with recessed light, chandeliers, lamps and sconces to eliminate all those unnecessary shadows. If you’re not a flower person (you’re a guy living alone, we get it), you’ll benefit from growing fresh herbs in the kitchen. Having something fresh in your home is a great way to keep it lively all year round. There are so many uses for vintage dishware in home decorating that it’s pretty much essential to have a few pieces of it. From accents in the kitchen to makeshift planters, the pastel colors and patterns that vintage dishes usually have give you a lot to experiment with. Even if you just add a few baskets under the bed, that space is better used for storage than left empty to collect dust. Collect beautiful boxes, either buying them for storage or keeping fancier shoe boxes. They will always come in handy to store little things and even hide the unsightly eyesores. Having a neutral color palette means you have to play with patterns. Keep the patterns subtle without popping colors, but find a combination that adds depth to the room. 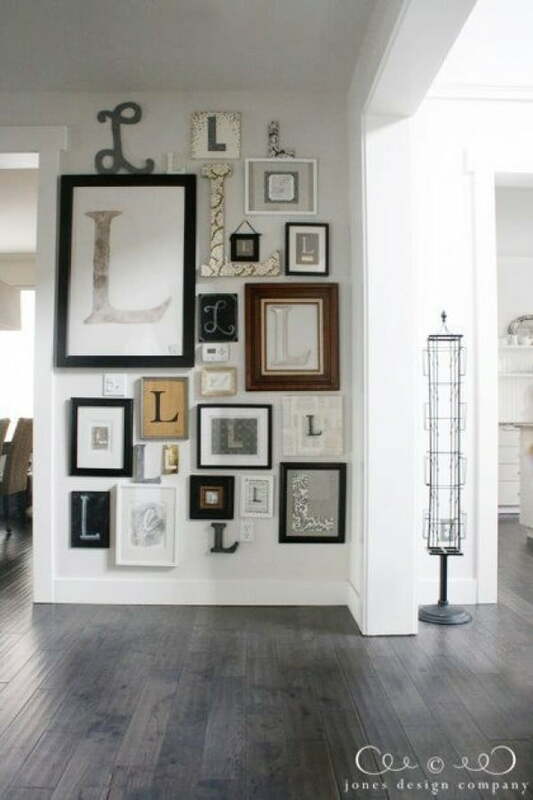 Having a full blown picture gallery wall is a great way to personalize the room with pictures that tell your story. This idea goes back to using patterns to add depth to the space, only this time think beyond the textiles. 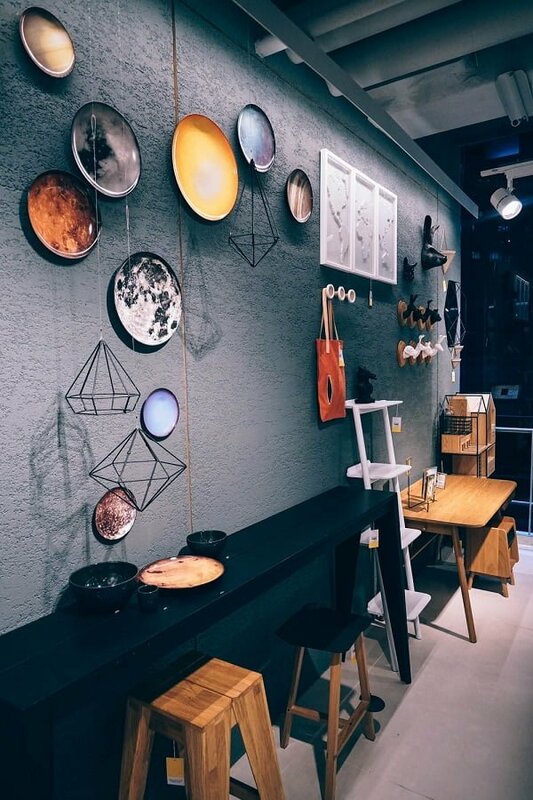 This wall paint strip creates a different decor flow and makes an accent of neutral colors, pictures and suspended shelves for display. There are several DIY ways to make the bookshelves pop, but one of our favorites is the wallpaper backboard. Add a subtle pattern wallpaper to create an accent. Instead of adding a TV on its own shelf in a bookshelf or a cabinet and letting it disappear, install it in front of the bookshelf and make it the center piece that brings the display together. We’ve talked a thousands times before but it’s worth saying again, layered lighting can make or break the room decor. Get several lamps, install recessed light dimmers, add new fixtures, and find the lighting that is pleasing to you personally. Your personal this-and-thats make great displays but don’t throw them around randomly, stack them and group them up to find an aesthetic look. Ornate brass or gilded mirror frames make the perfect accent in a neutral home decor. Adding personality to a neutral decor is all about keeping it subtle. Try light floral patterns to add that subtlety. 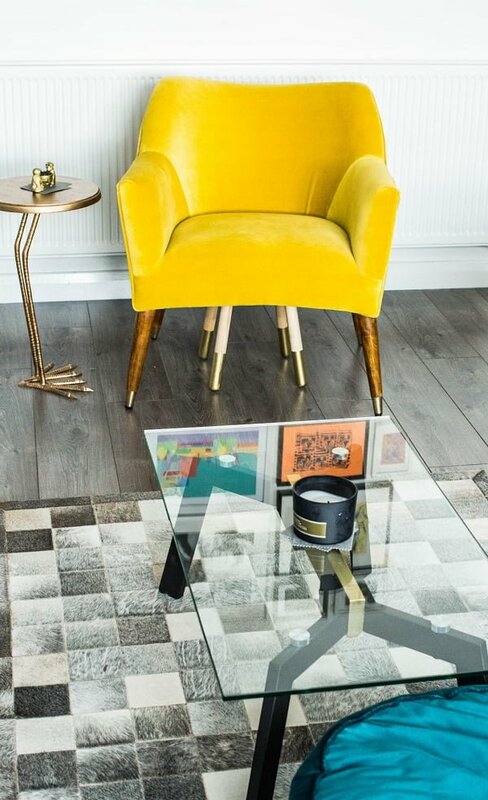 Wooden finish furniture add warmth, character and personality, so try adding a coffee table, or stools in timber or similar finish. Coarse rugs take the edge off a strictly neutral look and make it softer, warmer and more personal. A quirky way to add a personal accent in neutral scheme is black chalk paint. You’ll have an empty canvas for creative personal touch from thereon-in. 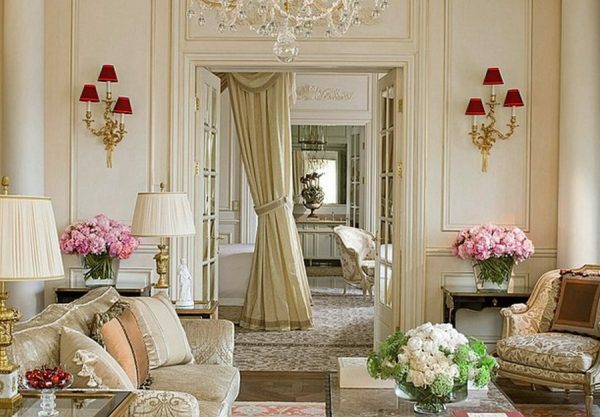 Elegant French home decor is the embodiment of combining homespun comforts with European elegance. It uses a chic and muted color palette that incorporates natural wood, exquisite hues of gold and flax and burlap colored fabrics. Patina is also used to highlight detailing in metal. This injects quiet elegance and adds a rich sense of style to a room. Accessories are integral parts of elegant French home decor. Well-designed scrolling metalwork and vintage-inspired designs enable versatile accessories to adapt to various styles of homes. Whether you have a rustic elegant home or a shabby chic cottage, it will be enhanced by the right French home décor. French flavor can be easily injected into a room via architectural details that throw back to yesteryear. However, the look can be created without having to live in a primeval chateau. 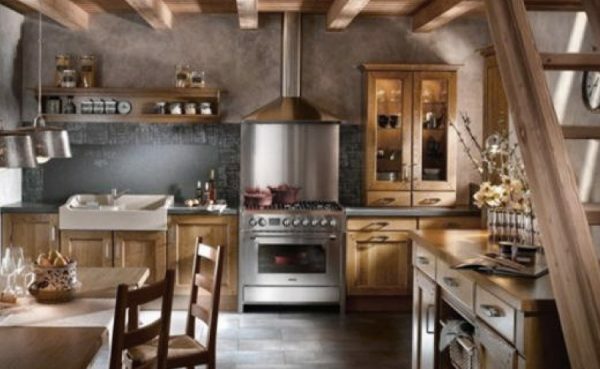 To add charm to your French-inspired kitchen, you can incorporate hand-scraped wood beams and rustic stone tiles. The look can also be enhanced by patina finishes, intricate molding details and curved archways. French country décor is a meeting of rustic country and European sophistication. This inviting and graceful style can use old-world characters to accomplish the French country look. It strikes the perfect balance between comfort and beauty and the style can be seamlessly incorporated into both country houses and elegant homes. You can introduce this warm, welcoming design style to your home by adding soft patterns and soothing hues, pretty furnishings and noteworthy accent pieces. Provincial patterns and fine-looking fabrics are hallmarks of the French country style. More delicate patterns and softer colors are used to balance the hectic lifestyles that exist these days. Lacy accents, decorative trims and attractive fringes provide an elegant finish. Notable materials and decorative faux finishes can be used to accomplish the old-world style of elegant French home decor. Use architectural design mirror frames to add architectural interest to your home decor. It’s much easier than adding crown molding, for example, and a mirror in this style can have a very dramatic effect. Mirrors can be used as decorative windows, especially placed on the walls against real windows. This way they reflect the light to make the room brighter and make a decorative statement at the same time. Picture gallery walls make a strong statement as a decor feature, but mirrors are that much more effective. They don’t have to be matched to wall color or room palette, the only thing you have to think about are the frames. 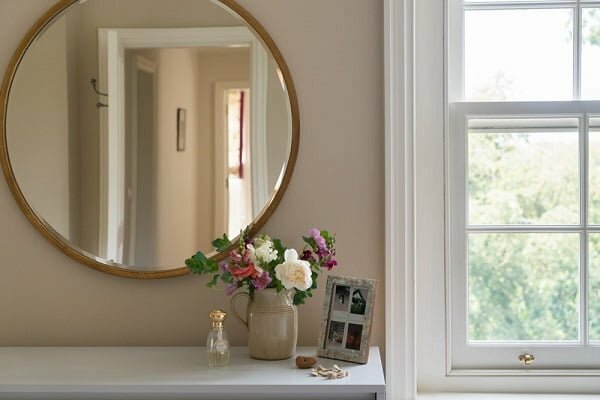 When it comes to mirror frames, you have a lot to experiment with – from the popular sunburst frames to traditional rectangles, accent round frames and everything in between. Our tip is to create a mirror wall and add to it as you pick up accent mirrors over time. A mirror behind a vignette works as a great backdrop that elevates the composition. Hang mirrors over display surfaces for this dramatic effect. 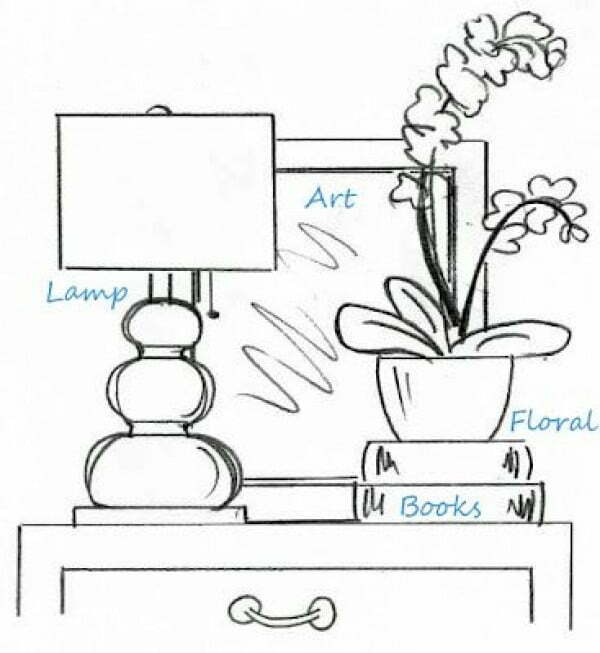 Add depth to a mirror by simply placing an empty picture frame against it. For example, this round frame gives the rectangle mirror new shape without even having to re-frame it. 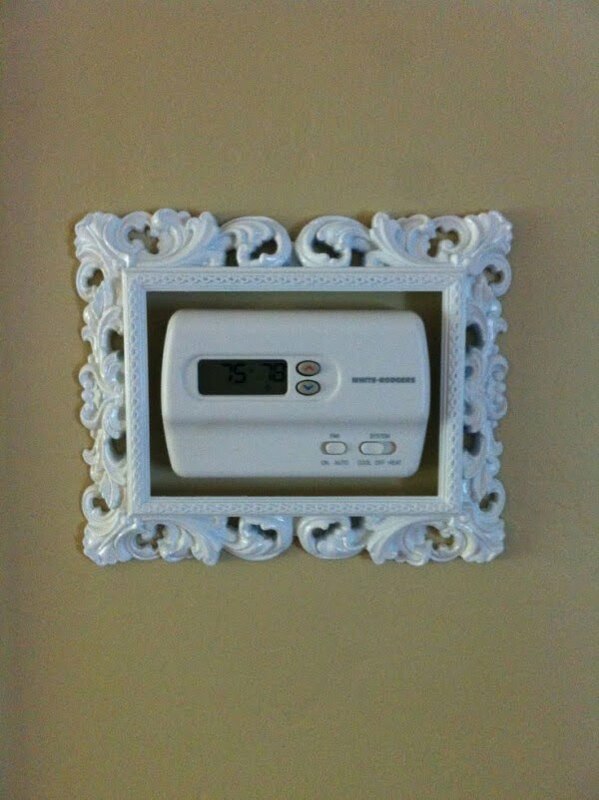 You can put to use any old vintage frames you may have. Similar to the interior decor, architectural mirror frames can make decorative windows on the walls or the fence in your garden or patio. Having a mirror on the wall of the porch or patio will make it feel more like a room. Mirrors are great focal points that bring everything together. For example, this gallery wall makes use of a round mirror as an anchor for varied size pictures. We like introducing some contrast to the kitchen with black cabinets. Black isn’t dominant here, rather it contrasts with white cabinets and walls, as well as the subway tile pattern. 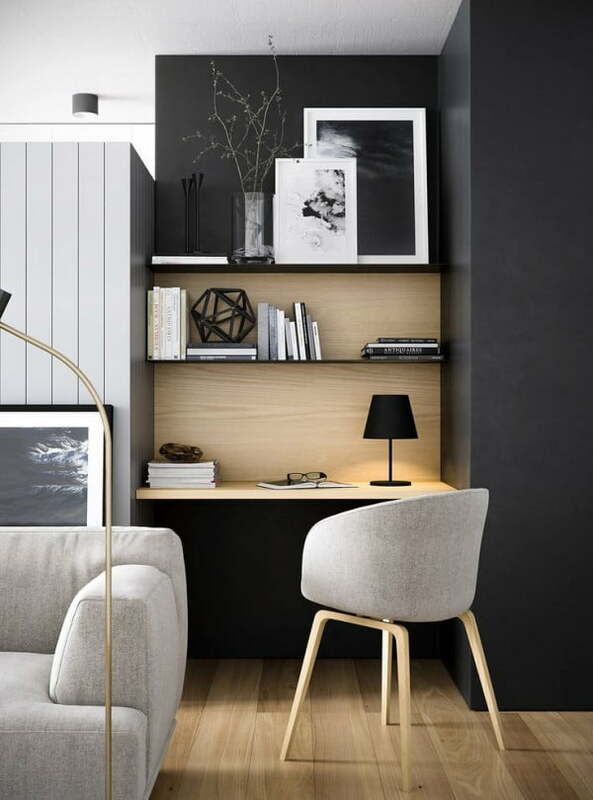 If you want to add black accents in a more subtle way but one that still has a dramatic impact, try black pendants, lamps and other lighting fixtures. They don’t distract from the rest of decor but make their presence felt. Painting the staircase black is a great way to make a strong accent, and if it’s mixed with soft wood finish you get a sophisticated and masculine style. In any case, black stairs will work with any color scheme. It will always create drama in a room, especially if combined with metallic finishes of other decor pieces, such as this mirror frame, table lamps and Chinese garden stools. If you’re one for decor trends, black stainless steel is this year’s feature in the kitchen. Black appliances create a break in the kitchen style where other colors and patterns are used, usually in soft grey hues or whites. It isn’t common to go for black accent pillows unless you’re going for a complete black and white decor style, and well, black doesn’t pop like other colors. However, a black throw pillow provides a visual break and it can be used to introduce a new pattern. Bring the room together with a black pattern rug as the anchor. It doesn’t draw attention away form the room decor and doesn’t disturb the color flow while still providing the warmth and softness. Similarly, you can dress the windows in a black and white pattern curtains to add depth and actually make the windows look bigger. Get a lighting fixture or a chandelier that looks interesting. It makes a big accent and draws attention while making it seem well thought out and expensive. Moldings are the sign of luxury for a reason, they add depth and dimension to the room and make it look finished. They aren’t expensive to add too, and you can even do it yourself. Throw pillow casings and covers are go-to accents in the living room and bedroom, by upgrading them you’re increasing the perceived value of your home. Choose elegant materials like linen, cotton or even silk and avoid cheap looking polyester. Get bigger plushier throw pillows for the living room sofa to amp up the elegant appearance. Getting the window treatments right is a big aspect of an elegant home, so much so that it can make or break the appearance you want to create. You don’t have to use expensive drapery, you can quite easily style the curtains and shades to make it look elegant. If you’re going to use drapes, avoid the cheap looking polyester fabric. 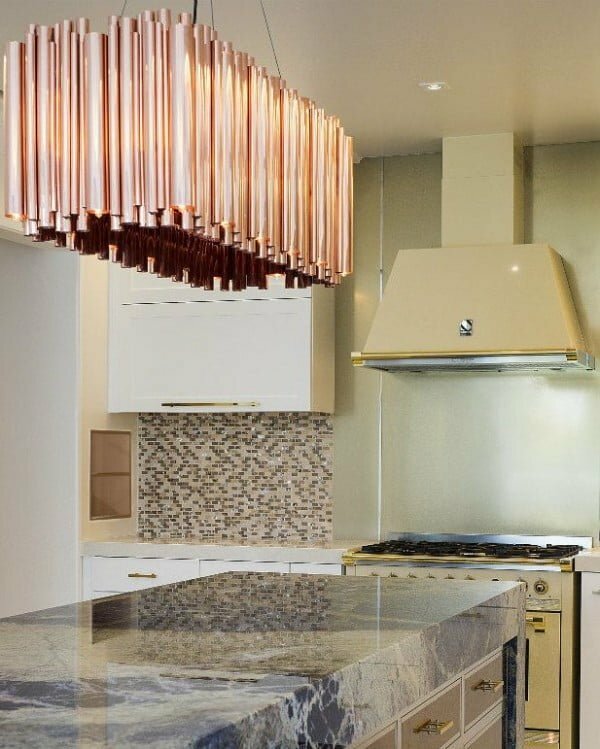 Elegant and matching finishes of cabinet pull handles, faucets and lighting fixtures in the kitchen and the bathroom give a luxe appearance. Change them to match or use spray paint to match the color at the very least. Wall to wall carpeting and big rugs make the room look soft but the hardwood or even laminate floor looks classic and elegant. That’s the look we’re going for so leave the floor bare and go easy with rugs. Built-in cabinets break the elegant forms of moldings and classic wall design. If you like big shelving space, use big floor to ceiling cabinets and secure them with crown molding. Ceiling embellishments are accents to luxurious decor. So make the ceiling stand out for an expensive look by embellishing the area around light fixtures with a ceiling medallion or vinyl decals. Decorating your home is a never-ending quest for new ideas to make it beautiful, original but that the same time functional and practical. Usually, it’s the small things and attention to detail that makes it work. Today, we’re giving you cool DIY projects and practical ideas to try at home, and we are sure you definitely haven’t tried at least some of them before. So go ahead and check them out to create your own Pinterest worthy decor. 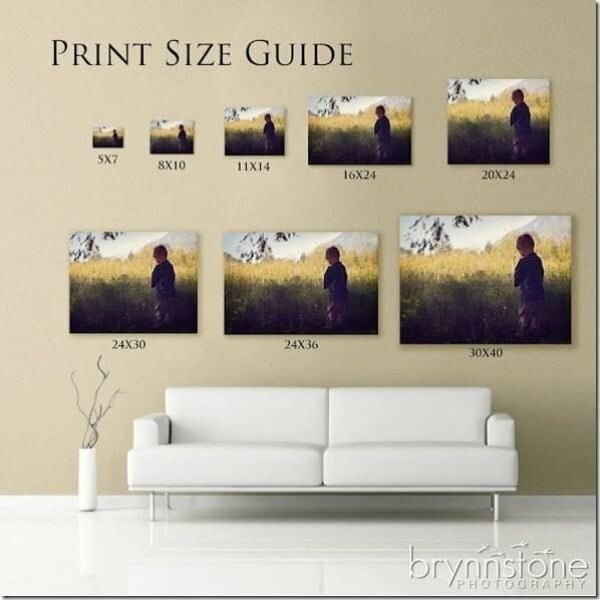 Missing a few more frames for wall art? 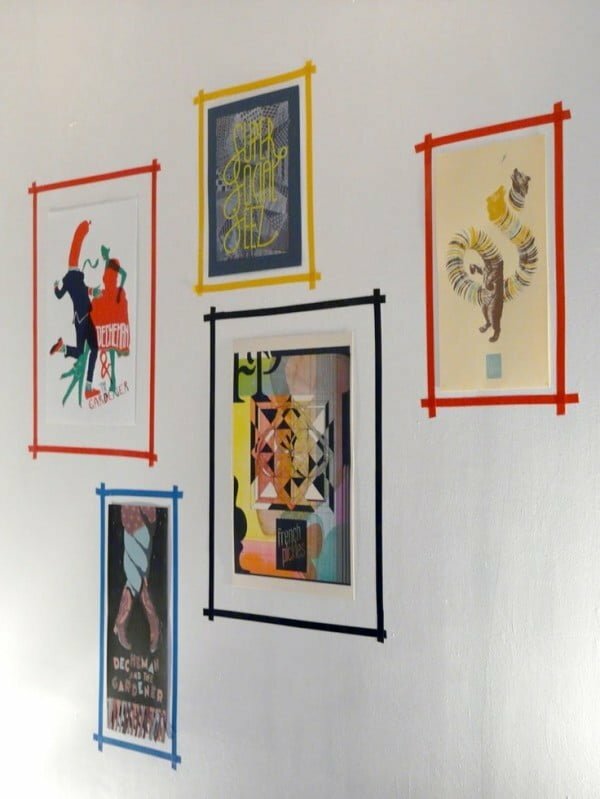 Don’t rush to the store to buy them, you can try using Washi tape for makeshift frames that look chic. Make a regular doormat extraordinary by spray painting it in a pattern. It’s a relatively easy project that requires only a can of spray paint and a stencil that you can make yourself. Add more style to your wall hangings by using a rope to hang an accent mirror or a picture frame. We recommend sticking to just one accent piece hung with rope, though. Put those perfume bottles on display in the bedroom or bathroom because they are worth it. You can even use a simple spice rack or even a cake stand instead of a special rack. Painting a sink in an accent color (especially apron sinks) is an easy way to make your kitchen trendy. Choose soft pastel colors that contrast with the cabinets and walls. A great way to prettify suspended shelves is using crown molding and you can even install one over the door for extra storage or display. Refresh that old cabinet, dresser or a table by embellishing it with custom patterns of thumbtacks. It’s a great way to add that glamorous metallic finish. Instead of regular vases, use vintage teapots when you bring fresh flower home to get a chic look. 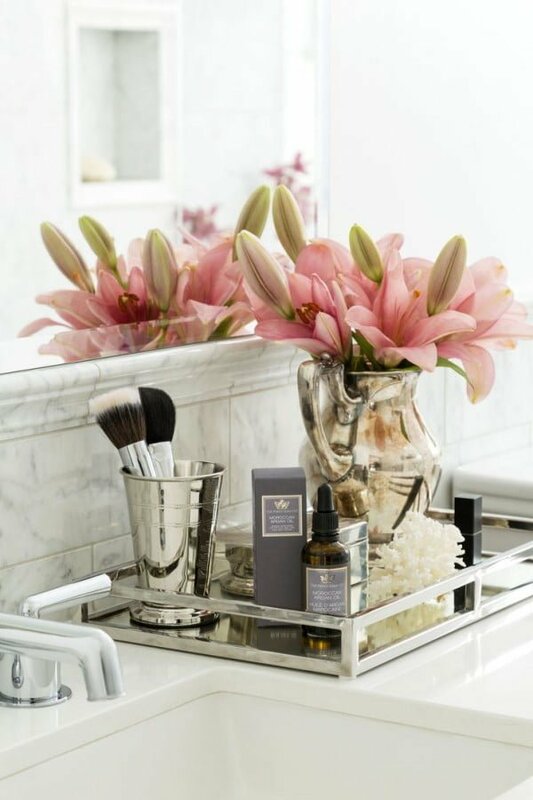 A lacquered tray elevates just about any vignette or an arrangement of items and can be used just about anywhere – in the bathroom, living room or the kitchen. Window sills can be turned into benches, tables, and nooks. And if your windows have no sills, you can still make use of that space by installing a DIY shelf against the window like this. Getting that trendy marble finish look is easier and cheaper than you think by simply adding a self-adhesive wallpaper to the tabletop. A big rug or carpet is a great decor piece that anchors the entire room but they can be expensive. If you’re on a budget, choose a seagrass rug as an affordable alternative that fits in just about any style. Nothing breaks home decor more than the eyesores like ugly switches, outlets, panels, vents, AC and heating units. Find a way to camouflage them. Wall art decorates empty space, but take a step further and besides the cliche art and family pictures add something creative. Think about something that would be a conversation starter, like this pebble art picture. A quirky accessory like these lanterns adds an instant coolness that attracts the eye. Dark tones create contrast and add drama to the decor. It’s not a tip for everyone but a great idea if the dramatic decor is your thing. A marquee adds a fun and interesting quality to home decor. Use it to immediately draw attention when entering a room. Wallpaper is a quick and easy way to create an accent wall or even just a fragment of the wall. Matching busy patterns takes a lot of practice and can create decor with a strong character. So don’t be afraid to experiment and take your time, you’ll get there eventually. TVs aren’t big ugly boxes anymore, so there’s no need to hide them. 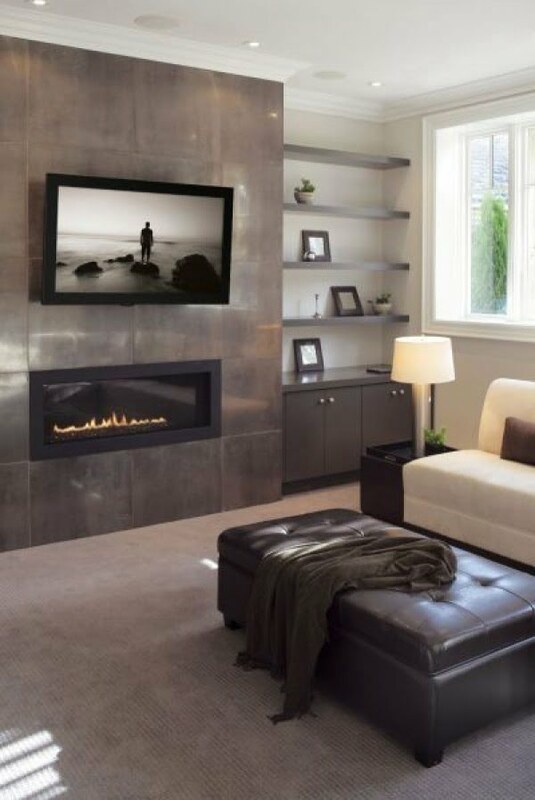 A new modern design TV looks good enough to be easily incorporated into home decor. Seeing a side table next to a couch or a chair is inviting to grab a drink and make yourself comfortable. Use them everywhere. There’s nothing wrong with a safe monochromatic palette and it actually has many benefits. You can blend in big furniture into neutral colors and make other accessories stand out. If it fits your style, by all means, go for it. Overthinking and following too many home decor rules results in cliches. Don’t try to make your home into something that can be found in a catalog, make it personal and all about you and what makes you comfortable instead. It may be a small room and pushing every piece of furniture against the walls might seem like a good idea but don’t do that. Pulling the furniture just a couple of inches away from the wall creates a better flow. Adding accessories in vibrant colors may seem like a risky choice but adding color in small pinches is an easier and safer way to do it. Look for small pieces of furniture, throw pillows, display accessories that add accent without being overwhelming. Don’t follow a single home decor style strictly unless that’s really what you want to do. Your home should represent you so give yourself a complete freedom to decorate the way you like. White furniture is great, it is classic and timeless, it gives a sophisticated vibe so naturally it’s a valuable decor asset. But keeping it white all the time can be a challenge, especially if you own pets or have kids. Enter washable slipcovers that can be bleached. Use them and you’ll be able to enjoy crisp whites in your living room without a worry in your head. 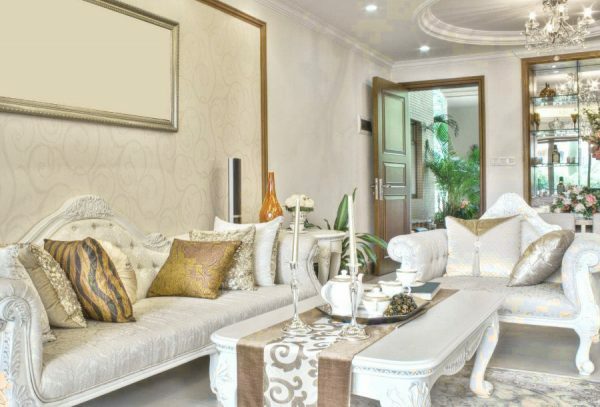 Neutral decor is appealing, it has a classic timeless quality that goes with any style. If you like to play it safe, a neutral palette will always be your go-to decorating tool. But neutral is not interesting, even boring. How do you go about adding interest without adding color (there are reasons why you’d want to avoid color)? 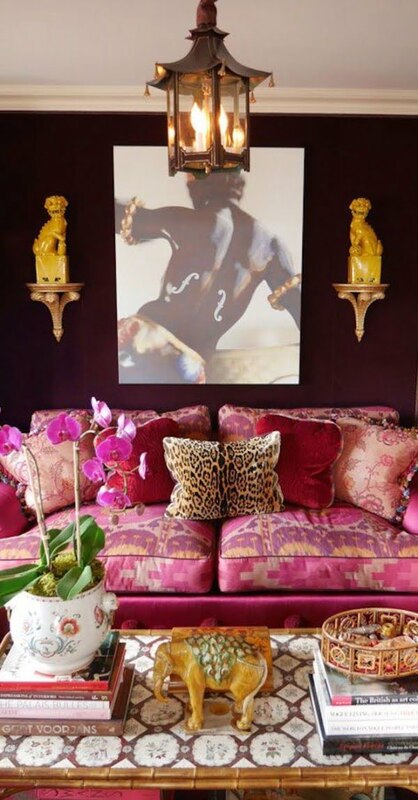 Use big statement art in the same hues but interesting shapes and patterns. The kitchen is where you spend a lot of time and it’s the place where functional design is very important. If you choose a tall table and pick high stools, it can double as the dining table and a kitchen island. The dining area in your home may not be the most frequented space so anything you can do to give it a second purpose is definitely welcome, especially if it’s a smaller home. How about double timing it as a work space? If there’s any reason why you wouldn’t be able to drill holes (or you don’t want to), a brilliant solution is hanging the curtain rod with command hooks that are easy to stick on the wall and remove if necessary. They have a whimsical decor element to them too. Curtains don’t have to be actual curtains and you may already have beautiful embroidered table cloth fabrics stashed away. Bring them out and hang them as DIY curtains to showcase beautiful patterns and save a little money. Accommodating a larger number of guests may be a challenge when it comes to seating. For one, you may not be able to store that many chairs at home and their costs can add up too much for occasional use. 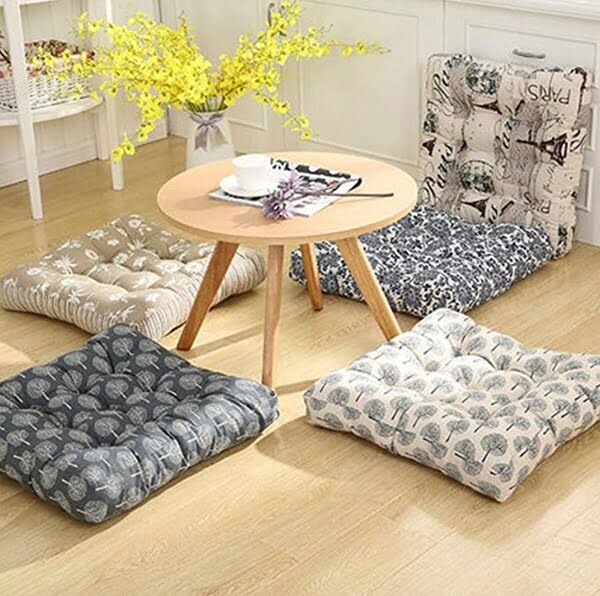 Even inexpensive poufs may not be enough, so when it comes to excessive seating, floor pillows can be a real lifesaver. There’s always plenty of dead space in any home, space that is just useless. 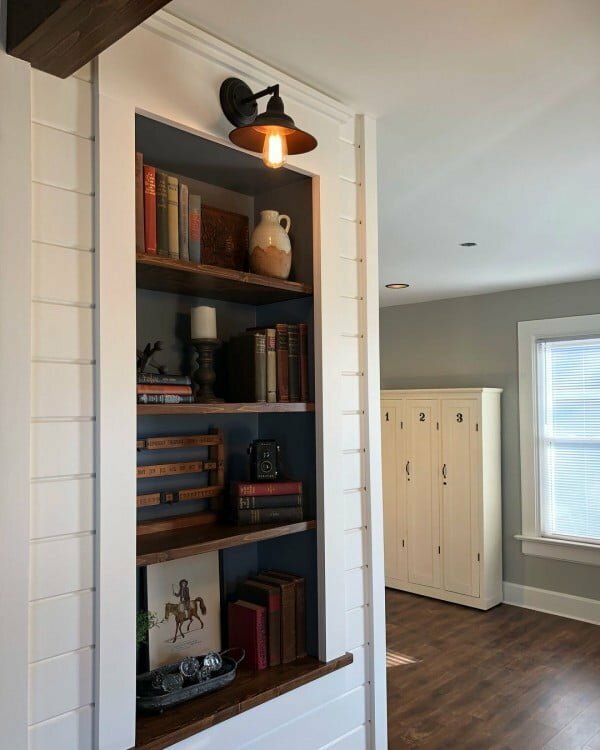 You can make use of it by hanging narrow bookcases and add extra storage. You can take advantage even of the most inconvenient space this way. Use jewelry for curtain tiebacks to add a little class. 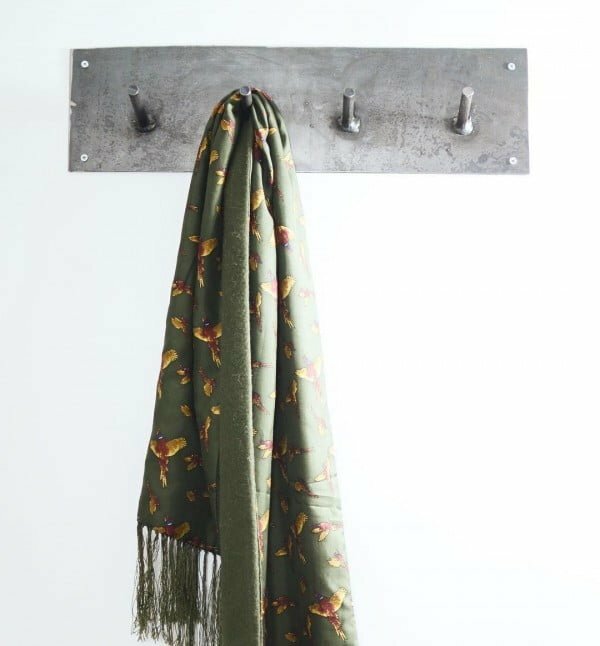 This solves two problems – curtain styling and making use of old jewelry that you may not have been wearing for a long time. When the horizontal space is lacking, there’s always vertical space to work with. Add shelving just below the ceiling to make use of it. Decorating with indoor vine plants is increasingly popular as an option to freshen up interiors and we love this trend. It’s a great way to make your home decor interesting for many reasons. Firstly, live plants add a very positive note to space and there are so many creative things you can do with vines. From simple but meaningful decoration of shelves and walls to a brilliant indoor trellis that makes your home come alive. 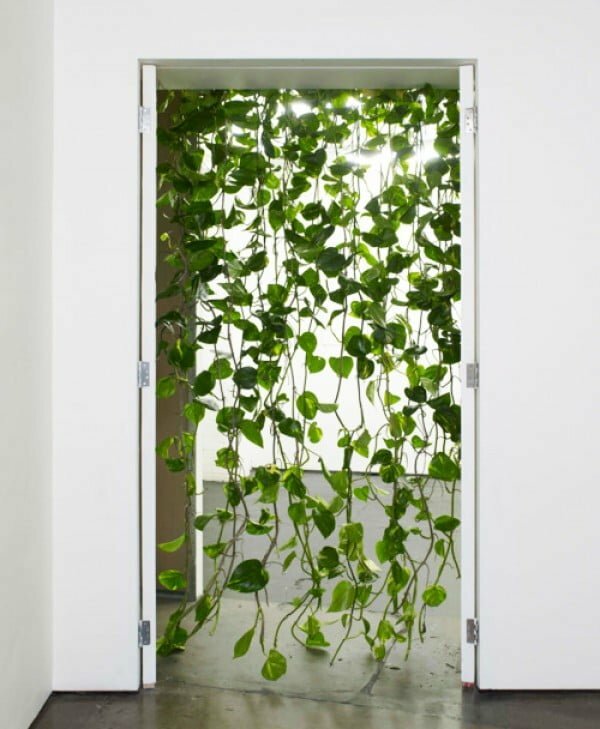 Check out these ideas and consider adding indoor vines to your home decor as well. 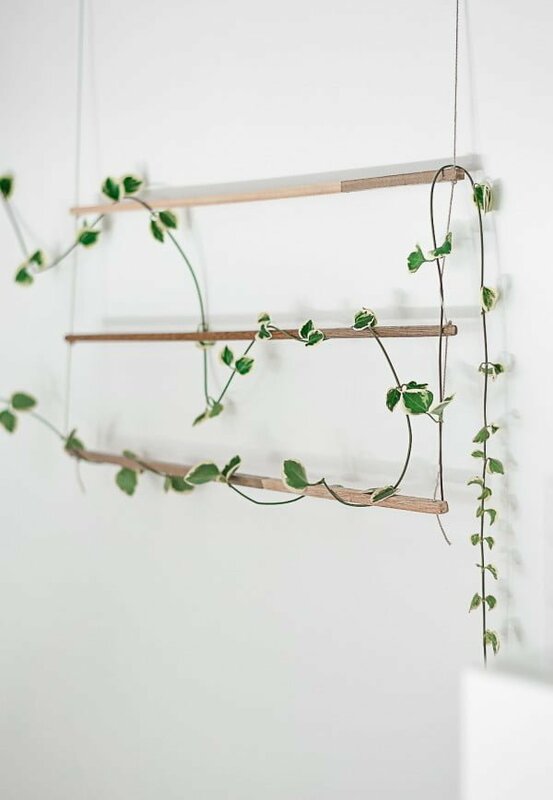 A simple way to decorate a shelf with vine is to let is sit and grow down freely. It especially adds substance and interest to open shelves. 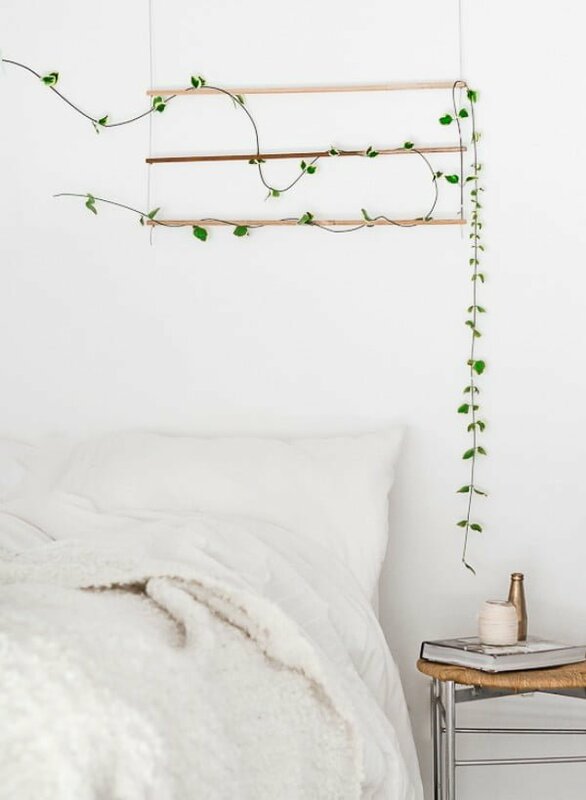 An interesting structure for an indoors trellis like this lets a climbing vine decorate your wall as good as any decor piece. 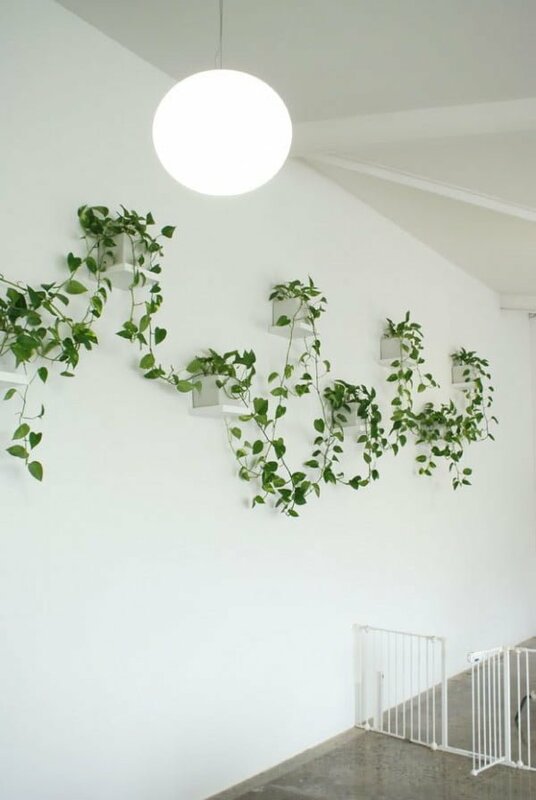 Simply hanging planters from the wall or ceiling is a quick way to add a vine plant in just about any corner of your home. And what a great option it is. 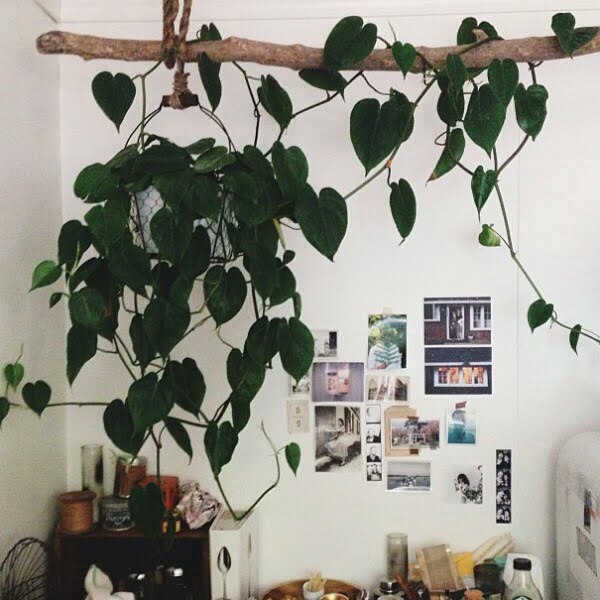 This is one of the most creative ways to decorate your home with vines. 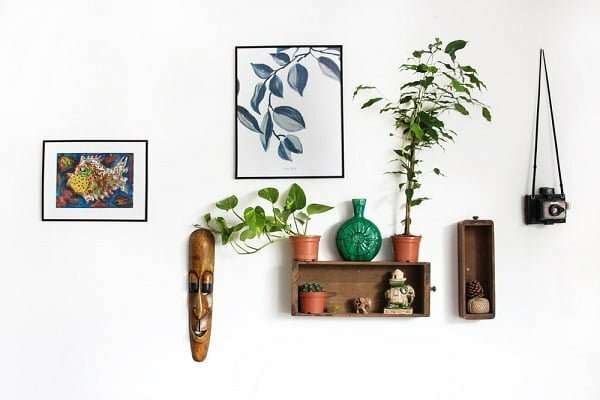 A picture frame that incorporates a planter is a whimsical and an interesting way to add plants to your wall decor. 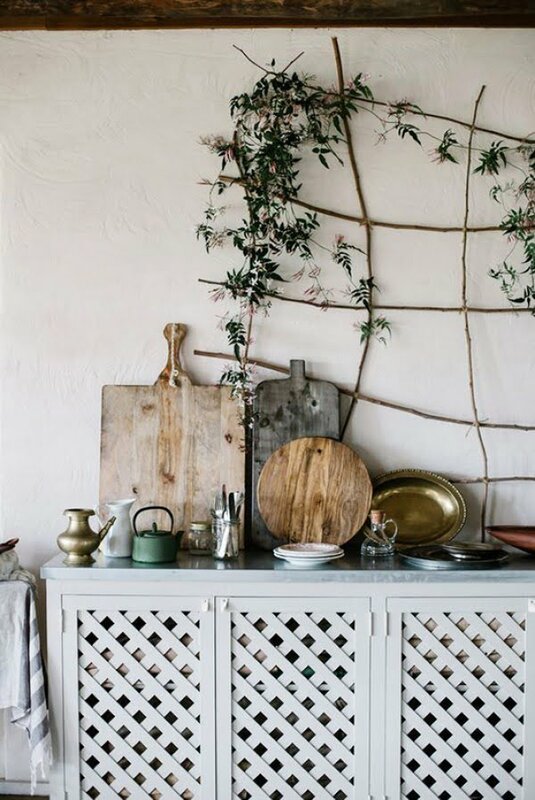 We absolutely love this quick and easy trellis for the kitchen wall. It’s made by simply tying branches together in free form and it makes the perfect structure with a lot of decor interest in rustic style. Positioning suspended wall planter shelves gives you a way to create creative wall decor compositions with vine. 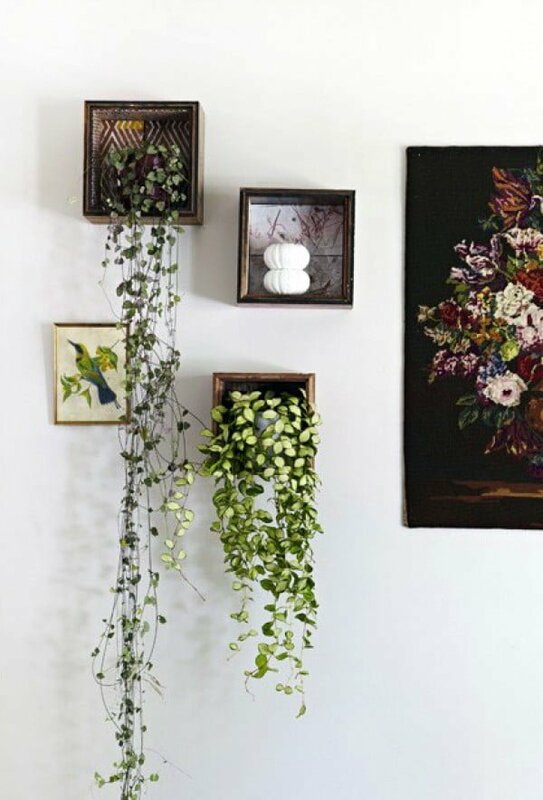 Hanging a vine plant in a corner of a room softens the edges and removes the boxed out effect. 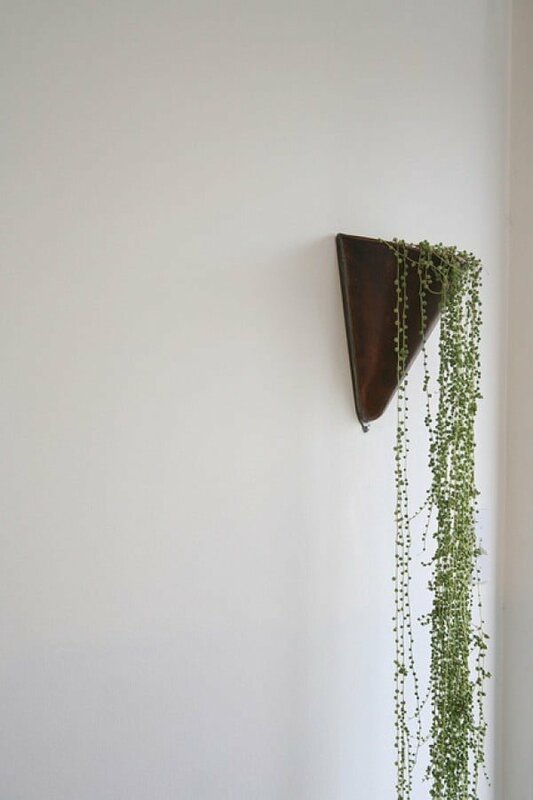 Climber vines can also further add to wall decor. A rustic beam provides a place for the indoor vine to grow and it makes an excellent decor accent. It works really well in minimalist decor. An indoor trellis can come very simple. 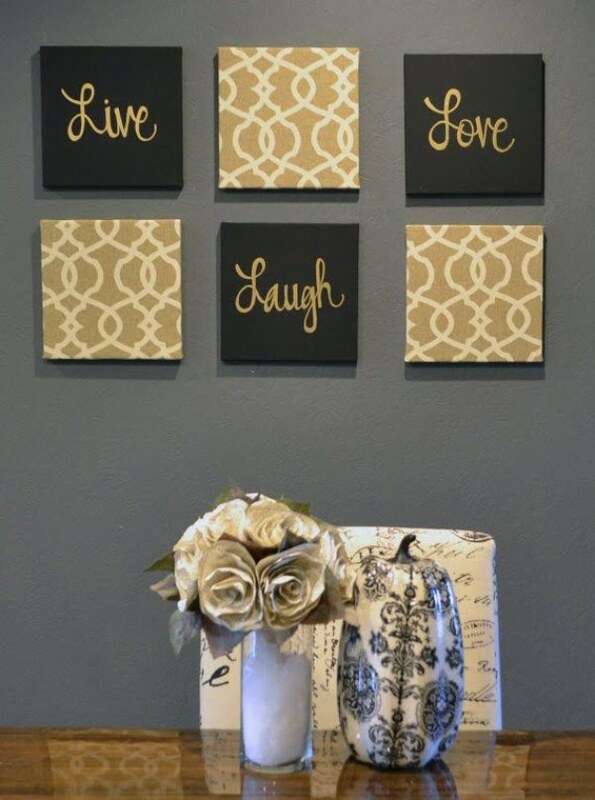 Here’s a DIY option that you can easily make for wall decor. Having enough natural light in the bathroom gives you an option to grow plants. Indoor vines look really great in this space. If you’re looking for a shabby chic accent for your home decor, try bringing an outdoor vase inside. It’s unexpected but very appealing. This idea is simply brilliant. 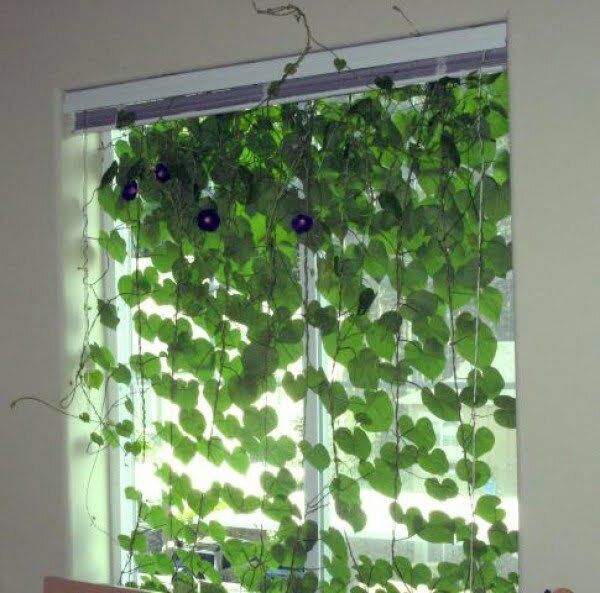 Grow indoor vine in the window to create a live curtain. Vine can easily decorate an entire wall in its natural pattern. It gives the decor an instant boho vibe. Growing plants that need lots of sunlight close to the window is necessary, but you can take it further with vines by letting them embrace the window frame itself. A simple bookshelf placed in this position is boring but adding vine to it changes the look completely. It’s a great example how plants can transform home decor. 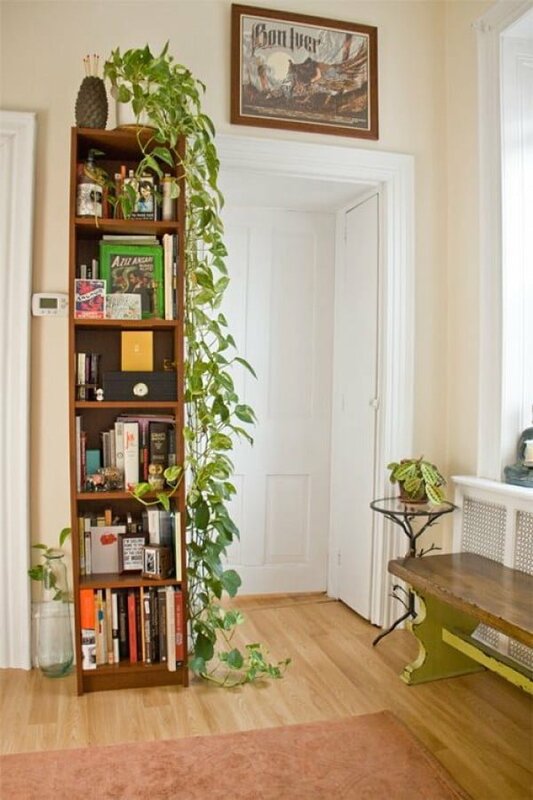 If you need to separate space with door curtains, try a live vine plant. It’s a committing project but it may be just what your home decor needs. 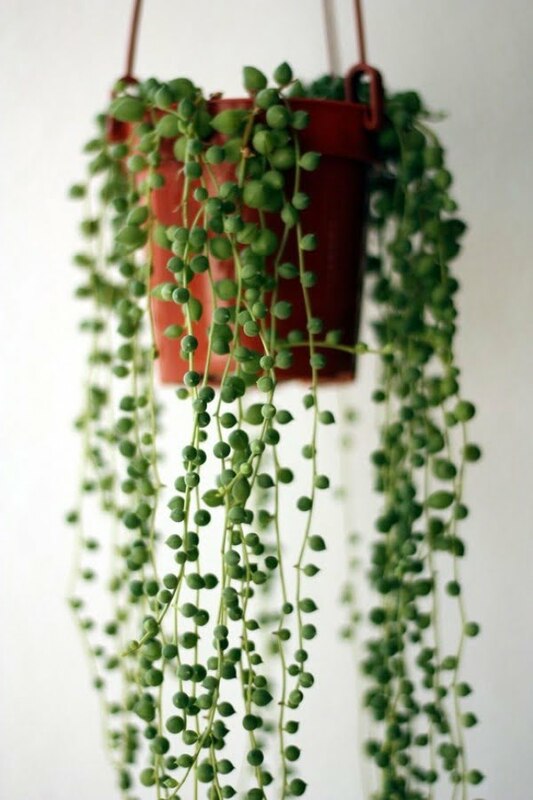 A simple wall mounted planter with a delicate string of pearls vine is a things of classy beauty. Natural light in the bathroom gives you another option to use the shower curtain as an indoor trellis. Simply brilliant. 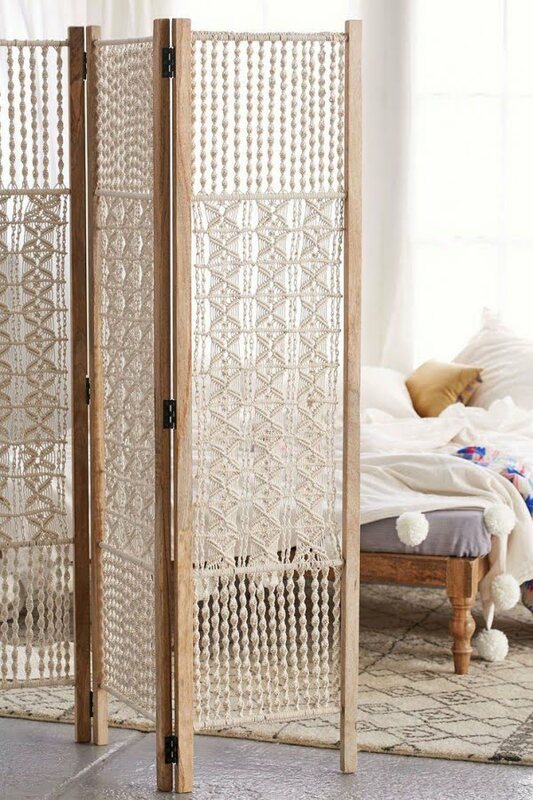 Create an accent headboard with a vine trellis in your bedroom. This simple idea can completely transform your room with minimal effort. Letting vine grow freely on the wall is perhaps one of the easiest ways to decorate an empty wall without having to resort to boring wall pictures. 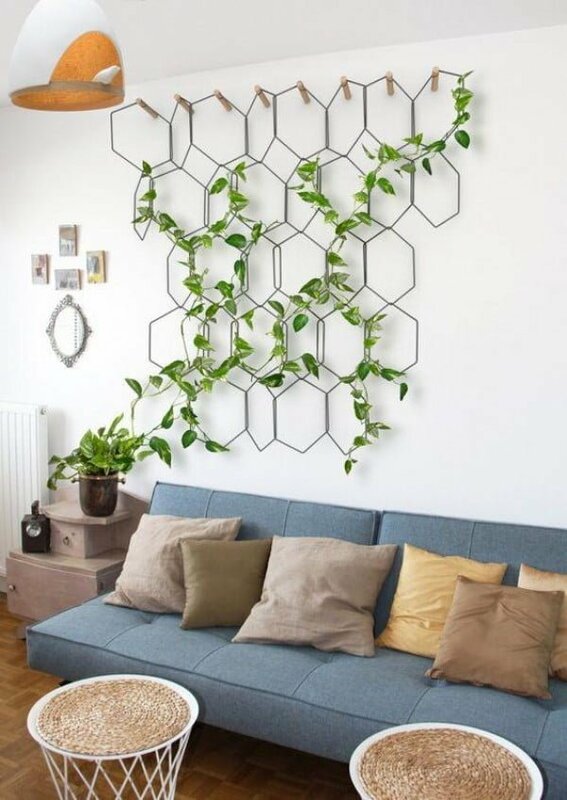 Here’s another indoor trellis structure for wall decor. Install it and let the plant do the rest. 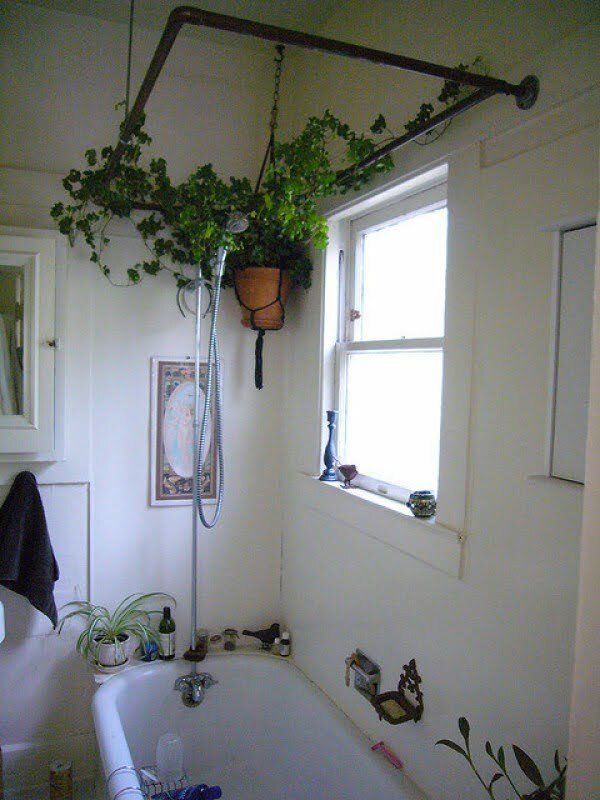 Bathroom decor comes alive with the help of vine plants. Indoor vines look particularly interesting in industrial style decor with some modern elements. If you care to commit to growing a fruit tree or two (like citrus trees), you’ll be rewarded not only with fresh greenery and pops of orange and yellow, but delicious natural scents too. Have a creative side that needs to be fulfilled? Try creating a gorgeous mini harden that can live on a window sill. Succulents are perfect for this but you can use any type of houseplants. 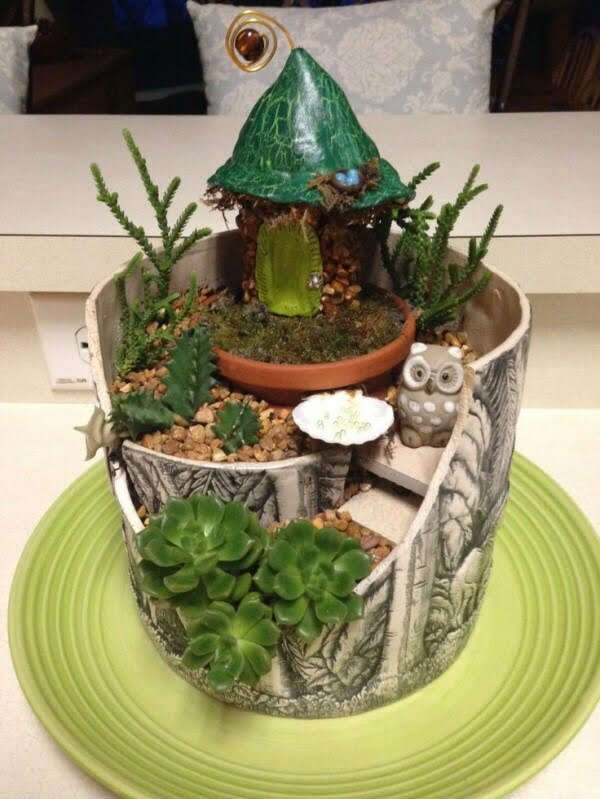 Check out this gallery for mini garden ideas. Your old teacups make perfect planters for small houseplants. Pick vintage cups for a wonderful addition of pops of color and patterns. 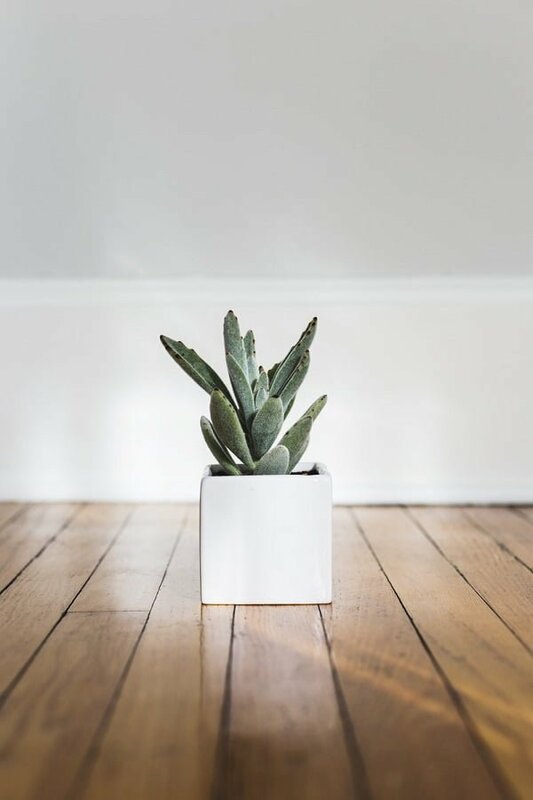 And if you do not care for a big plant which can be quite committing, simply put a smaller houseplant on a stool or a side table and place it in the corner. Houseplants are great for your home decor (especially in spring) but orchids have a special place because they add elegance and they can last for months. If your home has window sills, it’s a no-brainer to put at least one plant on every sill yet it’s so often forgotten. And even if you don’t have the privilege of window sills, you can still place houseplants near the windows where there’s plenty of light. Growing your own herbs is not only healthy but has great decorative value if you use, for example, suspended wall pods. Whatever you do, always research your plants before you bring them home. You have to make sure the conditions in your home are sufficient enough for any specific type of a houseplant to live. Here are a few tips on making sure you can keep them alive. We all want to make our home look beautiful and unique, personal and one of a kind, a place where we would feel cozy but which we could also show off to our guests. And sometimes the quest for the perfect home decor goes a little bit crazy. Sometimes a home decor project becomes an adventure in its self. And that’s not a bad thing, because even crazy ideas sometimes work wonders. I’d like to invite you to be just a little bit more adventurous in your next home decor project and don’t be afraid to do something out of the ordinary. Greenery brings life home and you don’t have to limit yourself to tabletop pods and vases. Suspended from the ceiling pods may look a bit crazy but this setup allows you to have plants in places otherwise inaccessible. Bring some nature back to your home with dry branches. 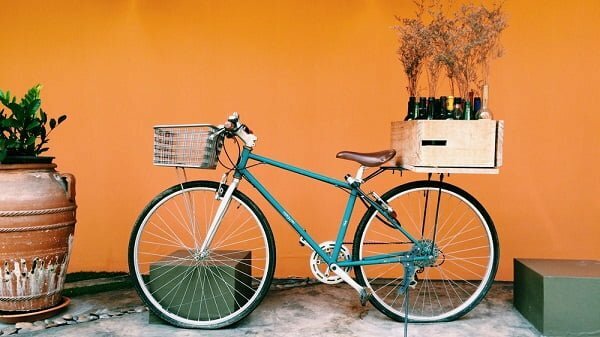 It’s not the first time this bicycle makes an appearance in my articles, and it’s just so crazy that it works. They come in lots of shapes, forms, and arrangements. While you don’t have to go as elaborate as this particular design, some irregular form will mix things up. Those steps provide enough unused estate to paint, color, wallpaper or even graffiti. Add shocking elements with handcrafted furniture and decorations. 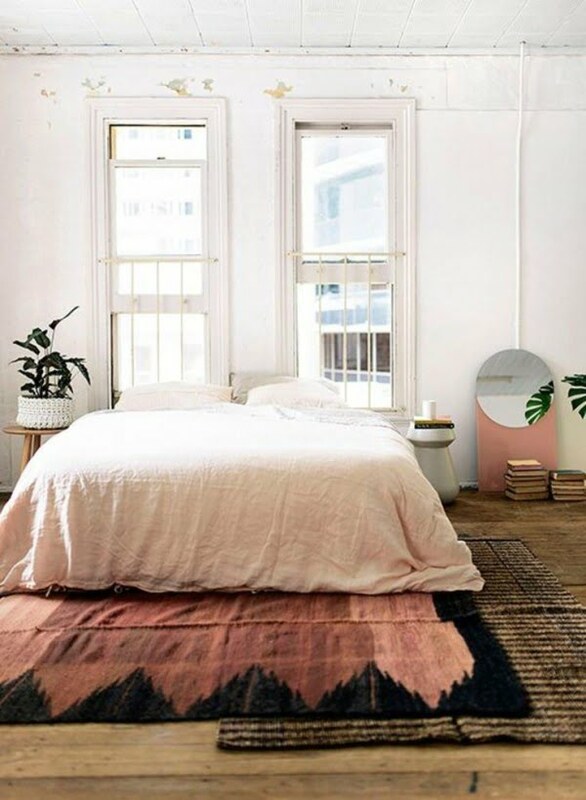 Pick a theme and stick to it, like this bohemian jungle bedroom decor. Overuse of gold spray paint may seem a tad crazy but that’s exactly what we want. Do you have a collection to show? Don’t be afraid to turn your room into a mini-museum. You might get vertigo seeing this wallpaper pattern but it will surely leave an impression. I’ve always found those things a bit crazy but perhaps that’s what your interior design needs. How about putting a sign over each door in your house to tell which room is which? Your guests will never get lost. If you’re anything like me, you have a big mug collection too. Don’t hide it in a cupboard, create a mug display wall. Check out our other DIY mug rack ideas. Enjoy the light show every sunny afternoon. 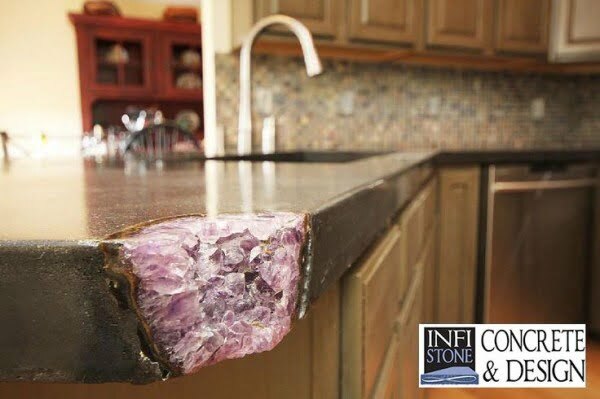 Kitchen countertops come in many materials, and if you get one made of, say, amethyst, you can show it off with a broken corner. This idea works well in the kitchen or the bathroom, or wherever you lay tiles. 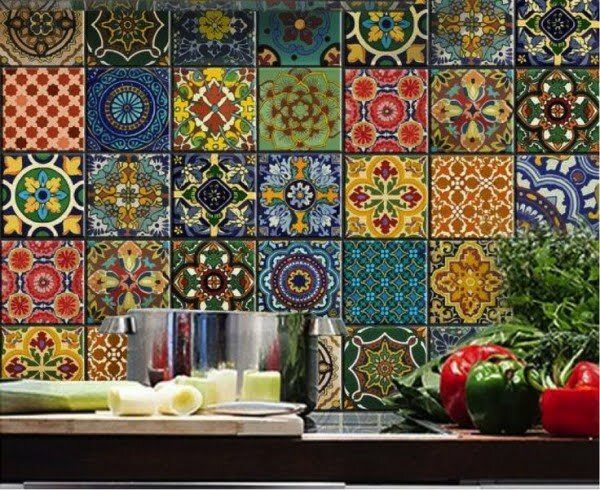 Instead of a single tile pattern, use a variety of different tiles to create a wonderfully crazy mosaic. Experiment, break the rules, don’t be afraid to really go crazy, that’s how real art is born. The door doesn’t have to be empty, it’s a canvas waiting to be used for something great. That’s right, you can get live plants on your walls. Ceiling medallions aren’t just for embellishing the ceiling, they make great DIY wall art especially if painted in accent colors or soft hues. Whichever way you go, you can pick up some pretty stuff and use to fill up those walls. 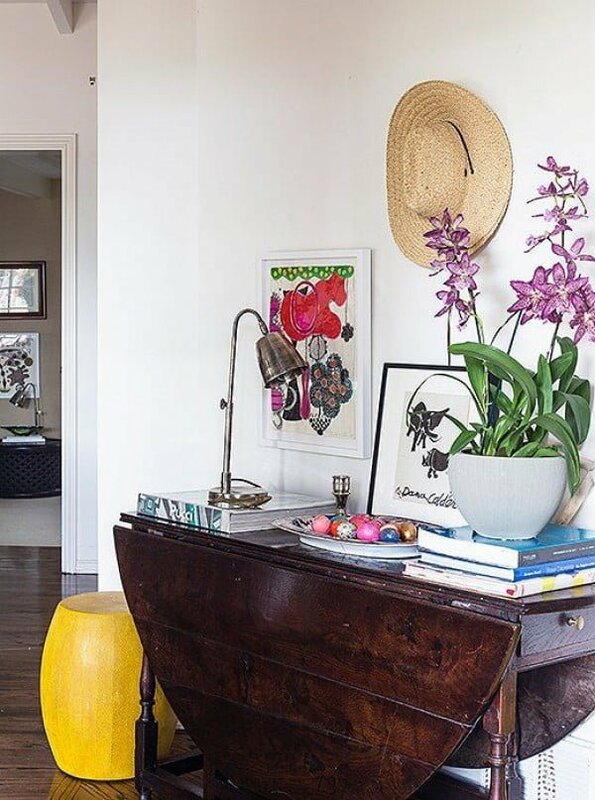 Yellow as a color has a psychological effect of making you feel happy so consider adding some accents in this color. You don’t have to paint the entire walls yellow, but if you can get a piece of furniture or just add some yellow accessories around the house it will have a positive impact. Breaking the status quo makes people happy. You don’t have to take on a full remodeling project to make your home a happier place, even if you just rearrange the furniture it will brighten you up. The key here is making small changes from time to time. A cluttered home is an unhappy home. Organize your stuff so that you don’t have random items lying around your house. Read about how to organize small things and other ideas for storage. Bulky and busy pattern furniture make the room look heavy. Keep it light and neutral for a brighter mood. You don’t even have to commit to building a window sill nook or a built-in reading nook. Even if you just push a couch or a bed to the wall and throw some pillows on for seating, a cozy little corner to crawl up into with a good book can be a big mood booster. More light means more happiness. So take full advantage of your windows, let in as much natural light as possible, use mirrors to distribute it around the room. Take care of your lighting, update your light fixtures and use shade lamps to create the perfect lighting. Your home will make you happy only if it’s your personal space. Learn how to make it personal and original. Live plants and flowers bring the spirit up so get some pods with greenery and flowers to liven your place up. Bright colors, especially white, lift the mood up and make everything look lighter. Consider painting the walls white especially if the space lacks natural lighting. You don’t have to wallpaper the entire room (and probably shouldn’t) but you can create an accent wall, a kitchen backsplash or even a bookcase backboard with wallpaper to set the mood. Yes, more bright cheerful colors make the place look happier, and you don’t have to commit to painting, it can be just small accessories like throw pillows that bring color to your home. 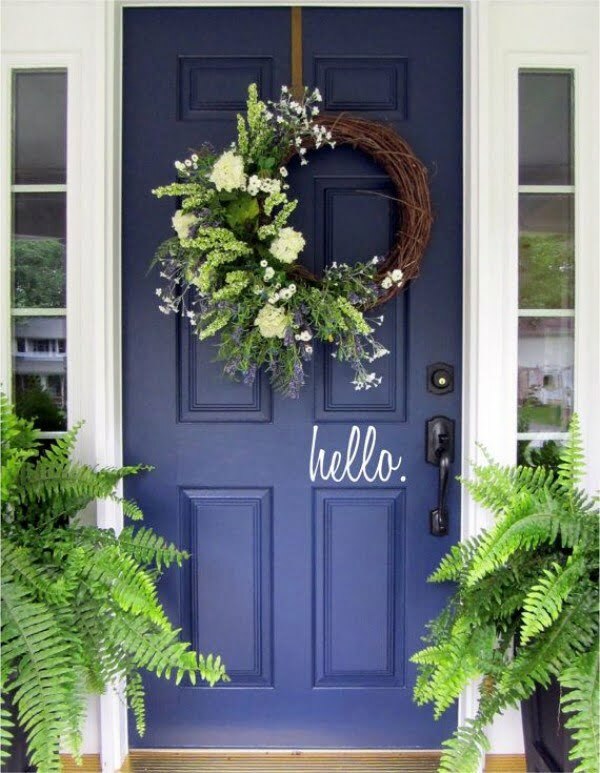 The front door is the first thing your guests see so you can use an accent color or even vinyl decals like in this example to set an uplifting mood even before entering the house. Accessorizing is a big part of home decor but take it a step further and use accessories with a double purpose, like this dog statue used as a hat rack. This whimsical and surprising accent is a real mood setter. You can use more shiny objects around the house to make it more fun, a gold spray paint is an easy way to do it. You can quickly and affordably transform the space with the right curtains. We even have a number of ideas of curtain styling for you to choose from. Breaking out of a uniform style is a trait of home decor with character. So get a piece of vintage furniture, or go the other way and get something very modern. Character is all about display. Think in terms of every item as a display item, be it throw pillows, bottles, books or pictures. Use open display cabinets and create vignettes. Remember, you don’t have to do this all in one day, your home style evolves over time as you add and remove things. A decorative clock is a strong accent that’s both, functional and giving character. 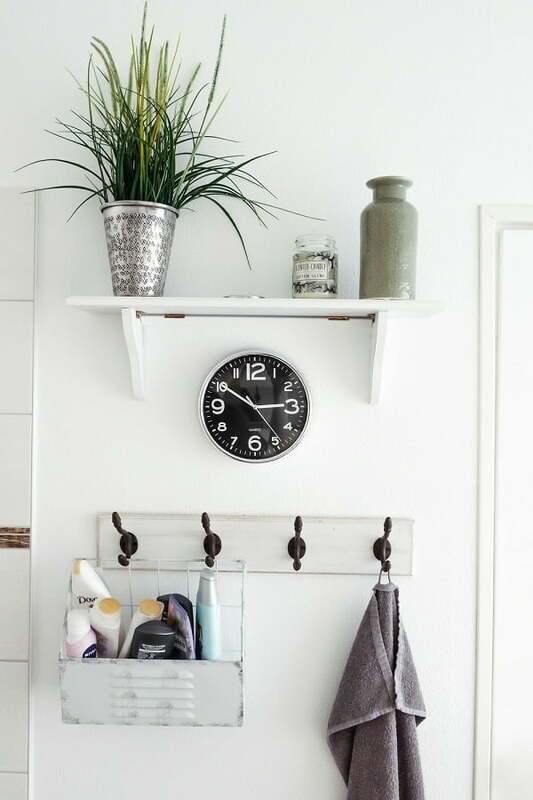 Consider having a clock in every room (even bathroom). Unused space is unflattering and it’s the perfect place to create character. Use it for storage, houseplants, create vignettes. Try to go for something whimsical and unusual. Cabinets all in one set are boring and do nothing to add character. Mix and match different cabinets, and if it’s too late (or too expensive) for that, paint them different accent colors, or even just replace the pull handles of the doors and drawers. If your home lacks architectural interest, you can make it more interesting by dividing space with detailed folding screens, curtains, or panes. They are quite easily installed and aren’t very committing, so you can experiment and remove them if you aren’t happy with the result. This small element is often overlooked as we tend to focus on window dressing, but installing a fancy curtain rod would make an unexpectedly brilliant accent. If you have inset style doors somewhere in your home, be it cabinets or room doors, add pattern panels to them and transform the look completely. Usually we like to soften the edges of a room, but we can go the other way too and put an accent on the edges to add architectural interest. 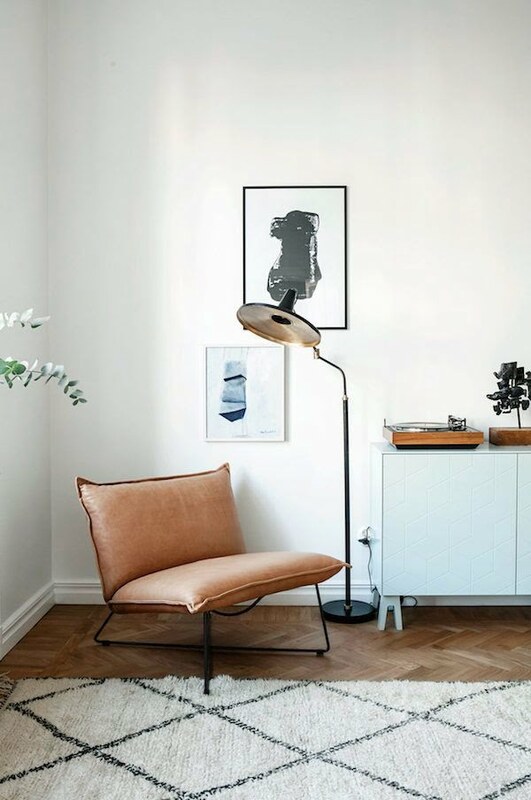 We are used to seeing light fixtures at the center of the ceiling or over dining tables, but a fixture in a corner over a reading chair is rather unexpected but flattering. Framed pictures and art prints are great for wall art, but framed silks add that extra dimension and whimsy. 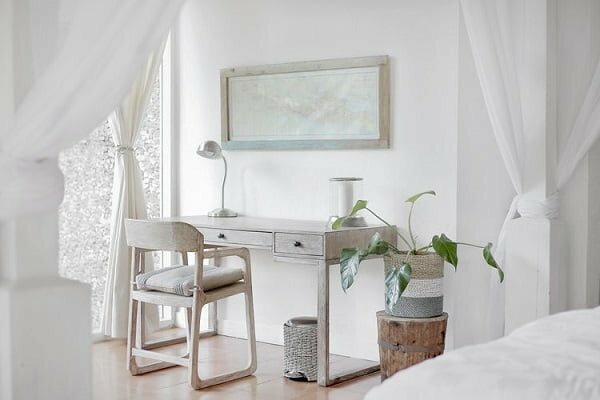 It certainly is unexpected and rather ironical to use a chair for a nightstand, but it’s cheap to pull off and it gives your decor that chic look. Chests come in so many shapes and styles, there’s no reason why on wouldn’t make a great coffee table. It adds style and it’s functional. 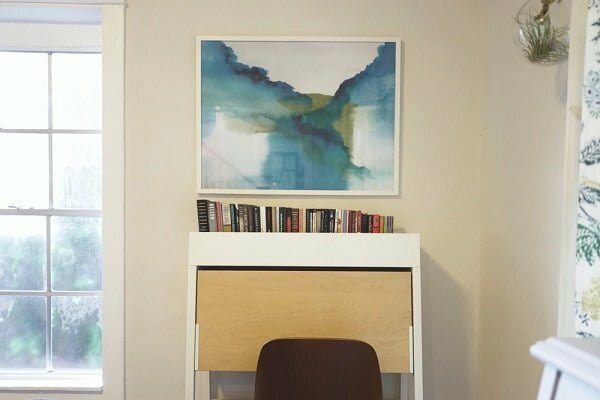 Add more depth to a bookshelf by hanging a picture in front. It brings the look together and you can hide any eyesores behind it. Getting that marble finish look is easier and cheaper than you think by simply adding a wallpaper to the tabletop. Bar carts are great and all, but they are quite a cliche. Instead, why not turn a bookshelf into a home bar? Want an extra chic look? Use coat hangers to hang wall art. It’s certainly unexpected, not to mention cheaper and easier than finding the right frame. Use an old picture frame to hang vases with flowers on a wall. Extra points if you find a vintage frame. If you have kids, don’t try to hide that fact by keeping kids’ stuff away from the “grown up” rooms. Integrate some children books and toys around the house in vignettes and make it part of your decor. Make it fun for your kids and yourself. Make the entry way interesting by adding decorative hooks that will serve to hang your clothes and bags while filling in that empty wall. Bring your fashion clothes and accessories out of the closet and use them to decorate in a fun way. An amazingly simple but fun way to keep your jewelry is using old or vintage dishes as a stand by simply stacking them. You can use it on your vanity, bathroom or put on display in the living room as a whimsical accent. Here’s an easy and inexpensive alternative for a headboard. Install a curtain rod above your bed and hang a fabric such a quilt over it as a decorative headboard. You may not always wish to have all of the shelves open for display. In that case you can add little shelf curtains and add a pop of color or accent pattern at the same time. It’s hard to say which part of home is decorated the least but some things are really often forgotten. This creates a great opportunity for you to be creative and unique. After all these two qualities require you to do what others don’t. One of the most overlooked parts of home are the doorways. 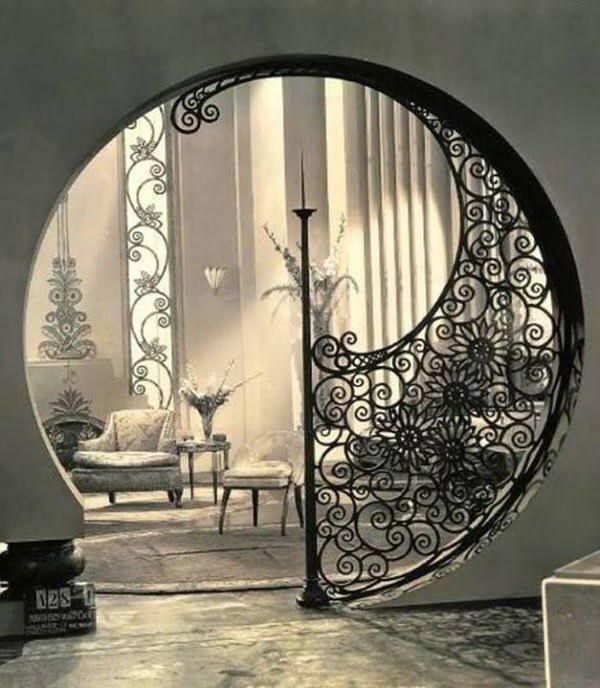 Sure, if the doorway has a door at all, it has some kind of design. But the doorway itself is left without an accent while there are so many things you can do with it to improve your interior design. This is a classic example of a doorway that matters. Done in 1930s the architect of this home had a plan from the start for a remarkable doorway. Paint a door in soft washed out pink (which is what rose quartz really is) to create instant whimsy in your decor and make it anything but boring. The combination of soft pink and metallic brass or gold oozes sophistication. A soft hue can be seen as neutral almost like a creamy white but it still maintains a touch of luxe. Do you want to be trendy without committing? 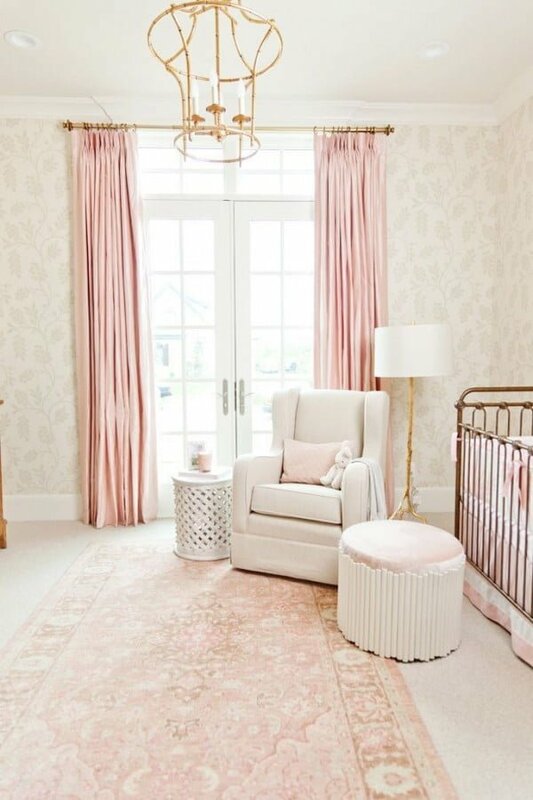 Choose a rug in large pattern and soft pink hues. A blend of two trends – rose quartz and metallic brass or silver hardware gives your home a well rounded sophisticated look. 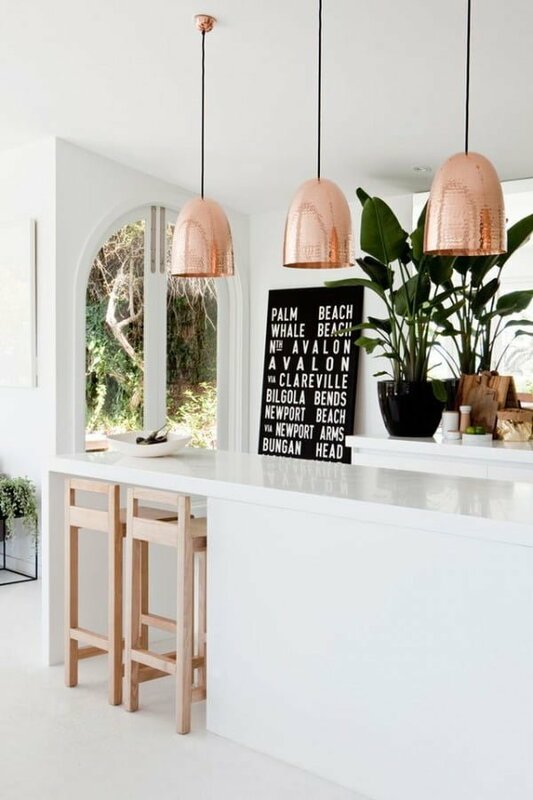 If you want to use it as an accent, get a metallic lamp and a washed out pink chair for a quick and trendy look. You may be as brave as painting your walls pink and you have two choices here – make a small accent wall or paint the walls with just a touch of pink hue that can be considered neutral. Use metallic finishes to complement the look. Whether you get a real rose quartz material countertop or use a faux one, the pattern and texture will make a strong sophisticated accent, especially when used with dark cabinets. Furniture in a very soft pink hue, again, can be seen as creamy neutral but still add a little class to your living room. It pairs really well with another trend – hardwood floor in a warm grey finish. If pink paint or furniture is simply not your thing, you can add little trendy accents with good old accent pillows. It’s simply too easy not to try. Another easy way to add pink accents to your home is by getting wall art that incorporates pink hues. It’s not as bold but sophisticated enough. Rose quartz as a material is perfect to accessorize, such as using these wonderful candle holders that you can add to any room’s decor. Another way to be trendy in a small but still meaningful way is to add dashes of rose quartz color in DIY projects and other small accents. Don’t forget the bedding and get a throw or covers in rose quartz or other soft hues of pink. Pair it with dark grey or black pillows. Looking for a striking accent? Play with door styling. For example, add an unexpected accent by painting an edge of the door. 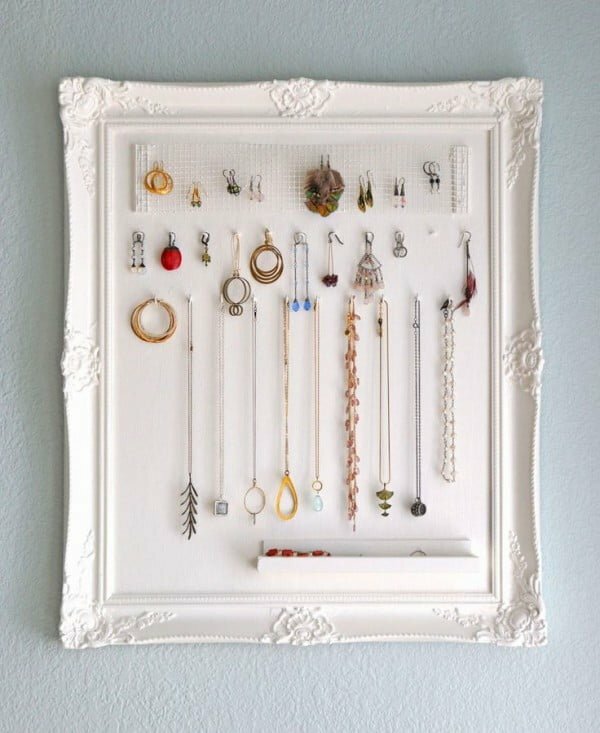 This little project isn’t just a jewelry organizer, it works as a wall art accent too. And it’s pretty easy to make following this tutorial. Do you have random kitchen tools and items lying around the countertop? Add some quick organization and class by using a simple cake stand to store them. Do your doorknobs require some styling? It’s an easy way to add little accent around the house. 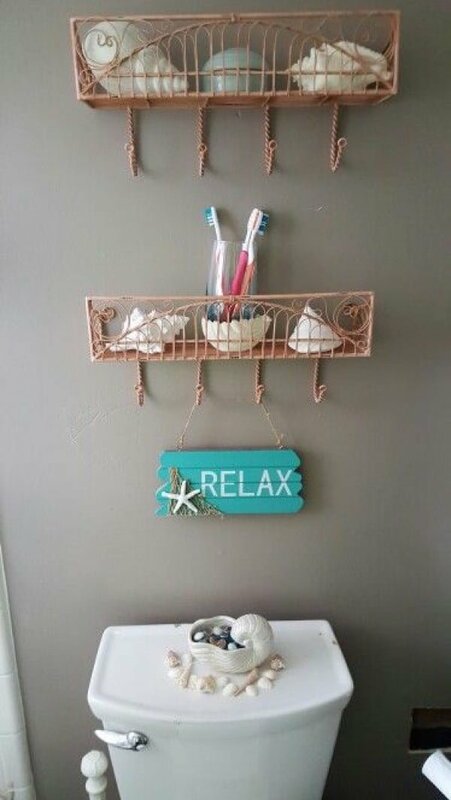 Simple storage shelves look that much better with decorative brackets. Drawer organization is not a trivial matter. Diagonal division, for example, is a more efficient way to use space. If you have a windowed door, a very quick and easy upgrade is to use a vintage pattern fabric as a shade. Replacing drawer handles is easy but you can add very appealing accents this way. I strongly believe that your home must have something handmade by you. Creatively painting a chair with fabric paint can be one of those things. And it’s really easy to do. If your home has a home office or work area, you can spice it up with this furry chair design. Leave a half painted wall, incomplete patterns, to throw off the look and get an unexpected bohemian kick. Normally the focal point is at the eye level but put it up high and it makes the ceiling look higher and the room bigger. Try it out and see if it lifts chins up. 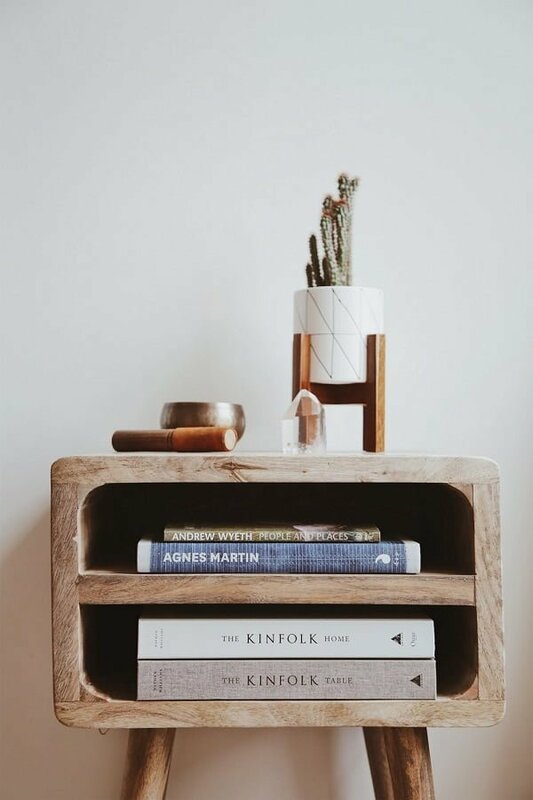 You may have bundles of books stacked on the coffee table or a shelf, but an entire bookcase stacked horizontally has a powerful off beat look. We usually hang art at the center of a wall to conform to the rules. What if you broke that rule and hung art in a completely unexpected place? The matter of fact is that there are many ways to create a gallery and you’re free to do it creatively. Step it up a little further and hang pictures on cables and lines from the ceiling. It will draw attention and give a very different outlook on the wall art. Yes, you can absolutely do that if it feels convenient. Just make sure you don’t put high furniture in front of a window and don’t block the light. It’s amazing what effect an accent wallpaper on the backboard of a bookshelf has. It’s almost a must do, yet few people are even aware of the idea. When you’re not watching the TV it just sits there in a blank screen. What if you turned it on and programmed it to display art? Look up and what do you see? If it’s just an empty white ceiling, you can do better than that. Add vinyl decals around a light fixture as ceiling embellishment. Instead of using the same old boring glass and ceramic flower vases, you can use rope to make a striped flower vase. This is a simple craft project which can be implemented by beginners. All you need is a piece of rope and glue. Apply some glue onto the outer wall of the vase and wrap the rope tightly around it. This will give the vase a rough texture which will be in perfect harmony with the soft flower petals. You do not need to use expensive metallic door and drawer handles in your home. A simple rope cut to the right length can do the job. You can tie the two ends of the rope to the drawer and use it as a drawer handle. The same idea can be applied to wardrobe door handles. In addition to being an inexpensive option, using a rope door handle will add to your home decor. Instead of using metal in staircase handrails, you can use a thick piece of rope running from the bottom of the staircase to the top along the walls. In addition to offering guidance and support the rope handrail will add to the interior decor of your home. Toys don’t get enough attention in home decor and that’s a pity. 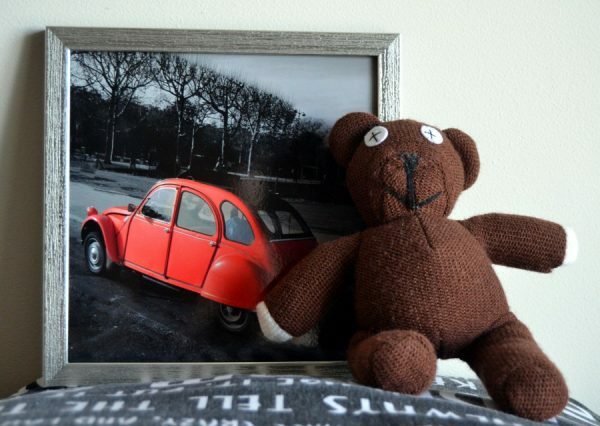 Cute and lovable toys can make great accents, especially if they’re vintage. And if they come from your childhood, their value is priceless. 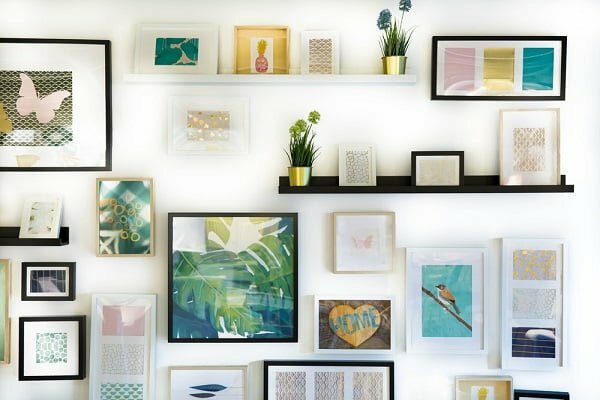 Of course, you already have family photos on display somewhere in your home, but take it a step further and create wall art dedicated to your family and photos of your most important memories. At first, it may sound like a cliche – we’ve seen seashells being used to decorate bathrooms far too many times. But if those seashells come from your travels, they have sentimental value that beats all cliches. When it comes to traveling, try to get in a habit to make memory jars to be filled with memorabilia after each journey you take. They will make great display items and bring back the memories every time you see them. Kids grow up so fast, take the time to frame their drawings and capture those moments that will soon be left only in memories. Whatever it is, a piece of furniture or a rare piece of art, don’t stash it away, keep it on display if not for the looks, then for it’s priceless sentimental value. Your first home will always have a special place in your heart, so frame it for a piece of art. You can also do the same with your childhood home key. The ideal unique home decor ideas ensure that the room space is comfortable, functional and aesthetically pleasing. More importantly, they capture the imagination of guests by standing out from the rest. This objective can be achieved without spending large amounts of money on a budget. The task can even be handled as a cool DIY project. We’re all looking after the most unique decor ideas to make a house a home. They can be anything from small accents to an entire theme. In any case, they have to be doable and not just material for interior design magazines. 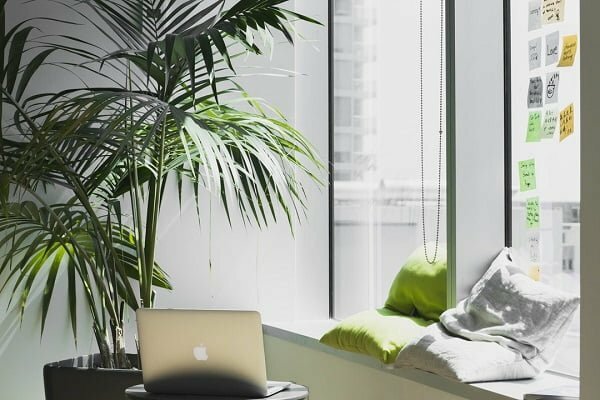 So here is our collection of 30 unique home decor ideas that you can choose from! 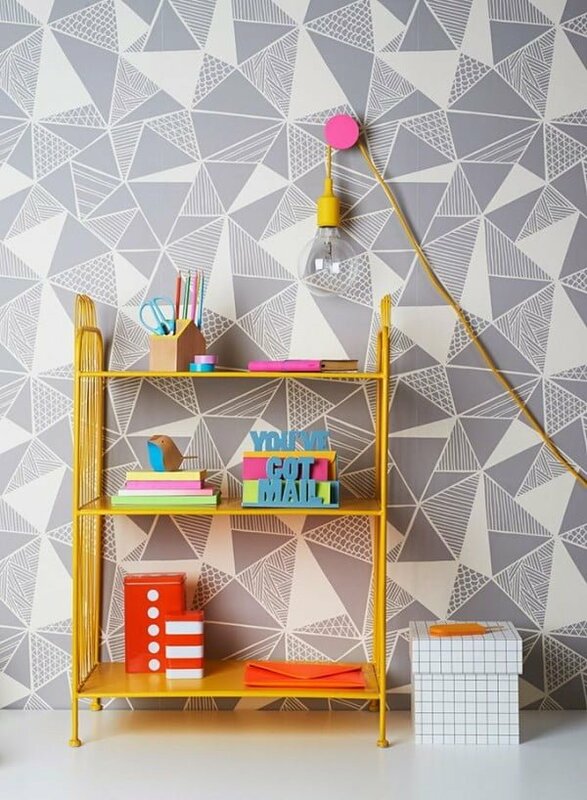 This decor project demonstrates how easy it is to jazz up plain walls with a little imagination. It introduces the Herringbone patterns, which add character to the room. 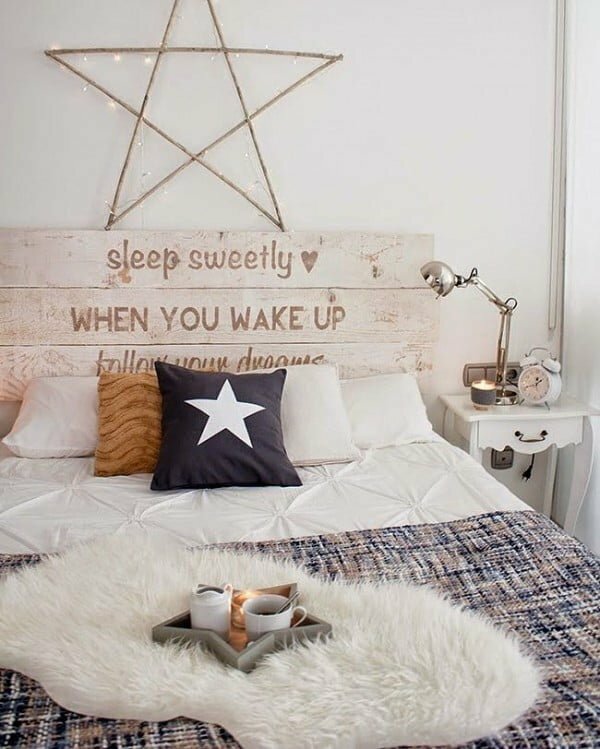 Build a unique rustic DIY headboard. The design concept used to redecorate a little boy’s bedroom in the project is a real masterpiece. It is easy to handle as a DIY undertaking yet the finishing is impressive. 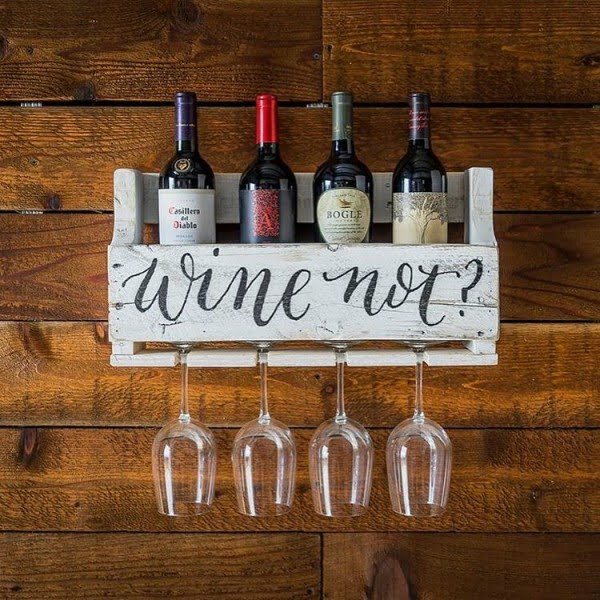 This handmade wine rack showcases an exquisite selection of wines in a stylish way while maintaining simplicity. It is made of wood, which contrasts nicely with the background. The inscription, ‘wine not’ adds to its appeal. This project creates a visual spectacle that provides a good platform to showcase a collection of ornaments, books and more. 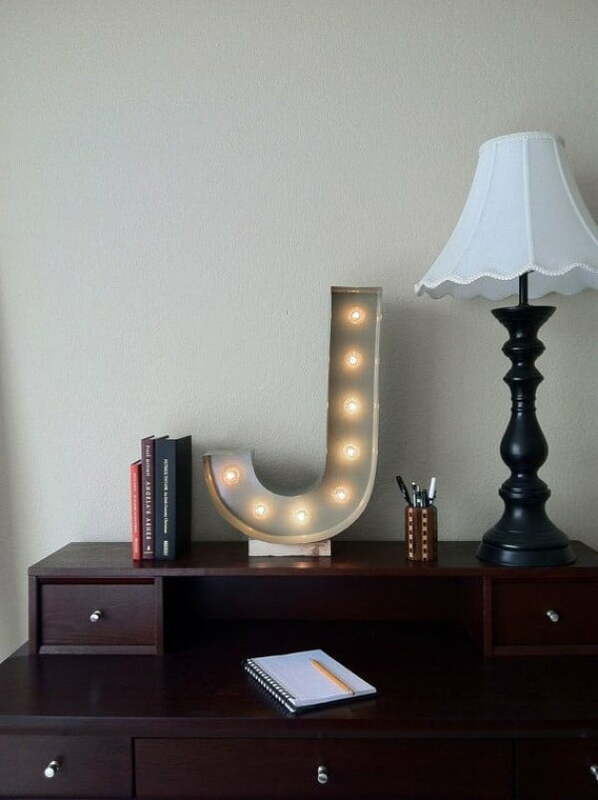 It can function as a mini library or display shelf. Incorporate an awesome bathroom decor by installing wooden shelves that complement the existing décor. Creating a heavenly look in the kitchen just got easier. The project incorporates wood, chandeliers, white walls and stylish cabinetry to create an eye-catching, sleek appearance. This project creates storage space below the stairway without compromising on aesthetics. Create a rustic shelf that contrasts nicely with white walls. It can hold a variety of decorative elements. Add an artistic touch to the lighting by choosing fixtures with inspirational images. This project is a perfect choice for anyone looking to introduce a hanger that fits with a minimalist theme. It has never been easier to replace shiny new screws with some old rusty lag bolts. 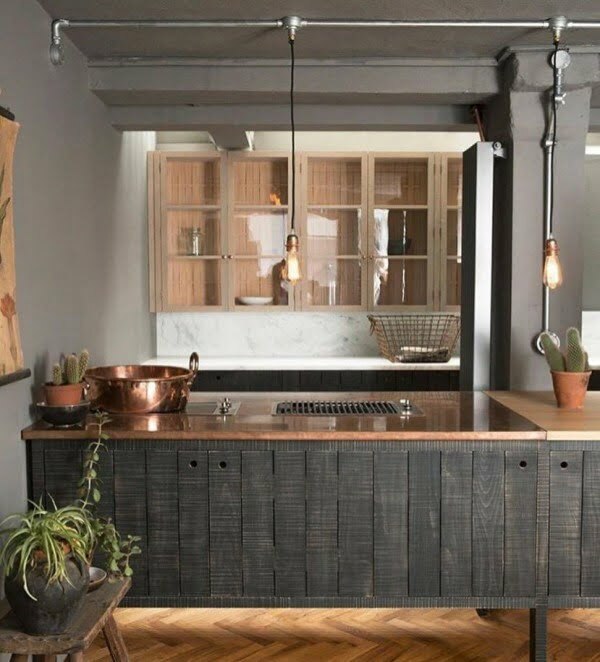 Using pallet wood to revamp your kitchen counters and cabinets create a great rustic vibe. 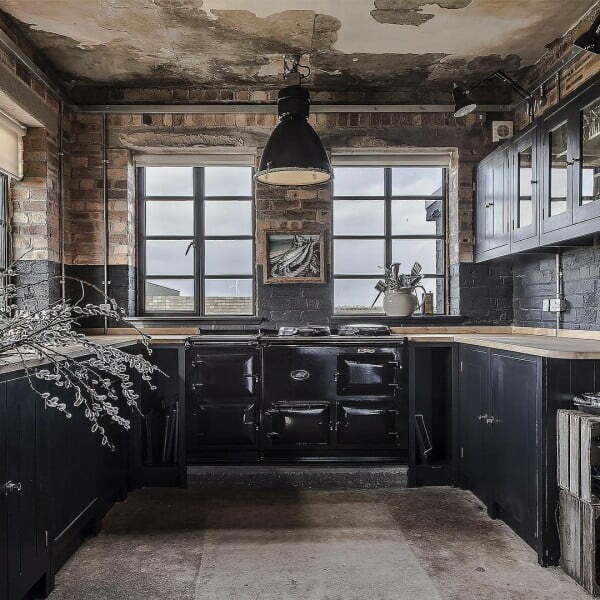 Consider combining it with industrial elements as well, for this great look. This amazing décor boasts a mix of traditional and modern design elements, including geometric pattern tiles, bronze details, and gray walls. The inscription on the wall captures the mood. This project is based on a minimalist theme that creates an exquisite look. 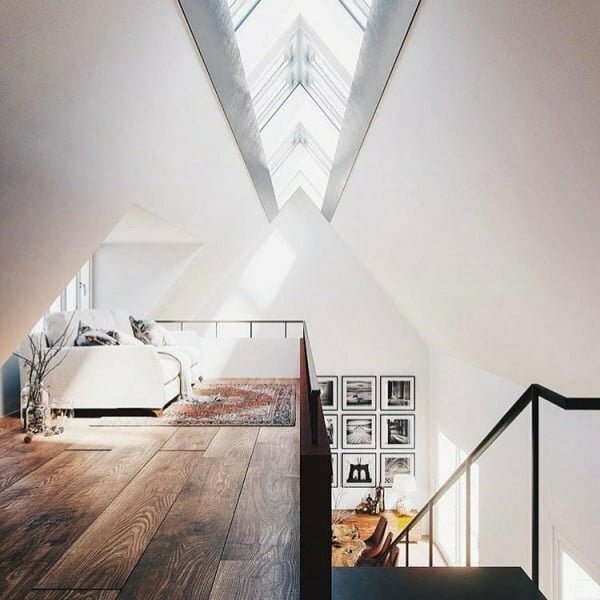 The well-designed skylight is undoubtedly the room’s focal point. Adding a splash of color does wonders to any room. This project transforms the room using bold colors that contrast beautifully. The color scheme creates an impactful appearance that stands out. 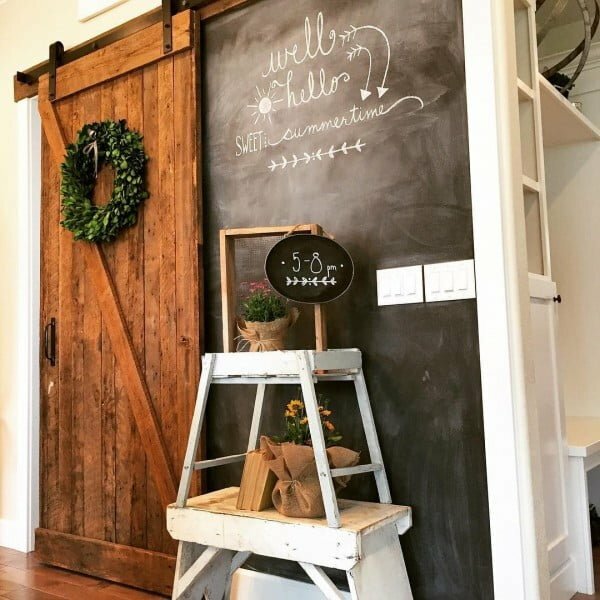 The combination of a farmhouse door and chalkboard wall elements provides an inspirational backdrop for any room. The farm door can work in different rooms, including the laundry room or the kitchen. 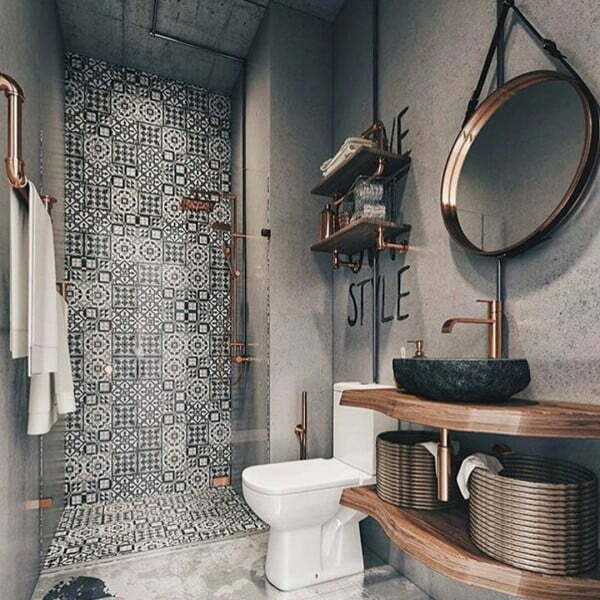 A modern bathroom design that combines artistic elements, beautiful tiles, and elegant lighting to create a stunning decor. The artistic mirror with a full-size wooden frame is the focal point in the room. 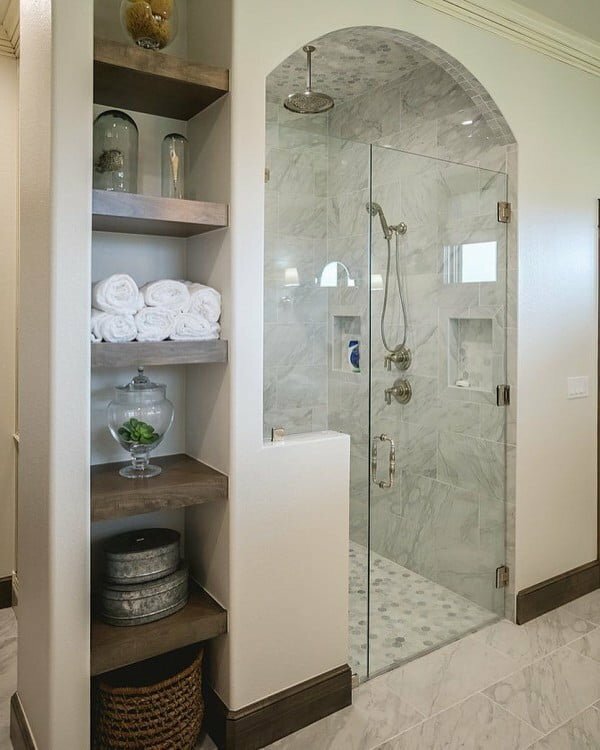 This home decor project allows you to create a cozy bathroom that looks contemporary and stylish. It features a towel rack made of wood that also holds the lamp. 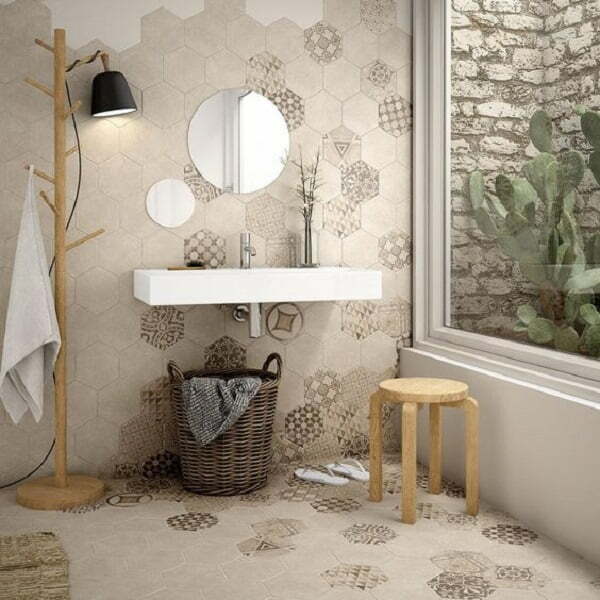 Create an enchanting bathroom space by simply adding dreamscape wallpaper. The design manages to infuse character to the room and complements the chandelier and other decorative elements beautifully. Add a personal touch to the bathroom by introducing classic mirrors with rustic frames. The project also incorporates multiple picture frames to create an amazing appearance. This project brings texture and character to the bathroom by introducing wood vanity elements, which contrast beautifully with the white walls. 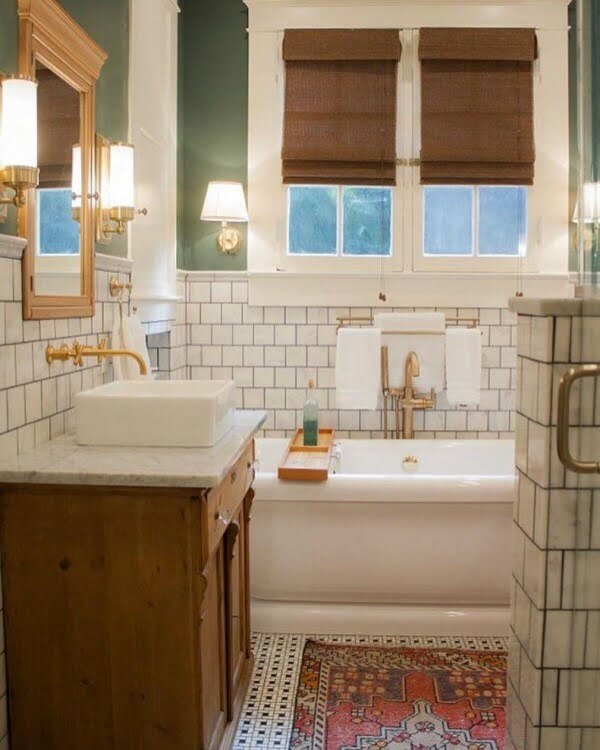 The golden faucets, pipes and other fixtures complement the wood. This farmhouse scale is so refreshing on multiple levels. It allows homeowners to add different types of decorative elements, including flowers, candles or some green to the room. These nesting tables are loaded with personality and they help enhance the appearance of any living room. They add a welcome touch of elegance and simplicity. Go classic with this gothic kitchen design that is sure to have your friends talking. Some of the kitchen elements are drawn from the World War II era. Making the most of the available space to create a stunning kitchen décor just got easier. This project involves the creation of a refreshing look that combines exquisite floral elements and glass chandeliers. Create an outstanding work of art that transforms any room. This piece is guaranteed to captivate your visitors. It comes as no surprise that the design claimed top honors at the International Design and Architecture Awards 2016. This DIY project enhances the appearance by adding a classic picture frame look. 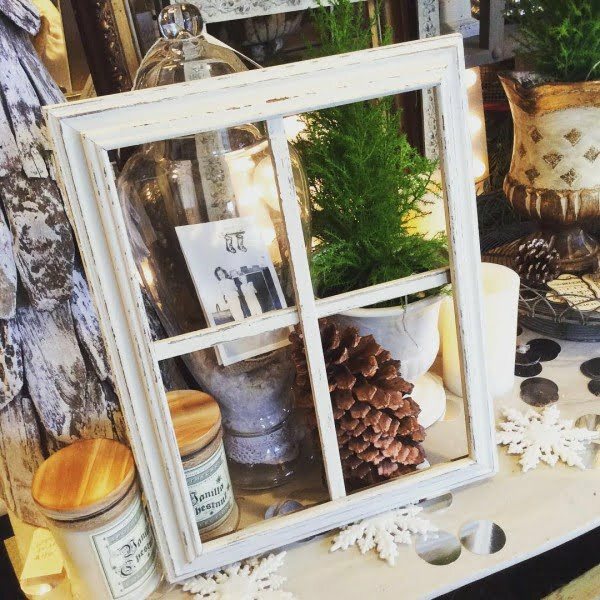 It involves the use of an old wooden window frame as a stylish backdrop for mantel décor or a rustic-style wreath. Enhancing the kitchen area takes a couple of planks, some paint, decorative glass bottles and mugs. The design can compete with any top coffee bar design without breaking the bank. Placing an inspirational headboard in a bedroom is one way to brighten up the mood. The project uses wood to create a masterpiece that comes with a star detail that hovers above the headboard. Brightening up any room has never been easier thanks to this floral picture frame. It brings elegance to the plain walls. A combination of well-chosen artwork and a brick wall background provide an inspirational touch that can transform any room. It doesn’t matter if you’re decorating a really small room or a room that could just use some more space, if you can make it look visually bigger, you’ll get accolades for your decor work. Home decor is, after all, not only about the looks and style but function too – an efficient use of room space is one. So today, we’re giving you some very simple ideas how you can transform a room to make it look bigger than it really is. Wider curtains will make the window look bigger and naturally the room itself. 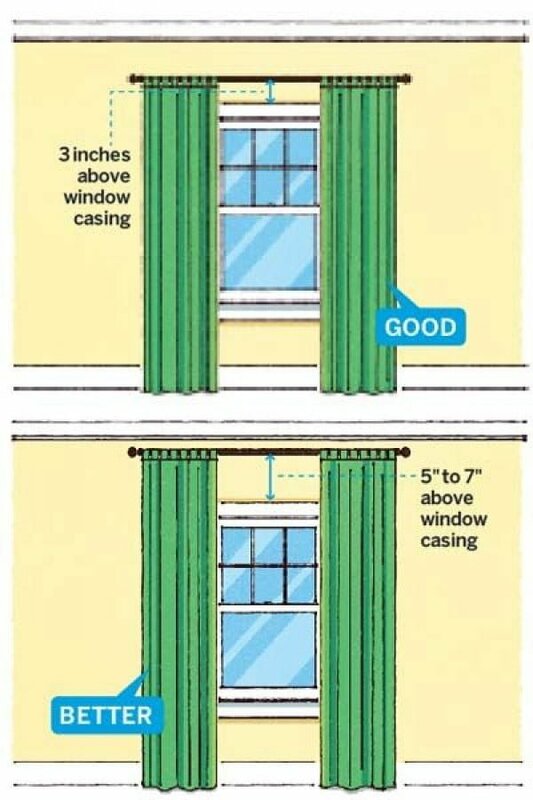 So pick a longer rod and make those curtains much wider than the window. Small wall art is fine, but nothing makes as strong a statement as big wall art that occupies the majority of wall space. In turn, it does make the room look visually bigger. Don’t make the mistake thinking that every inch of a small room has to be put to use. Filling it with furniture and decor pieces will only make it look cluttered. Make sure you use negative space for every piece you add to the room to balance it out. In order for a room to look bigger, you have to avoid dividing the space visually. So for a rug, choose a big one that will anchor all the furniture and keep the space together. One of they ways to make the room higher is to focus on floor, table lamps and wall fixtures, instead of recessed lighting. So get recessed light dimmers and use the low sitting lamps as the main light source. Small spaces can feel boxed out, so add depth by using wallpapers and mirrors. Using big wall mirrors, in fact, is a great way to create an illusion of a bigger room. Sometimes you’re better off skipping the sofa altogether. Get a couple of armchairs or a love seat instead and leave more open space. Add more depth to the room and soften the edges by using live plants. They’re especially effective in corners or behind sofas and chairs. There’s no better setup for a small living room than an ottoman with a tray for a coffee table. 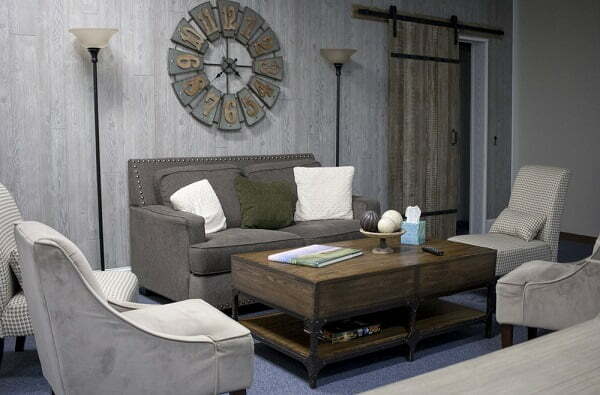 Try to add less pieces of furniture but with multiple uses, you’ll have more open space and still keep it functional. 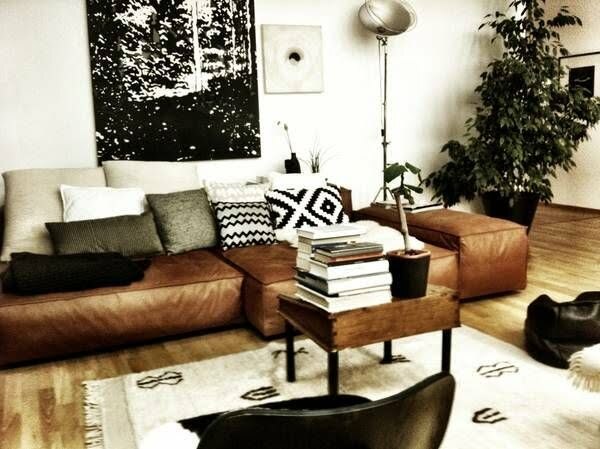 A big bulky sofa is good for a small room because it actually makes the room look bigger, and it’s actually the furniture that you should place against the wall. Better yet, get a corner sofa that can seat a lot more people. 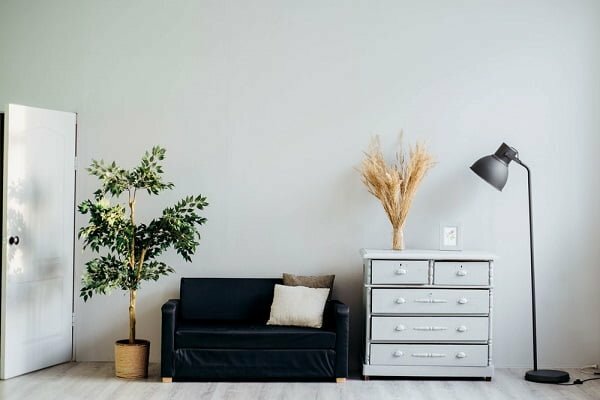 Minimalist decor is appealing in its simplicity but there is a difference between a well done minimal decor and simply having less stuff in your home. It takes some effort to create the right style and make it work. The key to pulling off this style is finding the balance between each piece you add and its surroundings, following the rules more carefully because in minimal decor everything seems exaggerated. Luckily, it’s not that difficult if you just follow a few easy guidelines. Balance is the main attribute of the minimalist design style, so you have to carefully choose each piece of furniture and accessories to match their scale, texture, pattern and color. We’re not saying everything must be uniform, and you can of course mix things up, but do that very carefully making sure each piece compliments each other. If you do choose to add a piece that stands out, let it be the focal point that looks intentional. To create a minimalist style you will choose a few decor pieces to make them count, especially when choosing statement and accent pieces. Uniqueness is very important, so don’t be afraid to splurge on that remarkable chandelier or a high-quality sofa. Creating a strong statement focal point makes all the difference. Since minimalist style rarely features popping colors and usually you will go for a neutral and warm color palette, the texture is a key to making the decor interesting. Wooden furniture, especially in the natural rustic finish adds much needed warm detail to balance the cold whites out. Talking about detail, while keeping the space as much clutter free as possible is key, adding little accents that are barely noticeable at first glance is very important to create personal and original decor. Anything that you can DIY works perfectly here, especially in rustic style. Light is very important in any decor style, but even more so in the minimalist style (especially natural light). You’ll often find that windows are left completely untreated to let in all the light possible, but using simple curtains in a neutral color is also a great option that allows you to direct the light the way you want. While whites are prevalent in minimalist decor style, it is by no means the requirement. You can add more color to your color scheme but do it in soft hues that don’t pop out and keep the overall balance. Everything is used sparingly and so is color. If you need to add pops of color do it via art and accent pieces. You have few and small decor pieces so you have to make them count. If they’re sprinkled around the space solemnly, they simply disappear. So group them together in clusters to make small but high impact statements. Erratic, irregular and ornate shapes aren’t minimalist and you should avoid them. Visualize the space as a grid and try to fill it in with straight lines and less curves. Of course, irregular shapes can be used sparingly in a statement and accent pieces, but that should not be the tendency. Open and moderated shelves in any room including the kitchen and bathroom are essential to keep the minimalist vibe. They will always keep the space more open and interesting. You can’t create beautiful minimalist decor without thinking about the negative space. Decorating minimally means leaving a lot of empty space, especially on the walls, so it has to be balanced out to avoid feeling under-decorated. So hang art in the visual center, use the rule of thirds to keep that balance. It may not come easy at first but you’ll get better by experimenting. If you have many random documents, from bills to work papers lying around on tables and shelves without any order, it’s time to put an end to it. Dedicate a small cabinet or two specifically to organize files, use document organizers and file binders, cabinets with drawers. Knowing where to look for a certain document will make your life so much easier. It’s easy to let the nightstand go unchecked especially when the night and early morning is the only time you see it. You may have several books you “will read eventually” lying around, chargers, an empty cup, and so on. 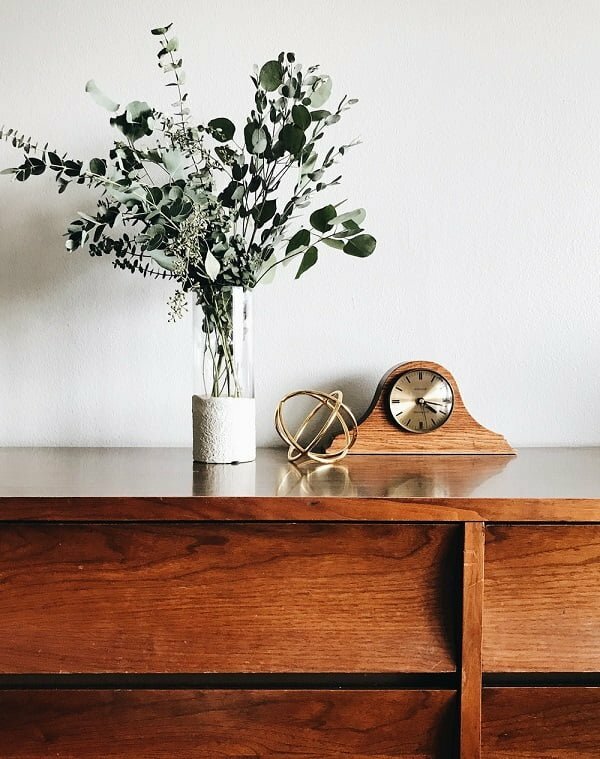 If your nightstand doesn’t have drawers to put things away, make it a habit to keep a minimal number of items lying around on it. Throw away all those bottles you’re not using and keep the number of products to the minimum. Get a basket or a few jars to store them and prevent the space from cluttering up. Yes, it’s that harsh. 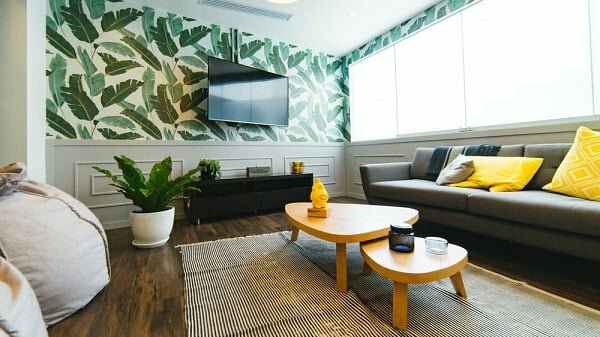 Unless your TV blends in the decor perfectly, remove it entirely and get rid of the cable mess and an eyesore it makes. Keep the bedroom simply for sleeping. Towel bars tend to make a mess in the bathroom as you carelessly throw towels on them. Instead, install hooks and you can even add them to the bar for a quick and easy solution. Does your TP holder give you a headache and you keep finding it empty because you or your family members avoid changing an empty roll because it’s too complicated? Replace it with a simple but stylish holder and get rid of this seemingly trivial but nagging problem. Do you want your bed making to take a few seconds rather than several minutes? Avoid flat sheets, blankets and throws and choose fitted sheets and duvets with covers and it will be as simple as pulling the duvet and puffing the pillows. A simple curtain rod and drapes is classic, elegant and simple enough. 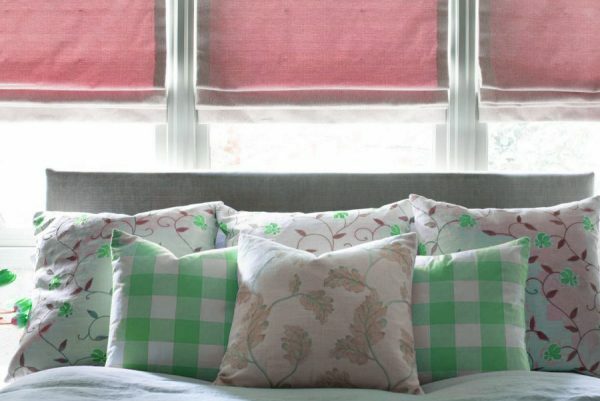 If you’re tired of blinds or shades that constantly get stuck, simplify the window dressing. Making your kitchen simpler is a big part of simplifying your life. Avoid looking for pots and pans lost somewhere in cluttered up cabinets and pick them up immediately off the rack for a fast use. All you need is some free wall space to install it. Less is more and you should keep that in mind when organizing your storage and display shelves. 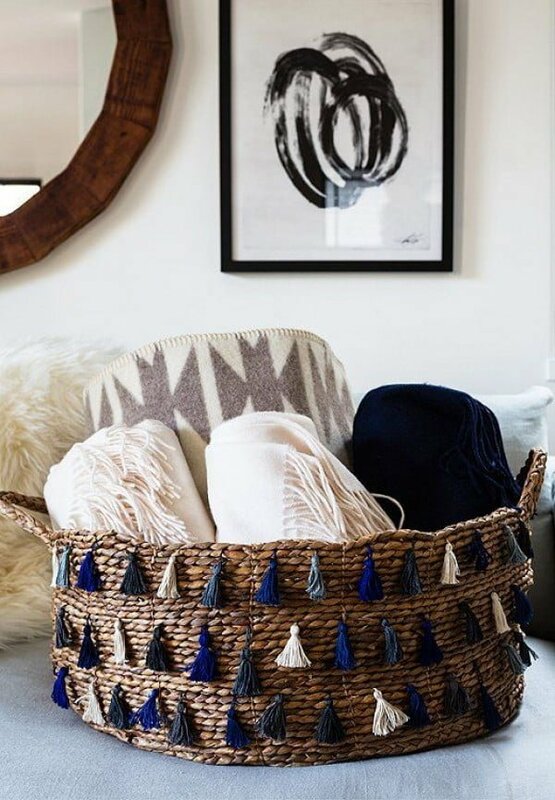 Invest in a few baskets to store smaller items that tend to add up to a clutter and keep them out of view. Create “drop zones” for everyday items and always know where to look for them. We like hardwood floor as much as the next guy because it’s timeless classic that will always look warm and classy. However, there’s no reason why wood should only be used on the floors. That’s what this new trend is all about. We’re taking wooden tile and creating accents all around the house. This way we create unique rustic accents that warm up any room and make your home a cozy place. 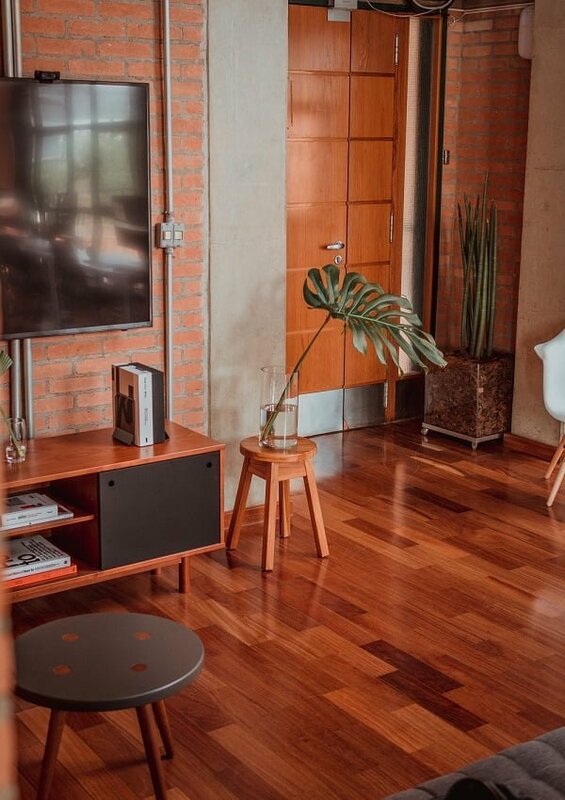 The new take on wooden tile is to have it everywhere we see fit – from accents walls and tabletops to vanities, mirrors and even light fixtures, not forgetting the hardwood floor. Because for as many new ways we can find for using wood creatively, there’s always a place for the classic design. Wood tile creates a cozy rustic feel as an accent, as well as the focal point of the room. The combination of wooden wall, floor and bed frame enables the design to maintain rustic feel all throughout. Kitchen backsplash is one of the best ways to showcase a statement accent in room decor. It oozes rustic warmth and creates a lot of decor interest. What a great home decor project it is. 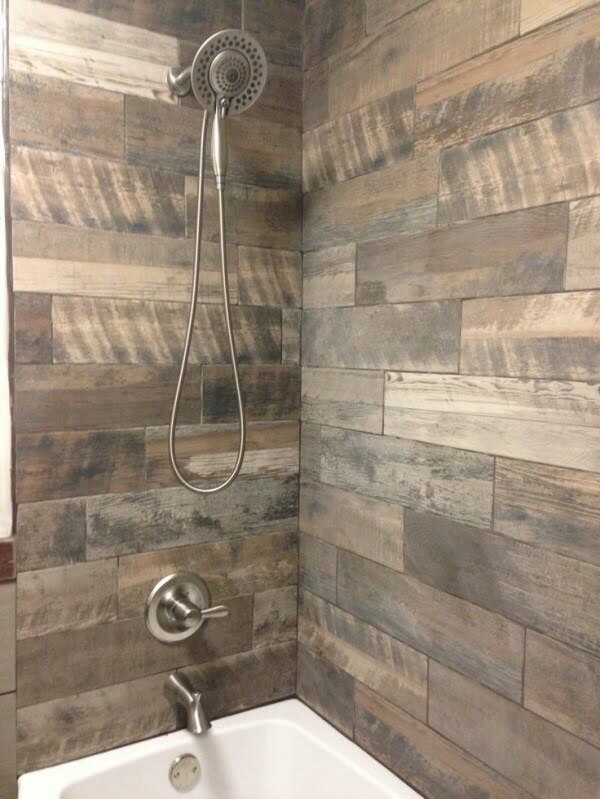 Many people have shown interest in wood tiled shower walls and we can see why. Rustic accents are being embraced in modern interior design wholeheartedly and there’s no better way to make a house look like a home. 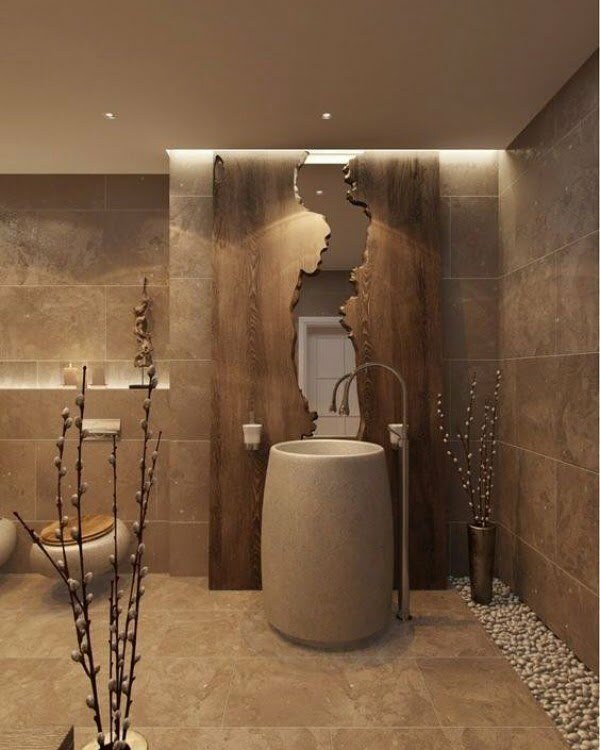 A rustic bathroom is a great way to surprise your guests as well. Reclaimed wood comes with the notion of recycling and contributing to making our planet cleaner. But that’s not the main reason why this accent wall looks so great. It’s about the shabby chic look that weathered wood creates and the warmth of the pattern. While accent walls are very impressive you may not necessarily want to get involved in remodeling your home. 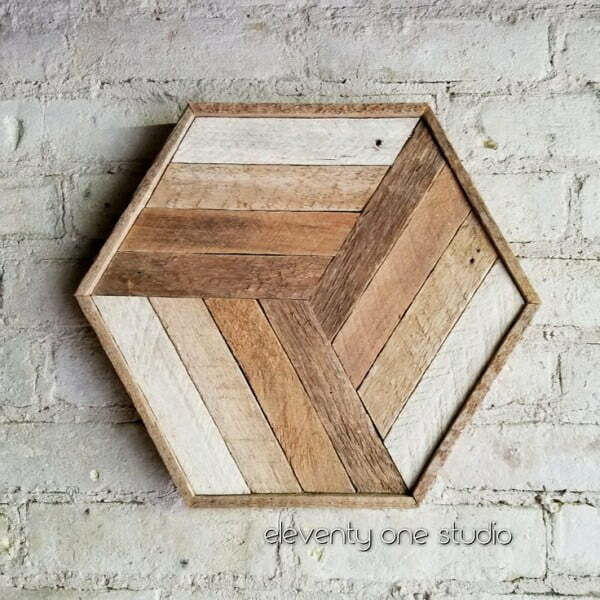 If you still want small rustic accents with wood tile in your decor, try wall art. Wooden countertops are popular for their texture, color and durability, but there’s no reason why entire counters or cabinets wouldn’t benefit from wood tile pattern. It’s a great accent in the kitchen and you can even do it yourself. Hardwood floors may be classic but we can be creative with them as well. 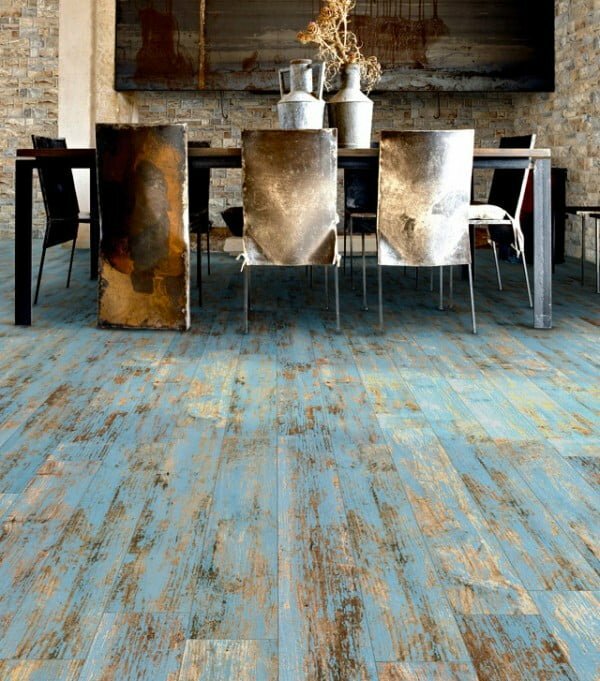 The weathered shabby chic look of reclaimed wood gives this floor an exquisite look to crave for. Wooden countertops are popular for their durability and texture so we can experiment with tile here as well. 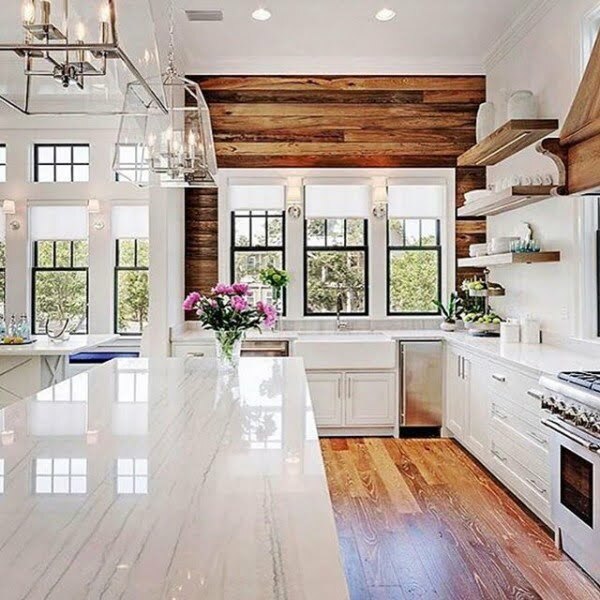 There are countless wood tile patterns to create a unique rustic kitchen decor accent. For a different take on wooden tabletops try a herringbone pattern. While it’s more often used on wood floors and accent walls, a tabletop benefits greatly from this decor statement. 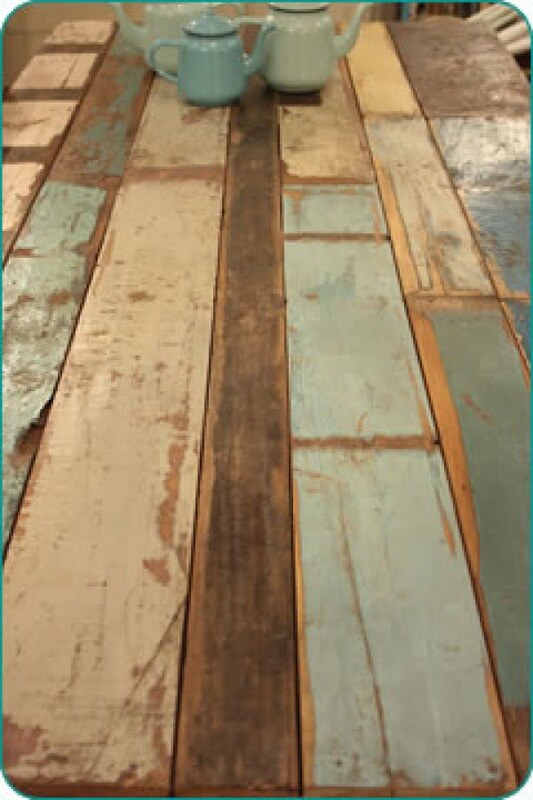 Reclaimed wood, again, is perfectly used to create wonderful rustic tabletops. Any rustic decor will benefit from this shabby chic look. Decorating around the TV can be as challenging as it is fun. We don’t want to make a TV the focal point of the room because that’s just boring. 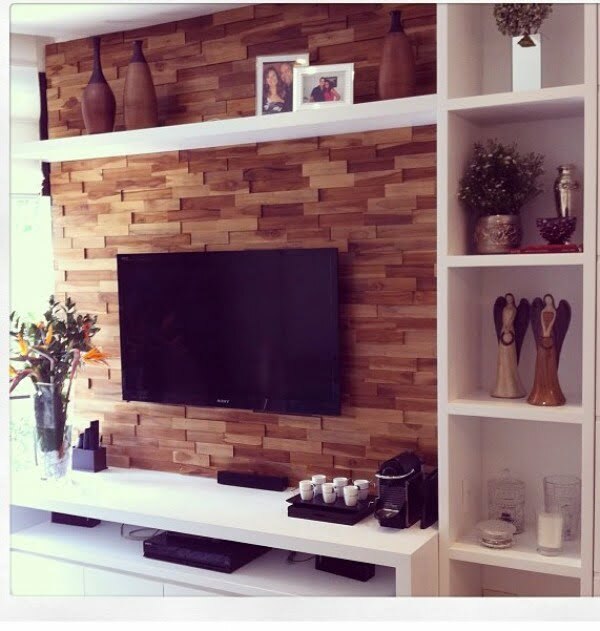 So instead, we can create an accent wall with wood tile that just looks great. Let’s not forget the ceiling and keep in mind that it can benefit from a rustic design as well. 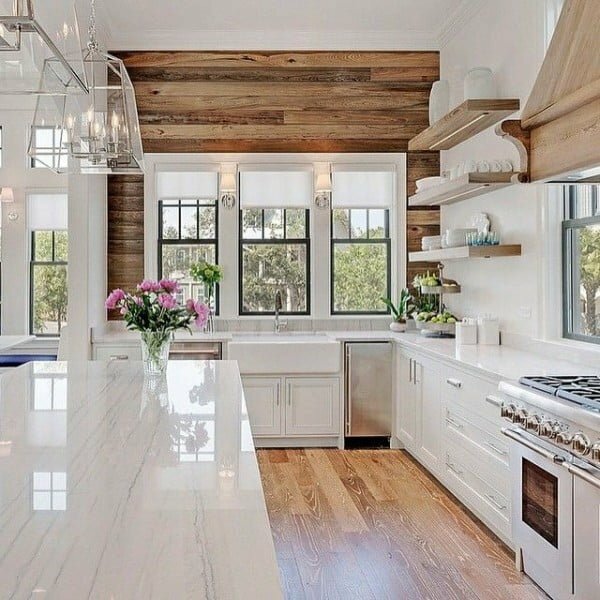 Reclaimed wood tiling adds a lot of depth to this kitchen design without making the space look small. If used together with open wooden shelving, accent wood tile walls extend the rustic decor statement to the white walls. It’s a lot more interesting option than leaving empty walls or using closed cabinets. A vanity is another place where we can use wood tile accents successfully. Just like the shower, a rustic accent wall makes the bathroom a lot more interesting. 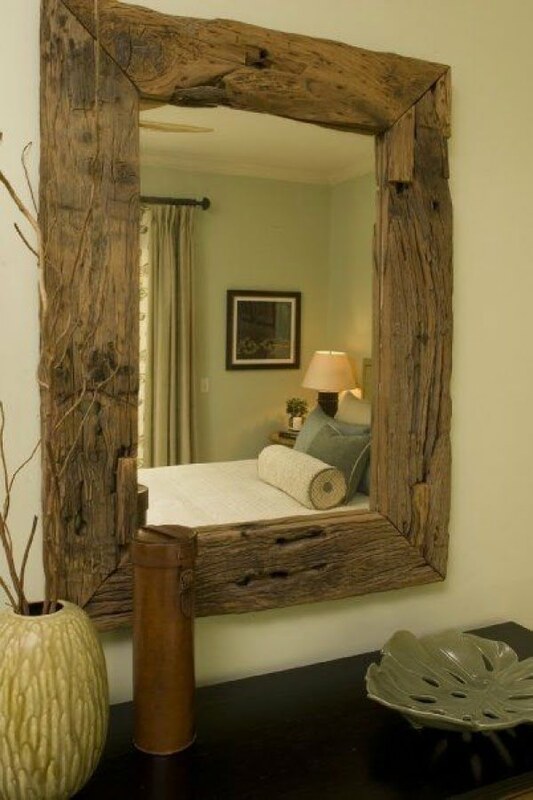 Another small rustic accent where wood tile can be used is the mirror frame. Reclaimed wood makes a natural pattern in this design. And finally, even light fixtures can benefit from a wood tile look. These wood blocks used for the chandelier create architectural interest while making a rustic decor statement. What makes home decor timeless? Some homes look like they were decorated yesterday and they’ve been like that for decades. Others quickly get worn down and look out of style. If we consider the differences between the two we can quickly see what decor decisions are what we can call timeless. On the same note, timeless decor means that you never grow out of it on a personal level. Home decor that evolves with your own design taste over time. 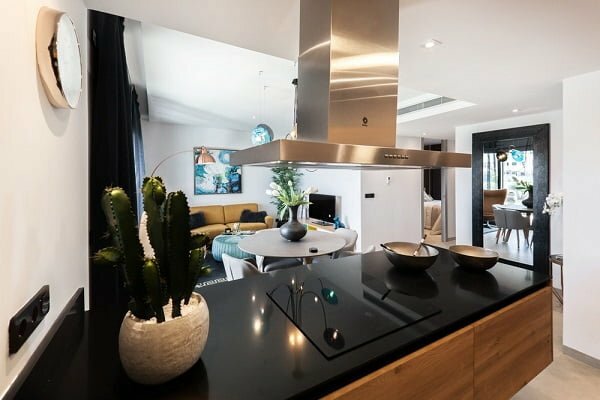 There are several tips and ideas you can employ to make sure that the interior design of your home will stand the test of time, and here are 12 of them. Color trends come and go every year and every season. You’d have to commit to re-painting your entire home every time to stay relevant. But if you choose neutral whites, shades of grey, beige hues, they will provide a backdrop that will stay in style forever. The minimal uncluttered decor will always stand the test of time better than busy decor. Choose quality over quantity if you want to keep it timeless. Of course, neutral only colors are boring and have no character. You need pops of color and accents, but instead of committing to wall painting or big accent furniture, choose small accessories like throw pillows, or even smaller furniture like stools or ottomans that are easy to switch. Choosing every detail that you add to your home not only will save you money but make you like your home better for a long time. Give it a good thought and don’t buy things on a whim. Always choose functional and comfortable over trendy and stylish. Something that looks chic today might look tacky in a year and you’ll have to throw it away. On the other hand, comfortable furniture will be hard to get rid of even if you need to because you fall in love with it. As time goes by you will add many decor pieces of different styles from different epochs. You can even emphasize it with antique items. Such a blend gives your home a well-collected look. You may have a lot of collectibles and accessories that you’d like to show, but don’t just put everything on display. Keep the best of the best only and you can rotate things to keep it fresh. Lighting is very important in home decor and natural lighting is irreplaceable. Choose window dressing with functionality in mind to let as much light in as possible. Classic is timeless so consider such features as crown molding and ceiling medallions for an accent that will stand the test of time. Smart storage never goes out of style and keeps your home clutter free. This cabinet design provides ample storage space with extra slide out compartments and it will be just as good for years to come as it is now. Just because you want a timeless decor doesn’t mean that you can’t indulge in trends. However, do try to get smaller pieces only that you can easily swap out when you get bored of them. There’s no one right way to arrange a vignette, a display shelf or even the furniture. Keep rearranging things regularly and look for new ways to create a different look. The key to being creative is always changing things. You can’t work on your decor empty handed that’s why you need a good stash of various decor pieces to turn to anytime. You don’t need to display everything you have, in fact, you need only a small part of it, but having something to choose from will enable you to be a lot more creative. One of the best ways to show your creativity is by displaying a collection. So if you haven’t got one, better start collecting something. It can be absolutely anything that you like and find interest in. A collection that you spend time creating translates the effort to your home decor and it will not go unappreciated. It’s not about being cheap and trying to save every penny, thrift shops are great for random decor gems that you won’t find anywhere else. You’d be surprised how unique vintage thrift shop finds can inspire you. Nothing kills creativity more than neutral colors. Yes, a neutral pallet is safe and leaves an empty canvas for accents, but it’s also dull and uninspiring. Let a touch of striking color dictate the decor and you’ll feel your creativity gaining momentum. 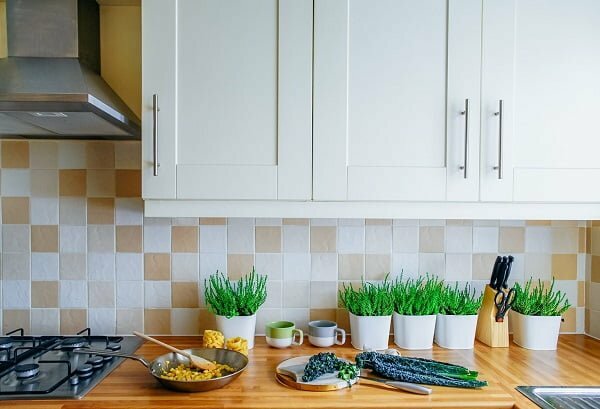 You probably spend a lot of time in the kitchen, so make sure it inspires you to cook and eat healthy. Create a mini herb garden that will make you want to eat fresh food. Anytime you get a spark of creativity, make sure you have somewhere to scribble a note down or sketch out what’s on your mind. Keeping a journal will help you get your creative thoughts together. Creativity isn’t born out of playing it safe, you have to take decor risks. For example, experiment with neon colors or mixing patterns, you won’t find out what works until you try it. Having a pinboard available to pin art, notes, jewelry and other ideas is a great way to keep your creativity alive. Use an attractive frame or even a beautiful cover fabric and you can make it part of decor in any room. Make the bathroom your home spa by really putting your effort into its decor. Bathroom is often the least decorated room in most houses, so use that space to be creative. Mood boards allow you to get the vibe of the room’s decor to be, and it’s a great way to get inspired. No matter how small your backyard is, even if you just add some seating to it, make it a place where you can go out of the house and spend a moment to think. Nothing helps your creativity grow than creating something beautiful yourself. So embrace the DIY and try to find the time to practice it regularly. At some point, we have to take risks when decorating our homes, whether it’s to try something new or experiment with decor ideas. Not all of these risks end up working but those that do can create some of the most unique interior designs. Yes, a set of matching chairs looks orderly in their uniformity but mixing things up can add variety that pushes the look off just enough to make it interesting. Be confident in things that you like and don’t be afraid to show off. Like this combination of a map and twinkle lights. A mural is very visual but that may be just what you need in your room. We have a great gallery of wall murals that just look stunning. Accent walls are popular but don’t settle with just an accent color, create a pattern that modifies the shape of the room. Fridge decals are easy to add and they will really freshen up your kitchen. Try applying interesting and whimsical embellishments. Fixtures are rather easy to change even if you’re not up for a complete makeover and having unique fancy lighting fixtures or faucets will have a huge impact. Upcycled barn doors are trendy but I think we can step up the game. A sliding door provides a unique opportunity to add a mirror and expand the visual space. The general rule is to be careful with patterns and use them sparingly, matching many vibrant patterns takes an expert to pull off. But it’s a risk that we’re willing to take. Dark colors create a sophisticated, mysterious and even dramatic look, so don’t be afraid to play with dark tones. 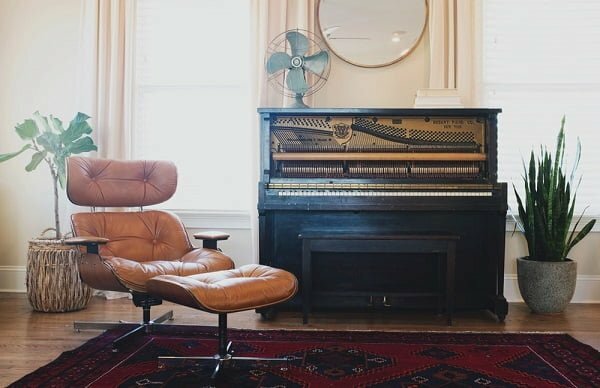 If you’ve picked up a piece of vintage furniture in a flea market or perhaps inherited one, it may be difficult to fit it in your home decor. And while painting is not the way of antiquing, doing so allows you to “force” it in. The ceiling is usually left white to make it seem higher and leave the space open but painting it in a color or even a pattern can have a dramatic effect that lifts chins up. Yes, you can actually put wallpaper on the ceiling and while it’s not for everyone, it can have an amazing effect if things go right. This is a risk really worth taking if you’re on a tight budget. Look at this wonderful accent of stacked vintage suitcases and an old picture frame being used as a nightstand. There are two main reasons why you’d want to hang plants from the ceiling. For one, you can soften the corners of your room and add depth. Secondly, hanging them over furniture will give its placement a purpose. 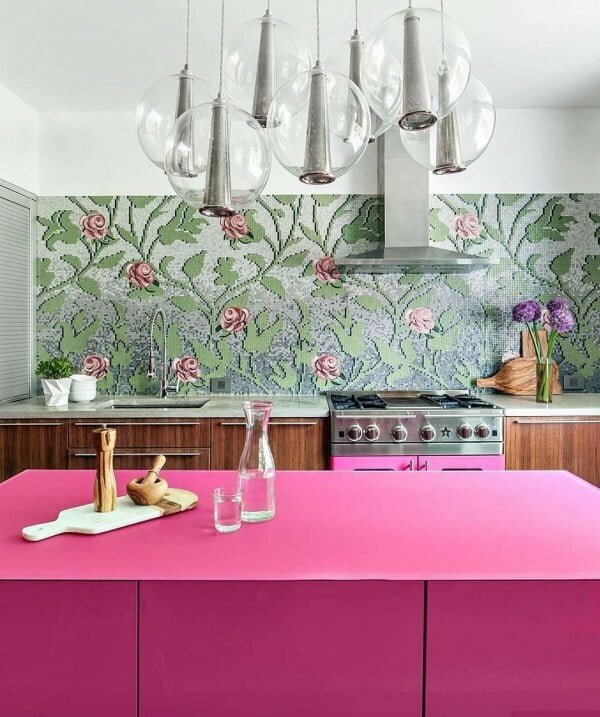 And while you don’t have to use such eclectic colors as this kitchen, painting a cabinet in a neon color for an accent can be an impactful surprise. Nobody likes boring interior design – add quirky and whimsical elements around the house. I love this idea of a cup and plate as a light fixture. Nature makes the room look lively and it’s not only for a rustic look. If you like this tree bookshelf idea, we have more of them. You don’t have to play safe with door color, paint the trim or the doorway frame in a popping color. We’ve had accent walls and ceiling, now it’s time for the floor. A popping rug is actually quite a safe risk to take because it’s easily replaced, so you can’t afford to try it. Don’t just sell or give away old toys that your kids aren’t playing with anymore (or your own toys form the childhood). Toys, especially vintage, can make great decorative accessories for a playful look. 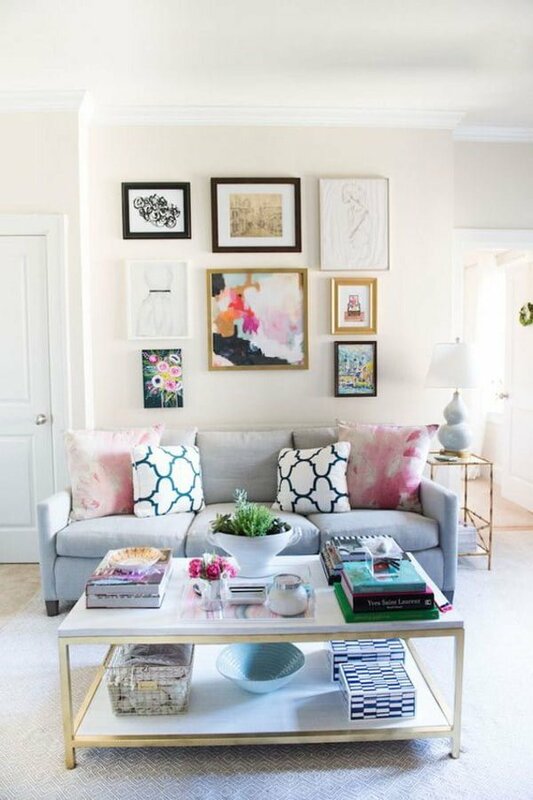 Having a full wall of print art is not an easy arrangement to pull off but try it to fill in empty spaces. Home decor eyesores are those nagging small things that keep bothering you no matter how well done your interior design is. Things like ugly power outlets, light switches, vents, cords and so on. The problem is that they are useful, so you can’t remove them and have to live with them. You can, however, decorate around and camouflage so these small things become invisible (sometimes even attractive). Here are 20 ways how you can easily do that. Simple square shelves suspended on the wall can sometimes have an unwanted boxy effect, but they are very useful especially in small spaces. Here’s a clever idea to create a hidden shelf and have bundles of books suspended on the wall. A home office can become an eyesore, especially if it shares space with a living room. Hide the cords behind a skirt of fabric which is easy to DIY. You can make an attractive TV cover fabric to hide it out of sight as well as keep it clean from dust. A default white fridge may be a decor eyesore if it doesn’t blend in the overall kitchen design. In that case you have a choice to paint it, add decals, and even wallpaper. There are many things you can hide in a box, from cables to electronics, and an attractive box on a shelf or a desk will just blend in. 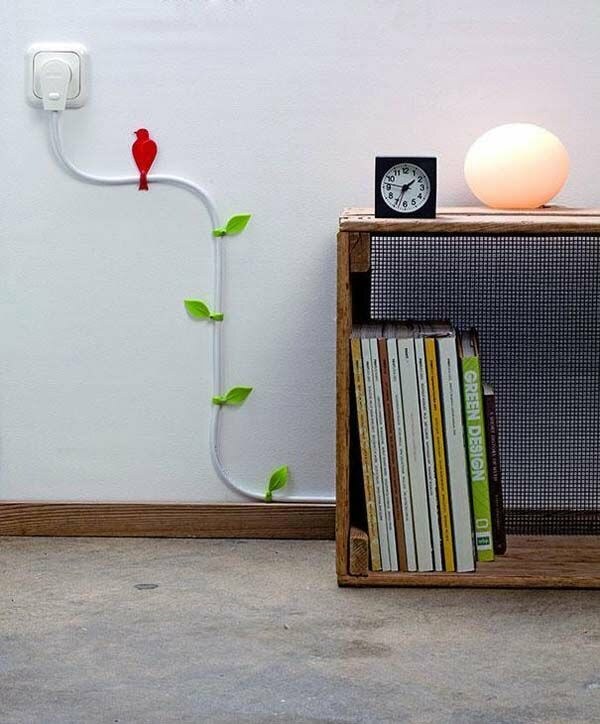 One of the most brilliant ways to hide cables is not to hide them at all and instead create cable art. One of the most visually jarring things in home decor are phones, tablets and laptops lying around with their chargers. Create a charging station hidden in a drawer to hide the ugliness. We’d love it if electronics like routers came in attractive styles but instead they’re just ugly black boxes with no decorative use whatsoever. 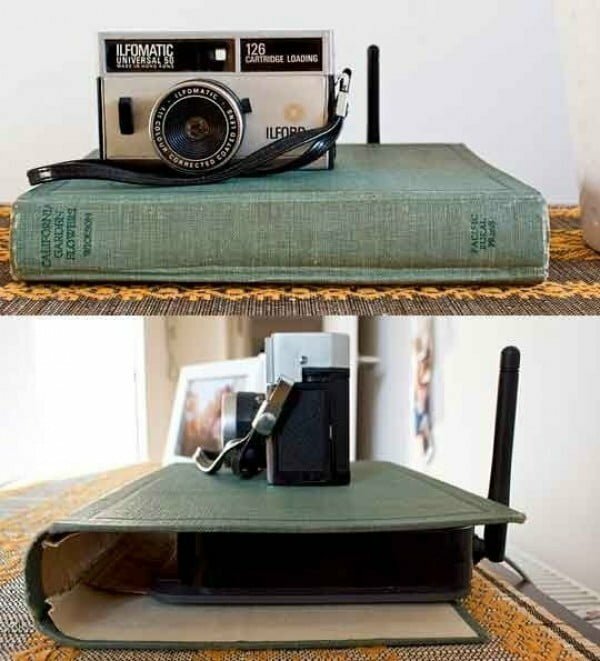 Hide them in old book covers or cases, create vignettes around them and pretend like you don’t own them. Cover ugly things on the wall with pictures. Bonus points if you install hinges for easy access. Deep tilt out cabinets are great hiding places for trashcans. Can you find the thermostat and a light switch in the picture above? 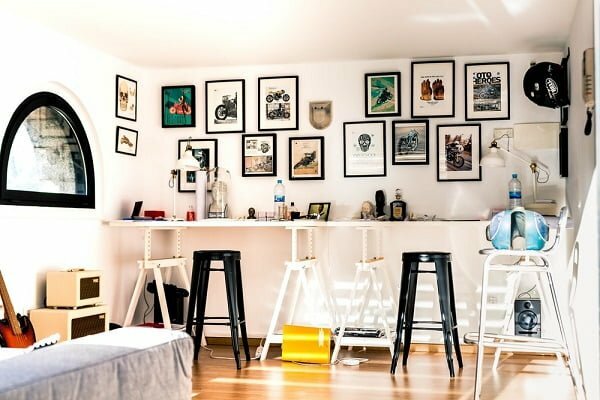 Hiding these ugly contraptions infesting the walls with beautiful picture frame arrangements is one of the easiest ways to cure your home decor. Hide radiators or air vents with visually attractive sideboards. 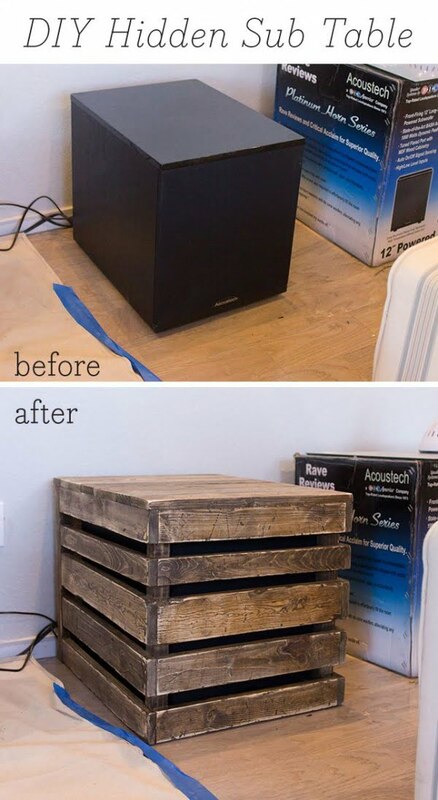 Hide random pieces of electronic with DIY covers, such as this sub table and you’ll get an extra rustic accent. A lot of electronics, such as printers, can be hidden in deep drawers. Sometimes you want to hide the storage space of some furniture. Using an attractive pattern cloth as a skirt can do that wonderfully. Same idea can be applied to hide the ugly bed box. 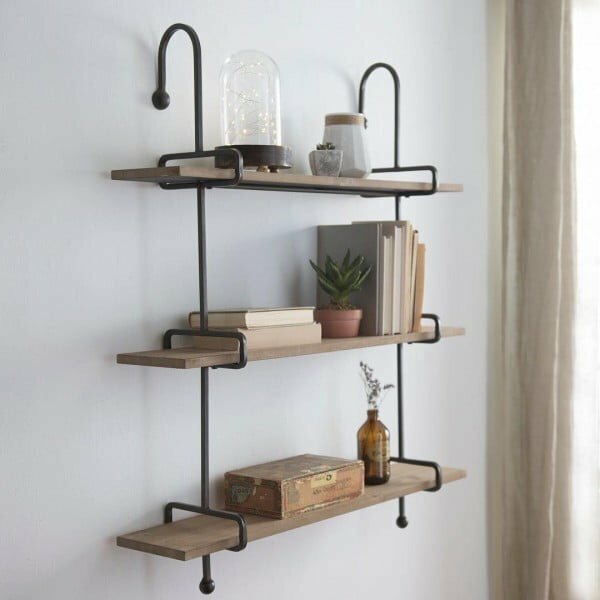 Shelves aren’t necessarily the decor eyesores we usually have in mind, but you can cover them with knit laces or popping wallpapers if they’re worn out or to add an accent. Install roller shades to cover parts of a bookcase that you want to hide out of display. 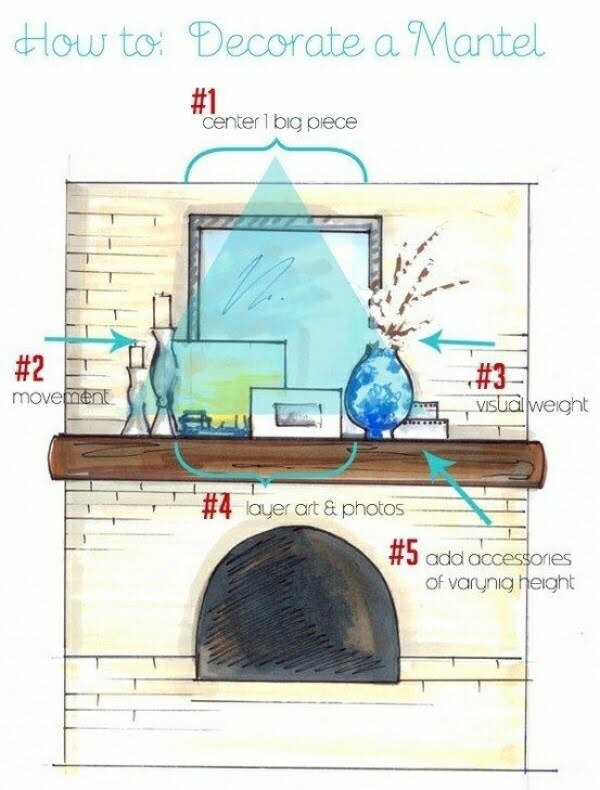 Hide random things for easy access in hidden storage, such as this lovely rustic suspended wall shelf. Some things can be made attractive if you just frame them properly. We’ve all had to face them at some point when decorating our homes. Not everything is as easy as it may seem at first and sometimes you just hit the wall, so to speak. Faced with a dilemma we are often left scratching our heads without a clue how to proceed. So here are the top most common home decor dilemmas and how they can be solved. Hopefully this will help you move past the creative blocks you may be facing. How to Hang All the Pictures On the Wall? If you have more than a couple of pictures, it can be challenging to hang them all without disrupting the rest of the decor. Always think of creating an imaginary shape and aligning picture frames to it. If the pictures are the same size, you can use the same frame style and form a grid. If the pictures vary in size, use different frame styles and try to create an anchor with the largest picture. How to Make the Recessed Lighting Right? Recessed lighting coming from the ceiling lighting fixtures is usually not enough to create the right mood. While it’s popular and most used form of lighting in modern interior design, it should not be the main part of the lighting. You can balance the light out with shade lamps just below the eye level to create the right lighting mood. Can You Place the Bed at an Angle? This question arises when dealing with small spaces and awkward floor planning. Usually, you should be able to do away with placing the bed flat against the wall, because angled placement actually takes more space. But if it works, such as this layout with a dresser used as the footer, by all means do it. How to Update the Kitchen Cabinets? You can paint the cabinets without sanding with the right paint, so by all means do it. Replace the handles or the entire face of the cabinets. Also, redecorate the space around the cabinets. There’s a lot you can do on a limited budget and time, to update the look without replacing them. How to Decorate Small Space? This is a big question but the most obvious answer is to use the small space to your advantage. First of all, don’t make the assumption that a small room needs small furniture. Well placed bigger furniture will be more functional and will make the room look bigger. Small things have a big impact in a small space, so don’t be afraid to add accents and create character easily. How to Create an Accent Wall in the Bedroom? Bedroom is a place to rest so vibrant and popping colors are avoided. To create an accent wall, use muted soft colors. If the rest of the color scheme of the room is neutral, any gentle accent color will work. How to Remodel on a Budget? You want to do a makeover with an impact but you’re on a tight budget? Start with paint, even if you re-paint just parts of your home it will have a big impact. Move on to accessories that don’t cost much but add accents to the decor, such as accent color throw pillows on a neutral color couch. What Do You Do with the Dead Space Under the Kitchen Sink? The cabinet space under the sink is usually a dead space due to the tubing and it’s hardly useful. But if you install this two layered drawer system, you can save a lot of storage space around the sink. So you have your eye on a number of items to decorate your home, from patterns to furniture to accessories. But how do you make sure everything works together before buying it? Finding out something clashes after you’ve already bought it is the last thing you want. Here’s where the mood boards come in handy. All you have to do is cut the pictures of your items and paste them together on one board to get the general feel of the whole decor. How to Avoid a Boring Kitchen? You may have a sleek modern cookie-cutter kitchen but it looks just plain boring. It’s hard to avoid that without careful prior planning and going over the budget for designer furniture, but adding some simple accents to personalize can save the day. Add live plants, rustic items, even an old refurbished cabinet will add character and make your kitchen look anything but boring. So you’re tired of the same old wall color and want to try something new but you can’t or don’t want to commit to repaint the entire room? Switch small furniture and accent pieces to different colors. You’ll be surprised how differently the same room can look without even repainting it. The old furniture has worn down or you simply got bored of it? Try putting new slipcovers on in a pattern and color you like to completely transform it. Having a small (or really non existent) entryway can pose a real challenge. If all you have to work with is a small wall, try to keep the decor minimal. Add a few hooks, a suspended shelf for a landing strip and a mirror. Don’t clutter it up with massive coat racks and shelving. The correct length of the curtains is as important as the height its hung from. A proper hem will weight it down neatly and will make it look elegant. And you don’t even have to sew to make it (see the tutorial). If you want a quick and easy upgrade for your bed, get a bedskirt in a pattern and color you like. It’s an easy way to hide an old worn down bed and make it look like new. Get pillow covers a couple of inches smaller than the pillow itself to make it look stuffed and puff rather than drab and tired. 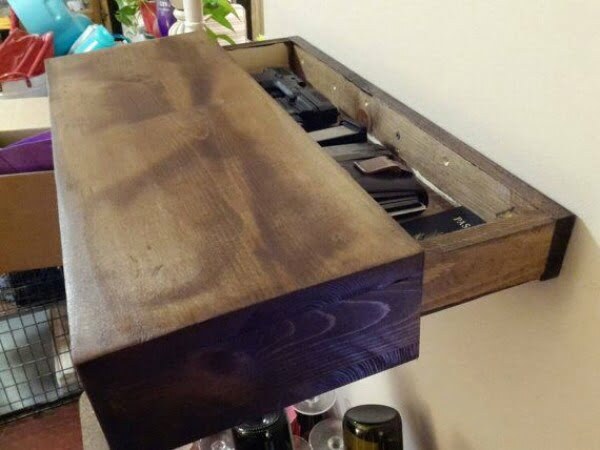 Drawers get worn down because they are used so often. One option is to paint them, but an easier one is to add self adhesive wallpaper that will hide the tears and give it an upgrade in style. Washi tape is a godsend to hide just about any small cracks, chips, holes and other eyesores on the walls. Create wall art while covering the ugly spots without having to repaint or apply wallpaper. Once the faucets in the kitchen and the bathroom wear down, there’s a cheap step you can take before replacing them – spray paint them for a new life. This is one of those ideas that makes you say, “why didn’t I think of it?”. The floor in your dining area wears down as your family uses it several times a day. But if you rotate the table regularly, it will wear down more evenly. While there’s a lot of leeway in decorating your home, you still want to make it look pretty and without very obvious inconsistencies and mistakes. 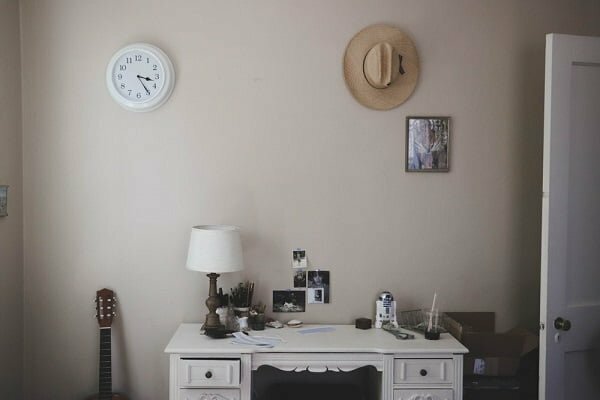 Even if you’re not one for rules, you will appreciate some guidelines on what does work and what actually doesn’t work in home decor. So here are 10 of the biggest home decor do’s and don’ts. It is a recipe for a truly beautiful home. There’s nothing wrong about small art but if you hang it on a big empty wall, you either have to build a gallery to take that space up or use bigger art. Choose either one of the two options but don’t just hang a small picture and leave the rest of the wall empty – it immediately makes the room look smaller and under-decorated. Remember, drapes decorate the wall, not the window. So you have to hang them just below the ceiling, or if your ceiling is too high, at least a foot above the window. Correctly hung drapes make the ceiling look higher and space bigger while hanging them too low makes them stick out in an uncomfortable way. Another way to make your room look smaller is to use a rug that is obviously too small. Such a rug divides the space visually and it’s not what you may want, especially in a smaller room. Make sure the rug is big enough to fit all the furniture it is supposed to anchor. Clutter is a major no-no in home decor, it’s pretty obvious. And it includes not only misplaced everyday use items but unmoderated display items and decor pieces as well. Make sure you establish storage space and drop zones for various items and edit your displays to keep only the most important accent and statement pieces on view. Use color to make your decor interesting but do it moderately. While an all-neutral color scheme is boring, random pops of color that don’t play well together don’t work either and make the place look cluttered. Instead, match a few accent colors and introduce them with accent pieces making sure they complement each other. So you’ve decided on a color based on its psychology and the mood you want to create for the room, you paint the room and notice it doesn’t look how you imagined it would be. Test before painting the entire walls, use swatches and mood boards to get a good idea of what it will really look like. Having molding in a room is a feature that has to be used to its full extent. Paint it in an accent color (or paint the wall in contrasting color or pattern) to create architectural interest. Use furniture that compliments the classic style but don’t be afraid to introduce a few modern pieces as well. Finally, trust yourself in decorating your own home. Everything goes if it feels right and you believe it is a great fit for your home. So feel free to go on splurges for statement pieces, feel free to experiment, and even break some of the rules. Nobody knows better how your home should look like than you. We all make home decorating mistakes, that’s just part of the game. And it’s OK, mistakes allow us to learn and improve, and sometimes a mistake can become an accent or a feature. But some mistakes are better avoided at all. We’re making a list of common things that can go wrong when decorating your home and we hope you’ll find it useful. Below are top 15 home decor mistakes that we think you should do your best to avoid. Marble is a classy material and the idea to make your kitchen look expensive is a tempting one, but you will regret the decision to install a marble countertop when the first scratches and stains appear. Consider a more durable material like quartz. So you want to create an accent and go fancy with the choice of sofa. 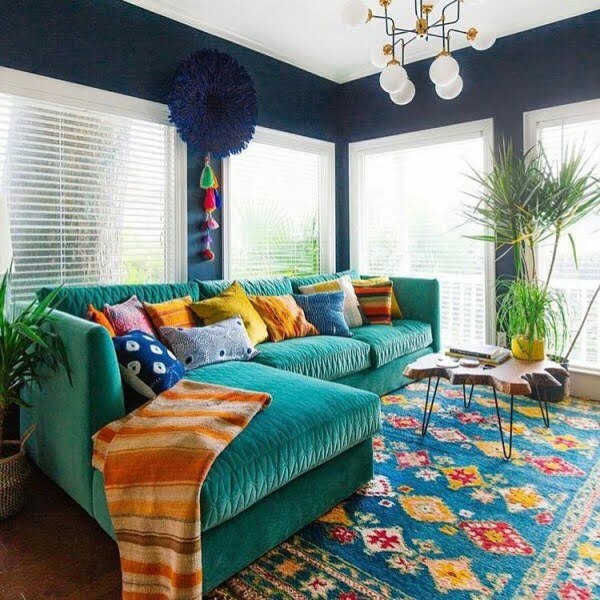 Colorful pattern explosion gives character to the decor, unfortunately, it’s very committing and you can’t switch the sofa as easily as you can replace accent throw pillows. 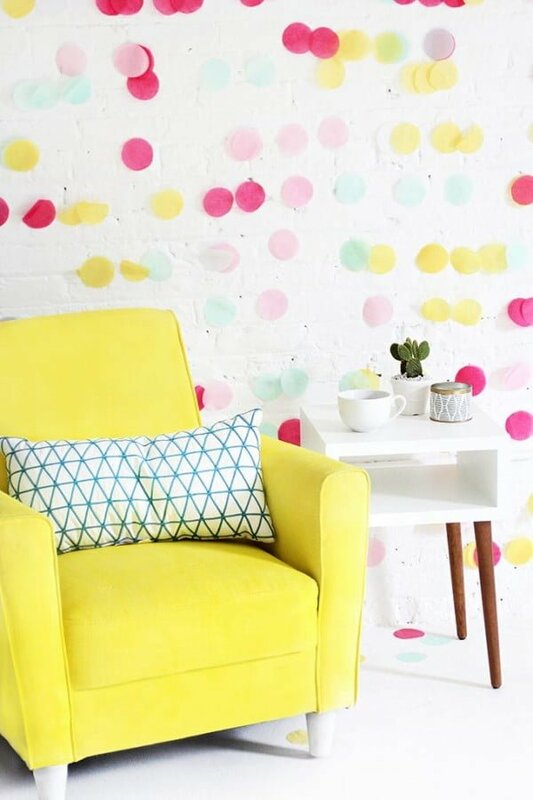 Being stuck with a vibrant sofa that’s becoming boring can quickly become an eyesore. We all have a lot of memories to share, pictures of people close to us that we want to see every day. But keeping that many pictures in a cluster on a surface quickly becomes a clutter and that’s just no good. Instead, consider creating a grid gallery on the wall and moderate the surface displays. Cables of the TV and electronics can add up to a mess very quickly and you should do your best to organize and hide that mess. 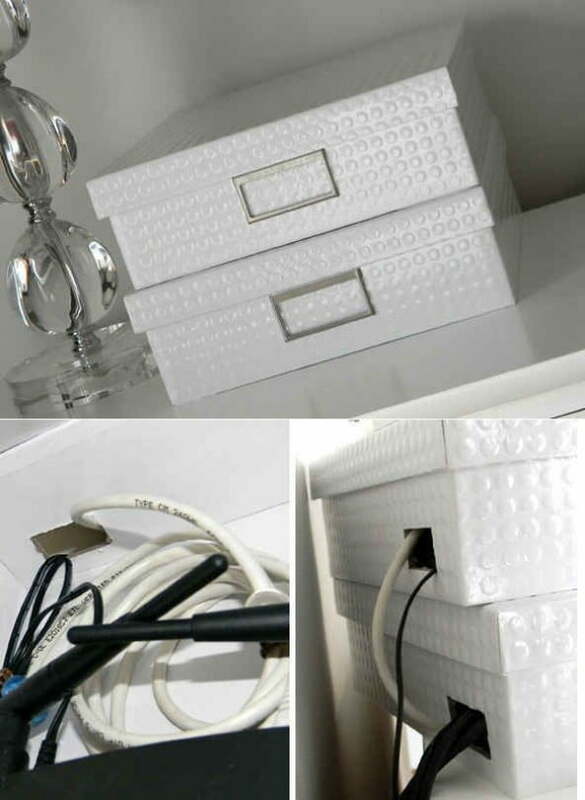 Read about how to hide the cords and cables in your home. 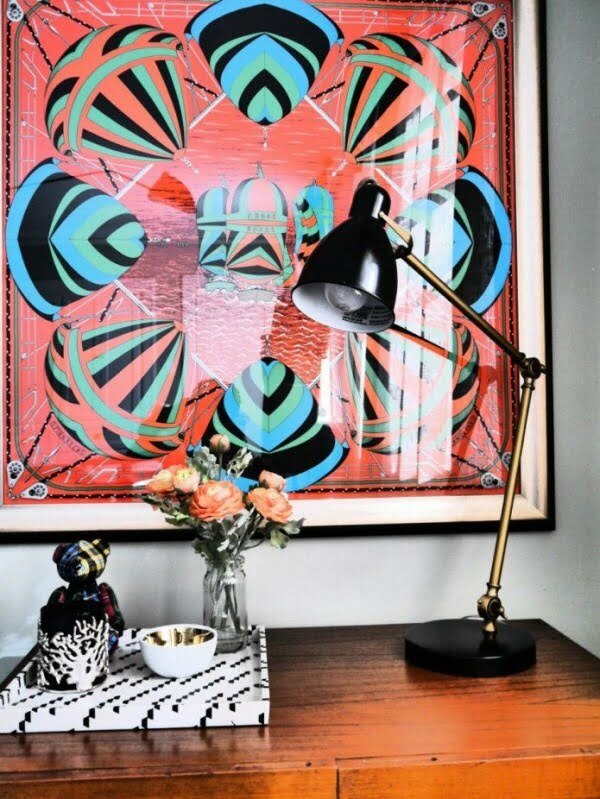 Your style may be eclectic and you may adore busy patterns but keep in mind that too many patterns that compete with each other make visually stressed decor that looks cluttered. Mastering pattern matching isn’t easy and we’re not saying you shouldn’t experiment to learn it, but begin with fewer patterns and soft hues. You don’t have to attempt to decorate your home overnight as if there’s going to be a photo shoot for a home decor magazine the next morning (unless it really will). The real home decor happens over time as you bring more things to your home and your ideas evolve as you live into it. You may find that cool looking vintage chair in your local flea market and you may get a good deal on it, but don’t underestimate the cost of reupholstering that it may take. White is classic and elegant, so it may be tempting to get a white rug or a sofa and give your room a striking clean look. Unfortunately, even if you don’t have pets or kids and you really keep your home clean, that white will wear out and get discolored eventually. Try to limit the number of white pieces at home. That piece of furniture looked good in the catalog and it may even look good at your home, but if it’s so uncomfortable that it becomes an item of display and nobody uses it there’s no point in getting it in the first place. Chasing trends is not the best idea for two reasons. For one, trends change and you may have to keep changing things up with them. And secondly, not everything that looks good in a catalog will look good at your home and you may end up with clashing pieces. That oversized couch may seem like the most comfortable idea but if you don’t spend that much time crawling up to watch TV it will just be this big piece of furniture that takes up so much space. Pick things that you will actually use, don’t buy into just the idea of them. Getting some houseplants for your home is a good decision but you have to do your research first. You don’t want them to die on you because your home doesn’t have the required conditions. There’s a big community of DIY home projects and a countless number of ideas to try. The tutorials make it look easy but you may find that it’s more complicated than it seems when it goes wrong and you end up with something horrendous. Worse yet if you invest so much time into it that you don’t have the heart to throw it away. You have to decorate the walls but don’t resort to a random piece of art. What you hang on your walls must have a meaning, be it something personal or at the very least complementing your color scheme. 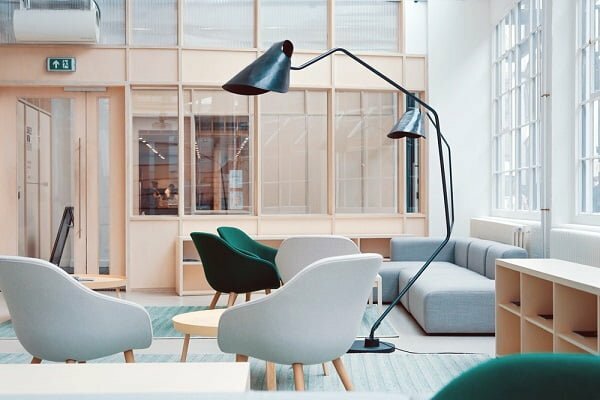 Professional interior designers see the strangest of interiors every day and besides the most obvious decor mistakes, they see more subtle things that an untrained eye might not even notice. While these mistakes aren’t big, avoiding them can improve your home decor in a sophisticated way. How much is too much? 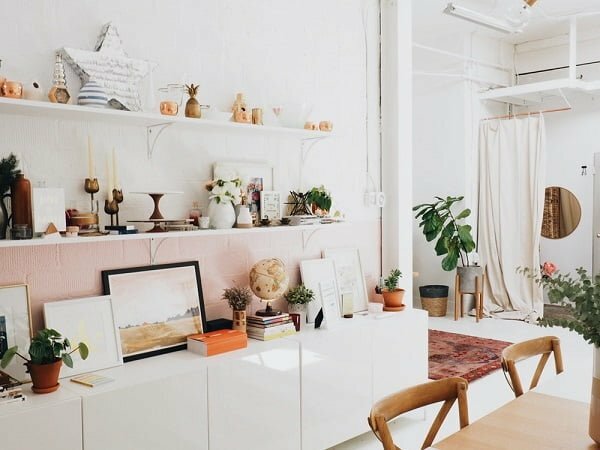 If your home decor uses every inch of the room space and it looks like it might be suffocating, you’re probably overdecorating. A good interior makes use of pauses that direct the eye in a natural way without being overwhelming. Likewise, too much of the same material will look overwhelmingly boring even with enough negative space. Try to mix it up a bit and add furniture with different finishes. Use a tiny rug and you make your room look much smaller than it is. Using a small rug in a small room is the biggest mistake to make, even though you might think otherwise. Taking risks can lead to mistakes too, but playing it safe is a mistake in its self. Do at least one risky thing in your home decor, be it a whimsical decor piece, a trendy piece of furniture or painting a wall in an accent color. While some variety of furniture is necessary, using an over sized couch with a small arm chair is totally off. Try to keep the scale of furniture similar without much contrast, keep accents to patterns, colors, and materials. It’s rare that all classic or all modern home decor will work in real life. It’s just plain boring. Instead, mix and blend styles to make your interior look well collected and established over time. Trying to make your home look too pretty in the expense of functional and comfortable design is a big mistake that can go unchecked. If your vignettes take so much space that there’s nowhere to put a drink, you’re probably doing it wrong. Negative space is very important in aesthetic design so be sure to use it. Don’t feel the need to decorate every single corner and free space in your house, leave some space empty. As already mentioned above, decor pauses are essential. The living room might be the main room of your home, but that doesn’t mean you should bring everything you have and put on display in one room. Decorate all your rooms equally. Definitely the number one cause of discomfort at home is bad room lighting. It’s especially true if recessed lighting is all you have to light up the space. An easy way to tell if it’s not good enough is to look for shadows made by furniture and other pieces of decor. 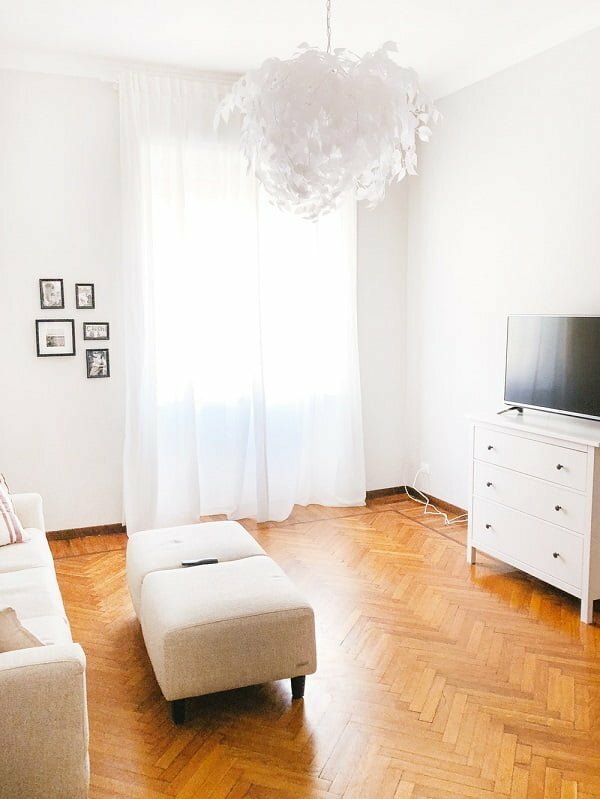 Think in terms of layered light to solve this problem, get a few table or floor lamps and experiment with positioning them for extra lighting layers below eye level. Every year we get new trends of choice and to be stylish you may pick up one or two decorating ideas over time. But each year it adds up and different ideas clash, after a while some of these ideas may not seem that good anymore at all. If the thought “what were you thinking?” crosses your mind now and then, get rid of the gimmicks. Does your furniture block access to some areas of the room? Is there a clear path that follows to the doors? Without a convenient flow of furniture the place may look closed out and definitely uncomfortable. Experiment with different furniture arrangement with this in mind. Clutter is always stressful and nobody feels comfortable in an untidy place. 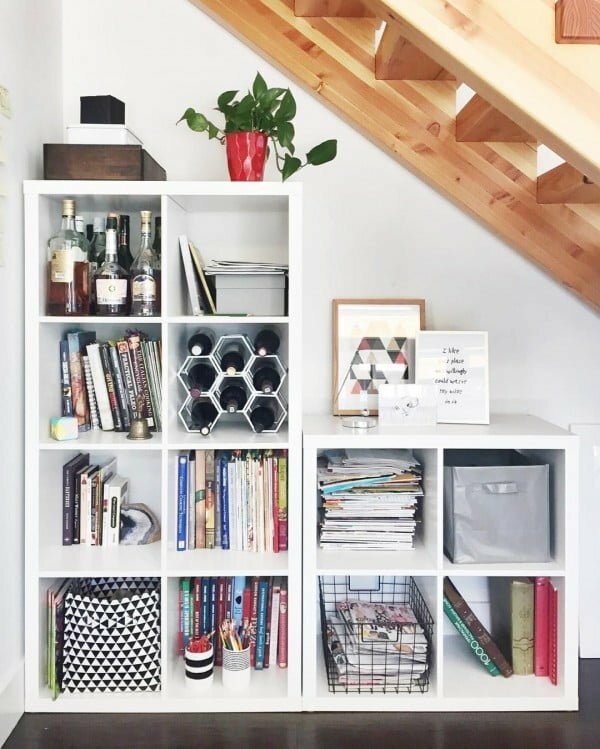 It may be hard to avoid with a lot of small but useful items lying around, so get several attractive baskets and create drop zones around your home. This will help you cut down the clutter significantly and it will look good. Painting a room is a committing project so you may be quite tolerant about the current colors. However, do pay attention to how the current color scheme makes you feel. 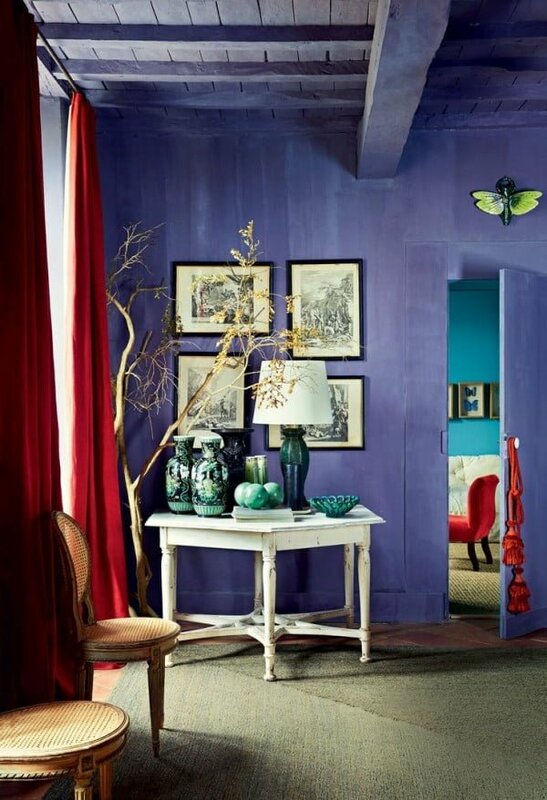 Dark or vibrant colors add character to the room but what good does it make if they make you feel uncomfortable? So you’ve heard that leaving walls empty is not a good taste of home decor. However, your home is not an art gallery, so why would you want to dedicate a full wall for art and pictures? Keeping wall decor subtle may be not as striking but it is certainly comforting. 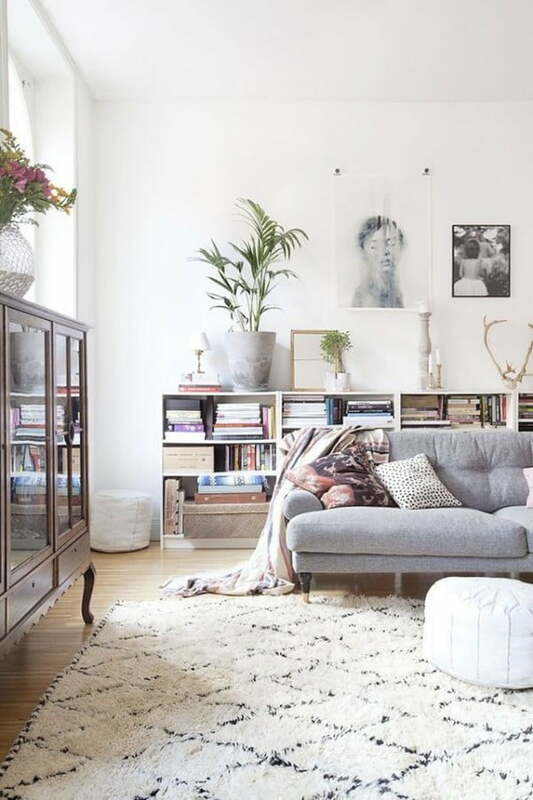 Getting more throw pillows for the sofa and chairs may be the go-to decorating technique, but stacking too many of them will make the place look cluttered and overdecorated more than anything. Keep just a few floor pillows around and stash the rest away, change them up regularly instead. In this day and age, it’s hard to imagine your life without electronics so no wonder your home is full of them. A phone here, a tablet there, and chargers everywhere. If you feel like you’re going to flip out if you stumble on another cord of a charger carelessly lying around, get yourself a charging station. Organize all advanced gadgets in one place and make it part of the decor. If you have to look up to see a picture or a mirror, it’s probably too high. Pictures and mirrors should be hung at the center of the wall at about the eye level of an average person. If you hang them too high, they look out of place and destroy the integrity of your interior design. So find the center of the wall when hanging your pictures and mirrors. This mistake is more common than it should be. For some reason people hang drapes just above the window and it is just wrong. Remember, drapes decorate the wall, not the window. So you have to hang them just below the ceiling, or if your ceiling are too high, at least a foot above the window. Correctly hung drapes make the ceiling look higher and the space bigger, while hanging them too low makes them stick out in an uncomfortable way. Sometimes it seems that some people are building a dance floor, not a comfortably and tastefully designed room. Don’t push all of your furniture to the walls and leave the center space empty. Your home is not a warehouse and unless you really need that room for a dance floor, simply don’t do it. Move furniture around, find a balanced layout. It’s an easy mistake to make and overlook especially when you have a lot of pictures or various collectibles to show off. A lot of even size accessories make the decor look uninteresting and boring, in other words, it becomes a distasteful clutter. So add some accessories of varying size for balance, make it pop so that it attracts attention in a good way. Don’t get me wrong, walls can be white but only if that’s the style you’re going for. Perhaps you’re going for a clean modern look, or you have accents in your decor that pop in a white background. But if you just leave walls white because you can’t choose a color, that’s a huge mistake which destroys you entire interior design. Look for ideas and paint those walls, wallpaper them, make murals or wall art but don’t leave them blank. Decorating your home can sometimes become a daunting task because you can get lost in measurements, styles, and other decor choices. Then you can either begin researching your problem online and experimenting or getting help from a professional designer. 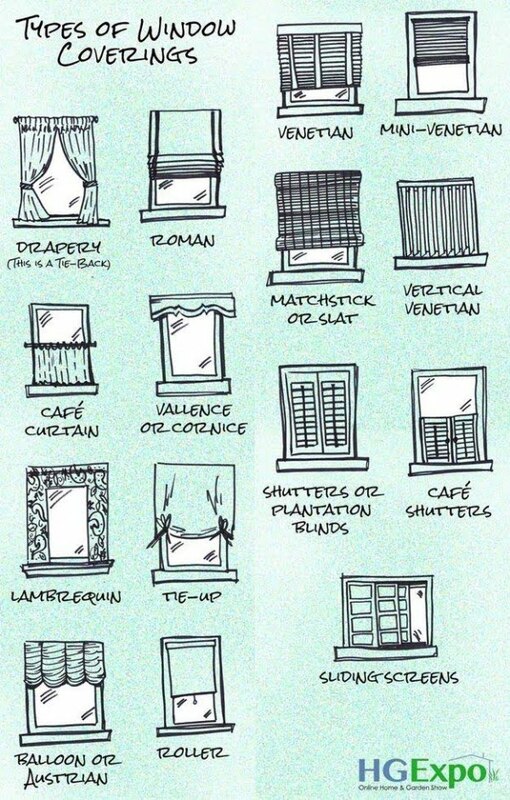 To avoid all that hustle, here are 20 home decor cheat sheets for you that you can keep handy to turn to whenever you face a decor problem. These cheat sheets and guidelines will put the most common home decor rules in simple terms, which will help you decorate your home almost like a real interior design professional. Feeling a bit lost in the world of interior design styles? Use this guide as a map to the most popular design styles. This cheat sheet provides the most common home measurements and takes out all the guesswork. Make sure the space above sofa isn’t left blank by using these wall art hanging guidelines. 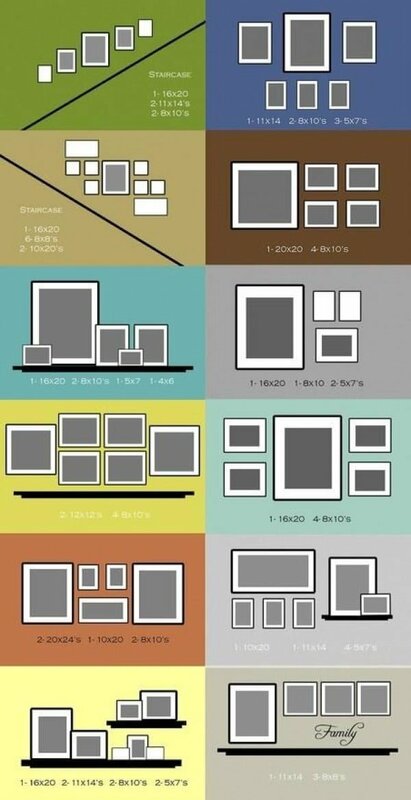 Creating a gallery wall that looks good is not easy, so here’s a diagram that will help you in many different situations. A mantel is the perfect surface for display items and vignettes but when you begin arranging multiple things it can be a challenge to make it look right. Use this diagram as a reference. Having trouble arranging living room furniture? These layouts will help. Creating a picture gallery in different places has its quirks. Refer to this diagram for ideas. 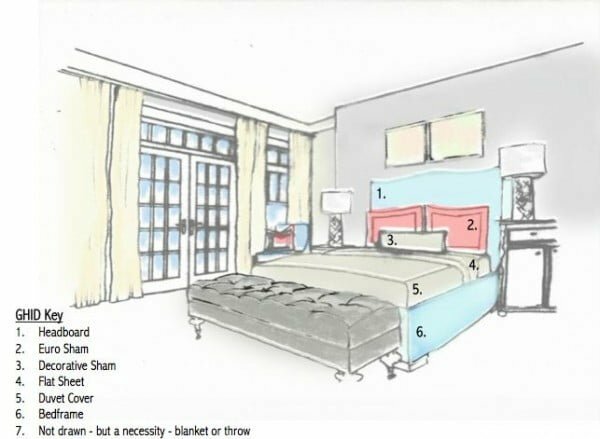 Take a look at this drawing before deciding on your window coverings – there are a lot more of them that you might have imagined. 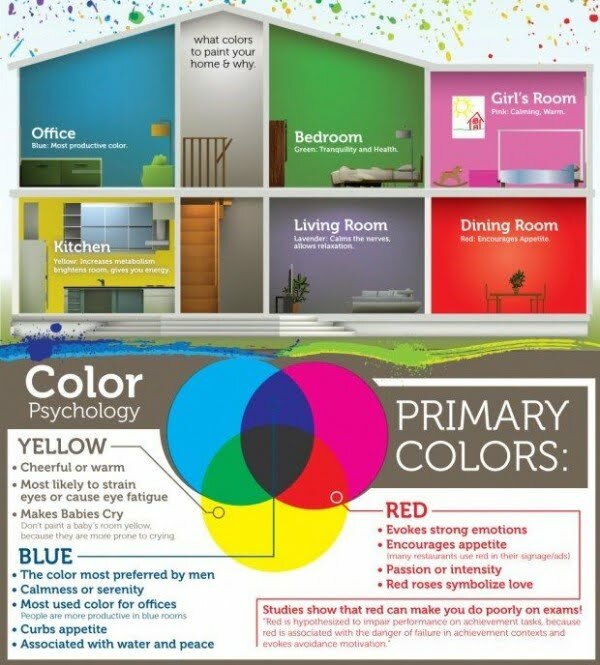 The choice of colors is a complicated subject but this diagram will help you choose the main colors for different rooms based on their psychology. We’ve already talked about keeping houseplants alive, and the first step is choosing the right plants. Refer to this diagram for the most common houseplants. Following the principles of Feng Shui in home decor can be a daunting task, but this diagram will make the process a lot easier. You didn’t think you can just throw pillows randomly, did you? Here’s a quick guide to determine the print size for a typical setup. 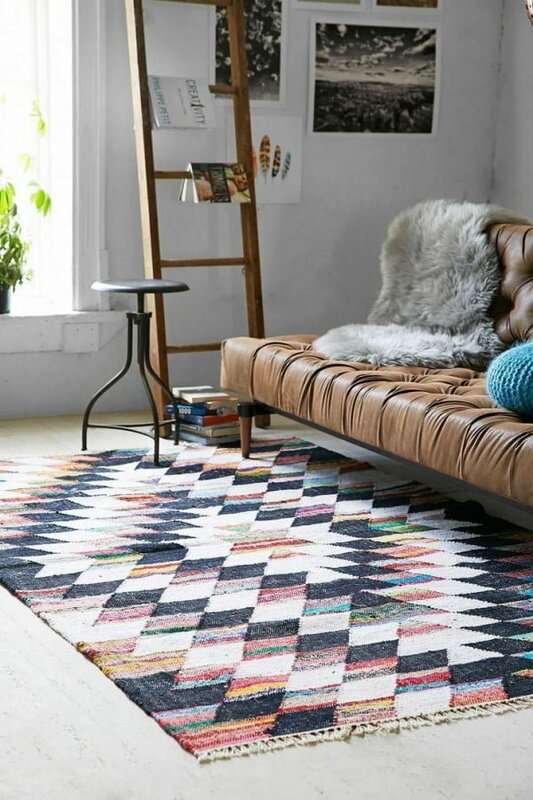 Never make a mistake of choosing the wrong rug for different rooms again. This diagram shows the correct way to make your bed. Vignettes make great accents and here’s how you can make a basic one. 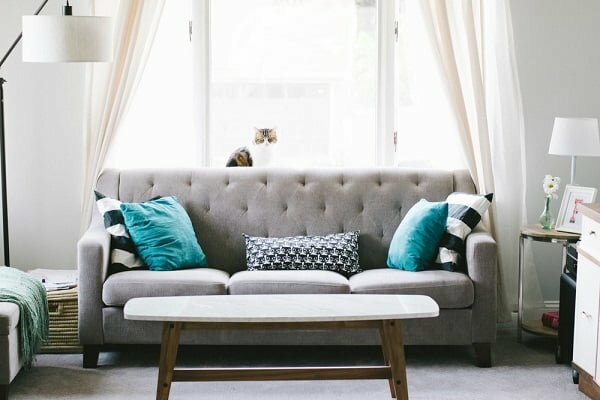 One of the biggest home decor mistakes made is with hanging the curtains. Refer to this drawing to never hang them at an incorrect height again. Create a sofa style like a real interior designer.